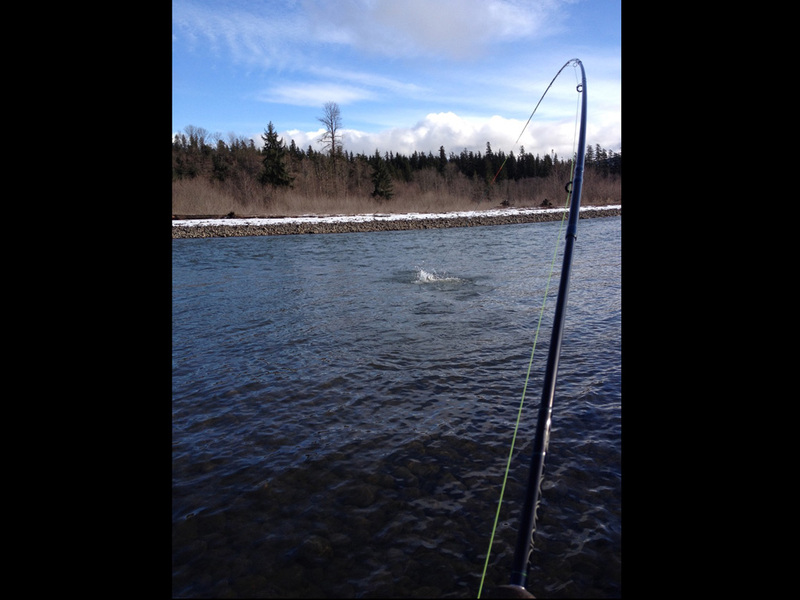 So far we are experiencing relatively mild winter temperatures. 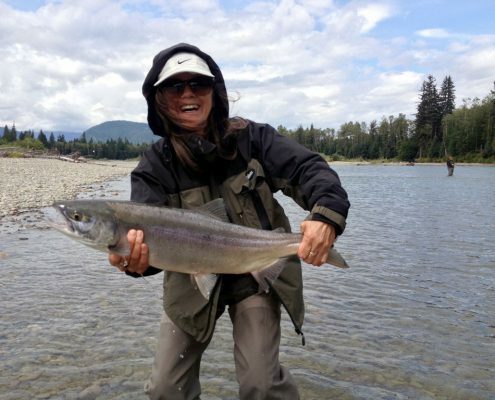 This has been great for our guides who can’t seem to stop fishing! 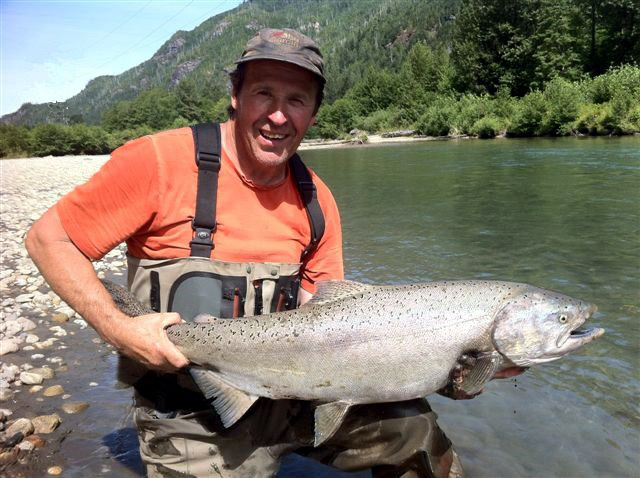 Only a few short months and we are into the spring Steelhead season. 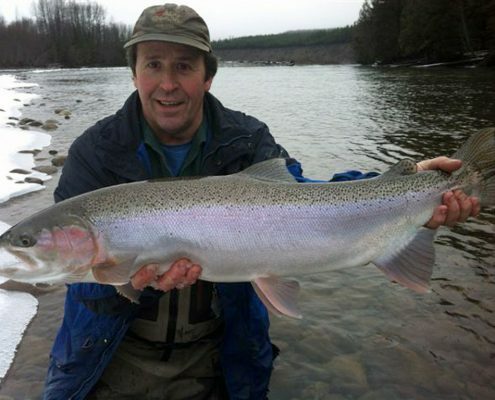 This is a great time of year to get on the water and bring in the spring with fresh chrome Steelhead. 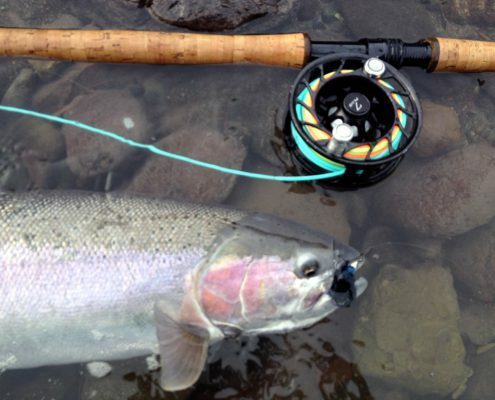 Why wait until summer to test your skills against these superb fish? 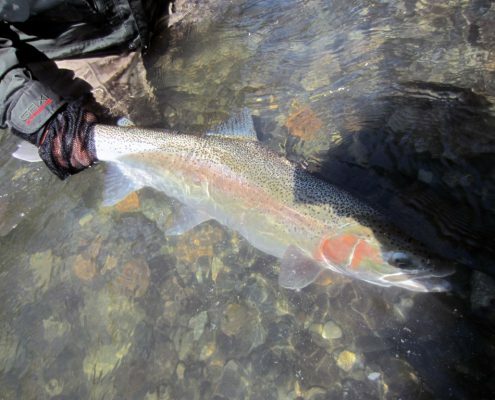 Good runs of trout hunting emerging salmon fry just add to the experience. 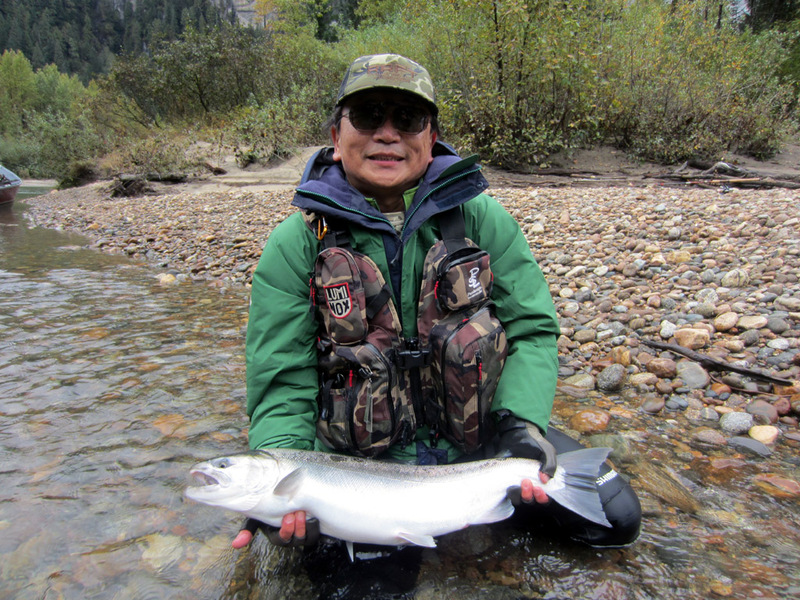 Although our guiding season for the year is over, our guides are still out fishing. 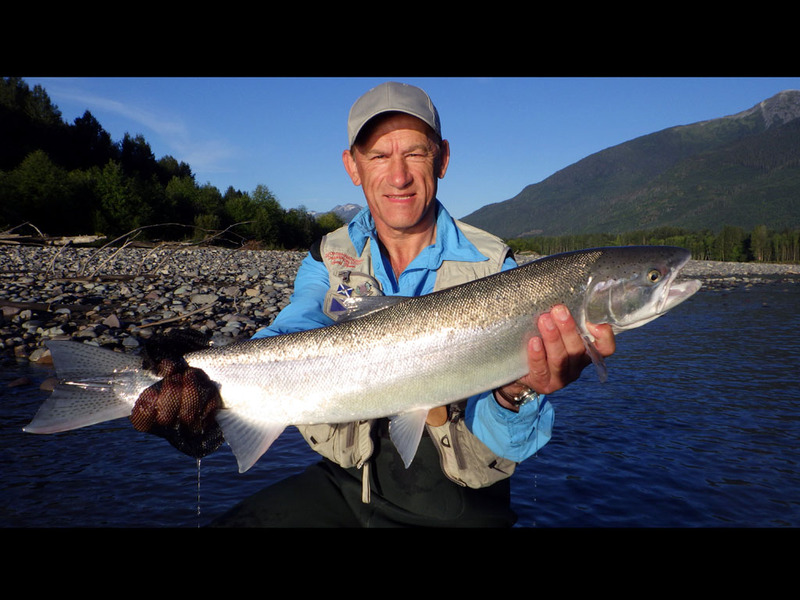 As our guests know, Kalum River Lodge’s guides are passionate anglers and as such they are out on the rivers fishing all year round. 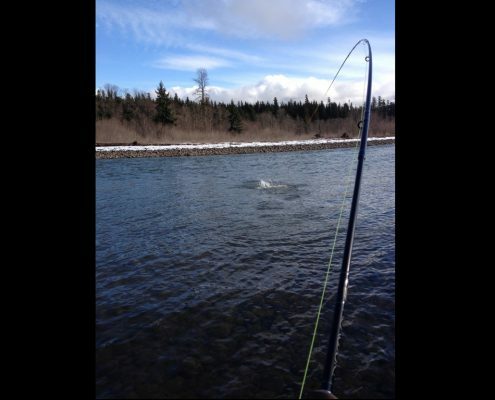 Here are a few photos of what they have been catching! 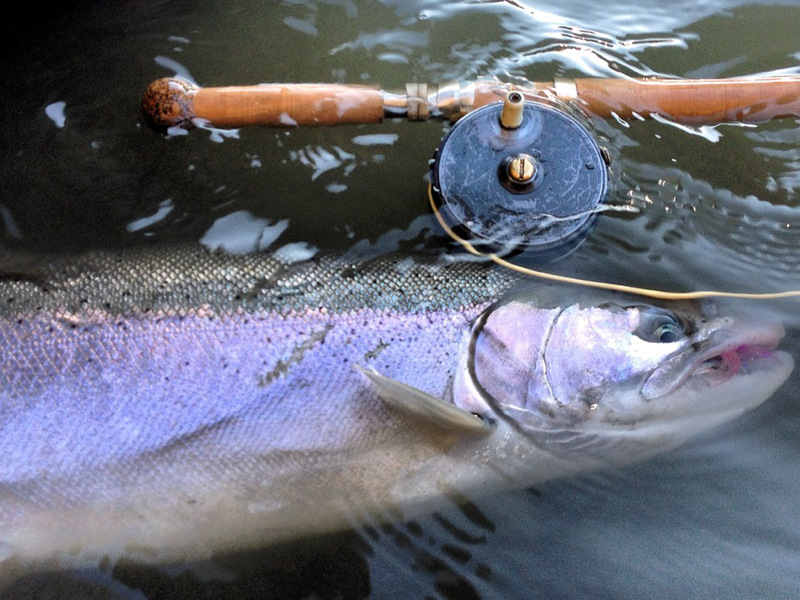 Another fishing season has come to a close. 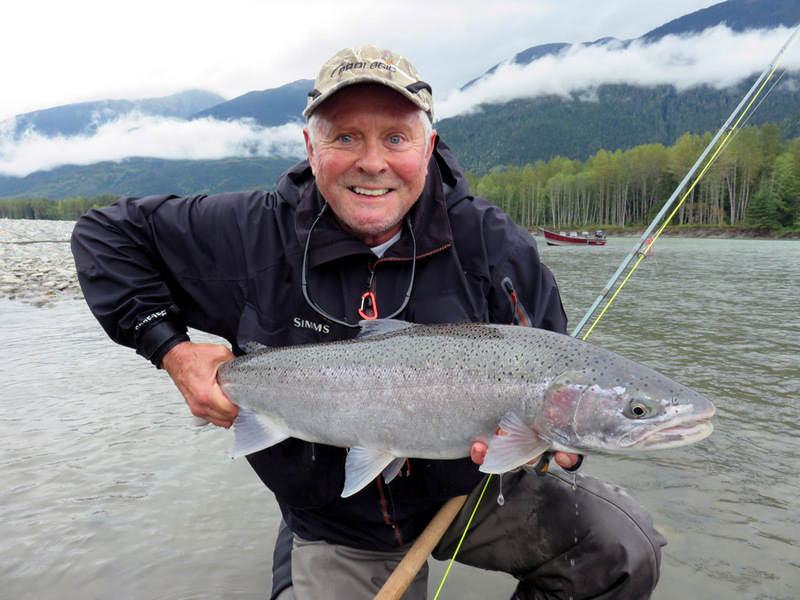 Once again, a big thank you to all our guests for making 2015 an exciting and memorable year. 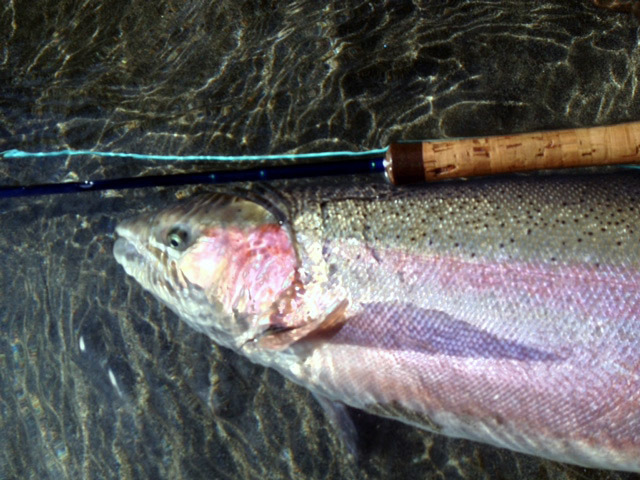 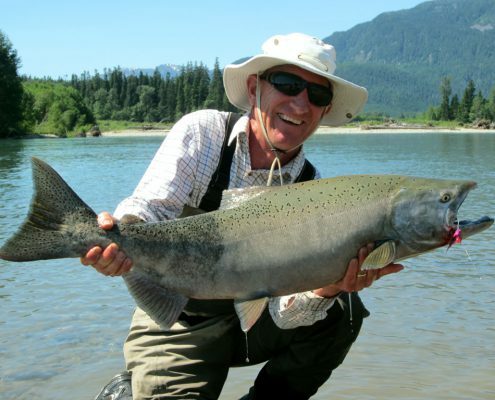 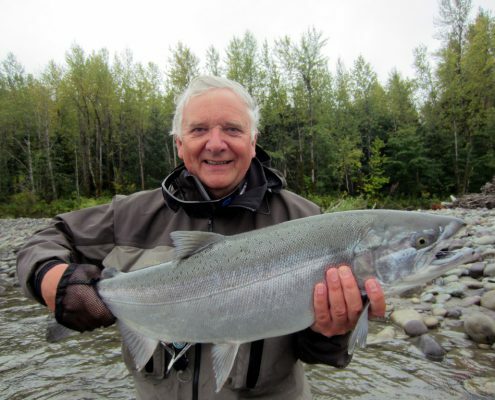 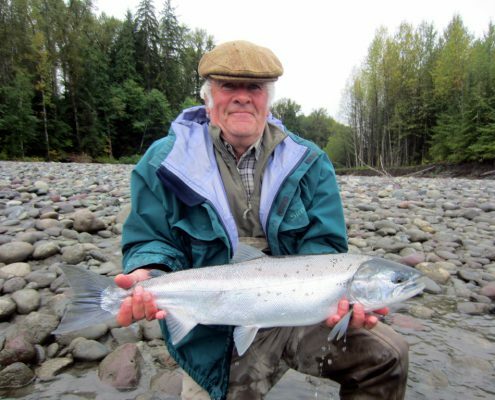 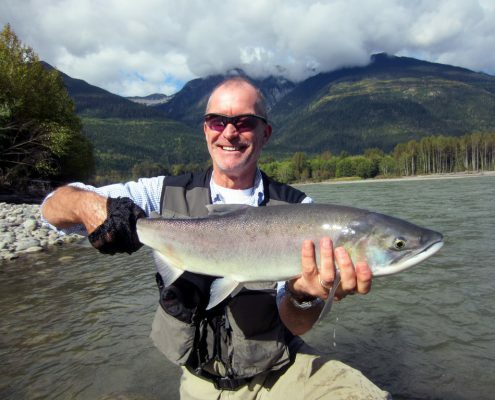 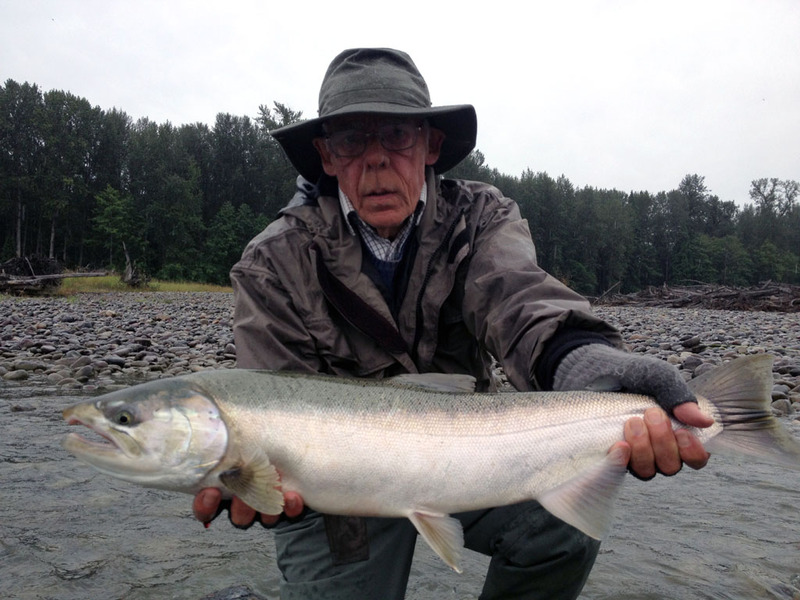 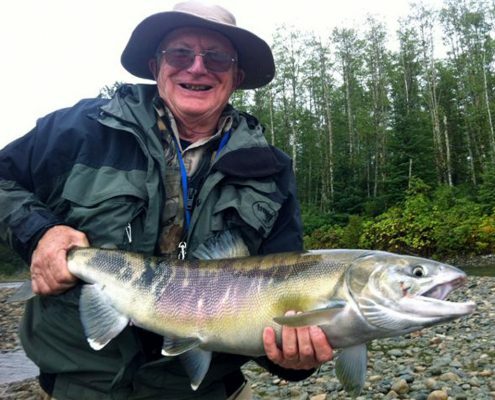 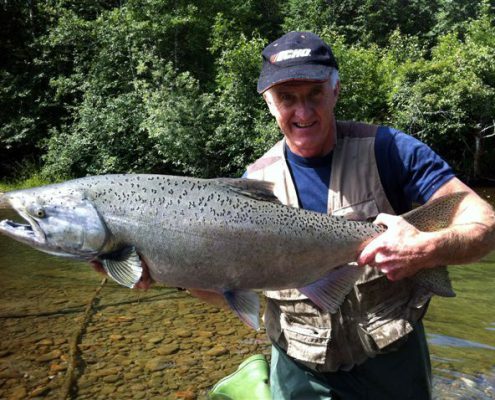 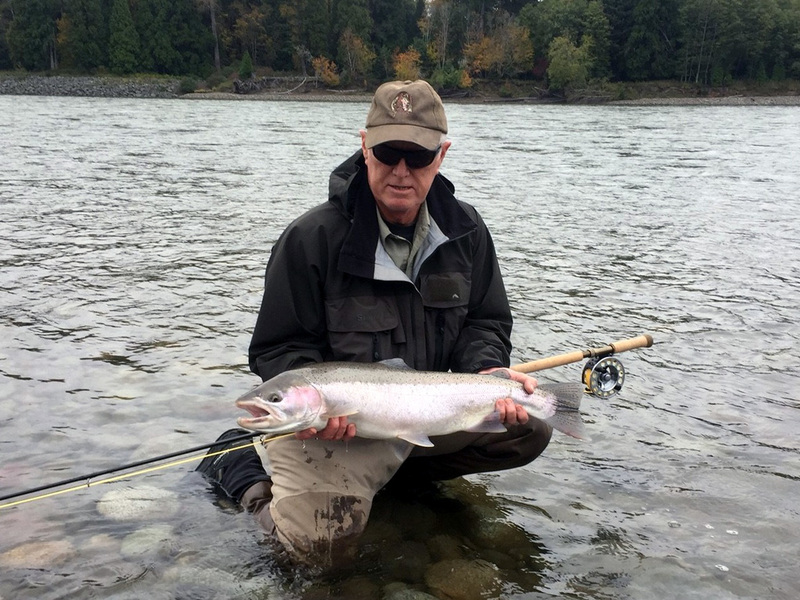 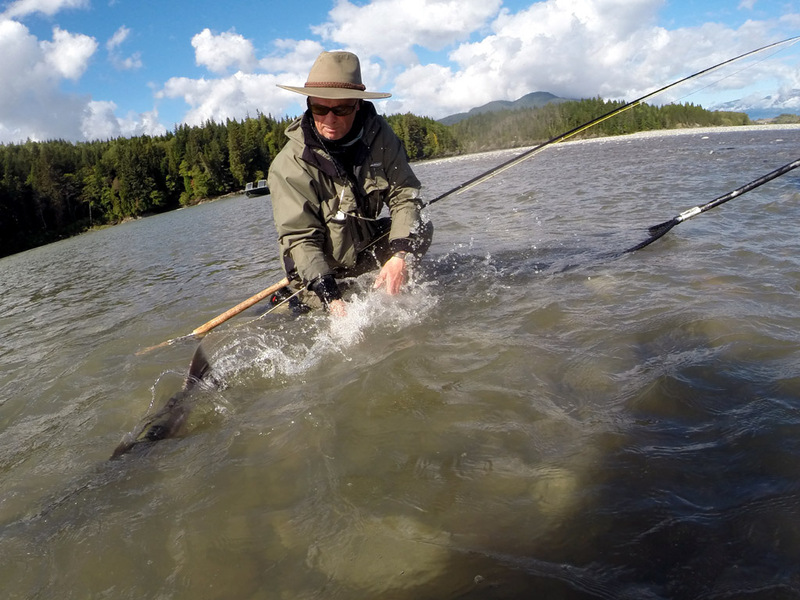 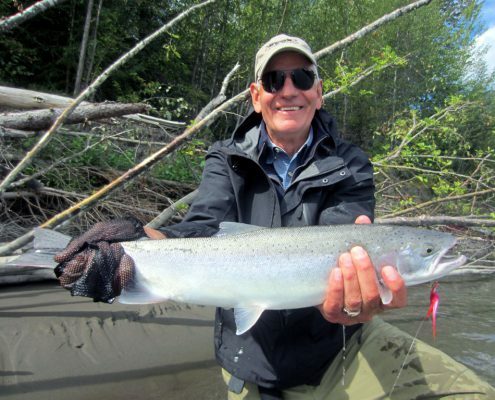 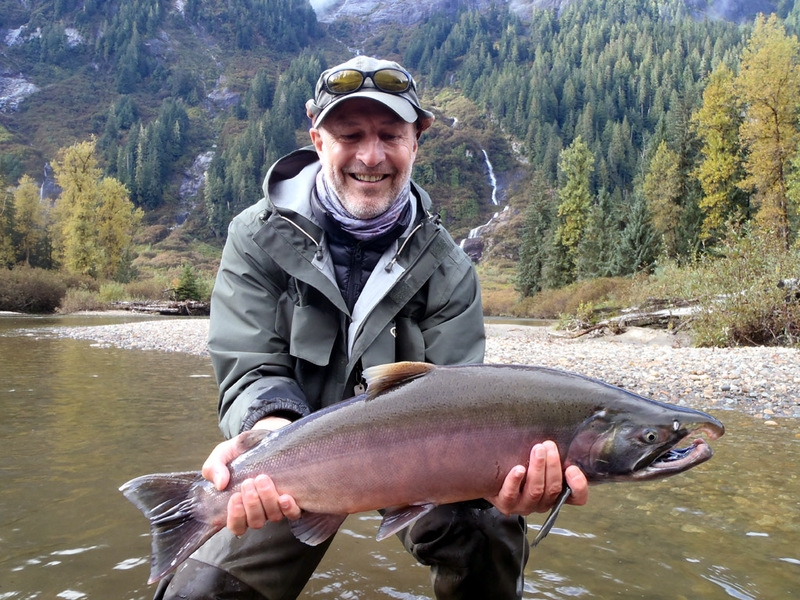 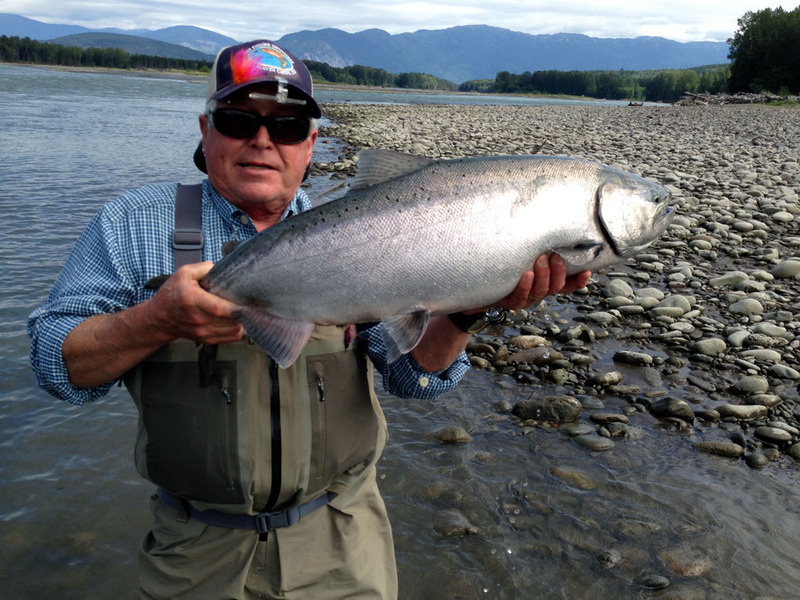 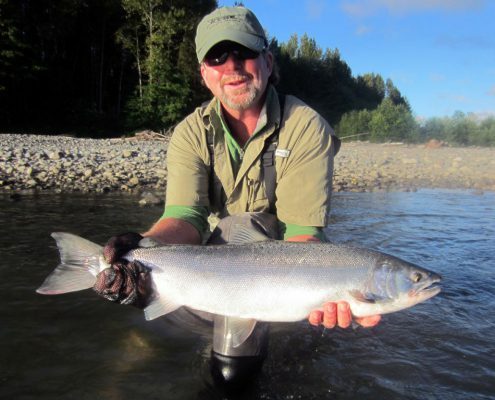 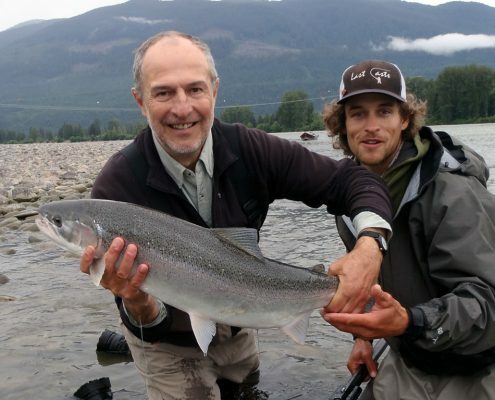 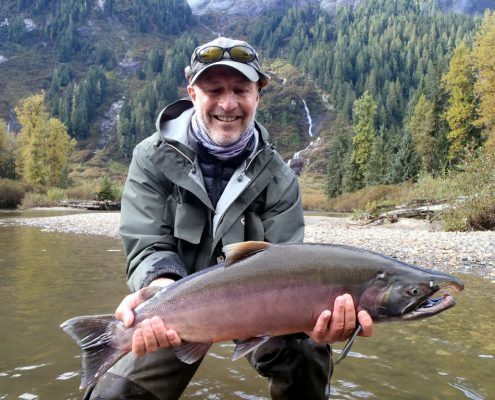 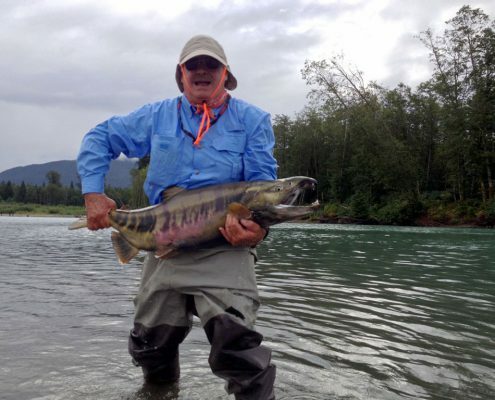 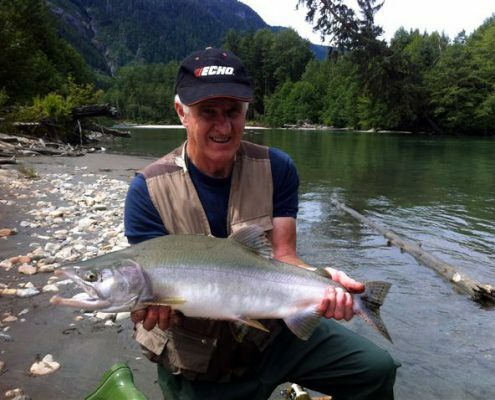 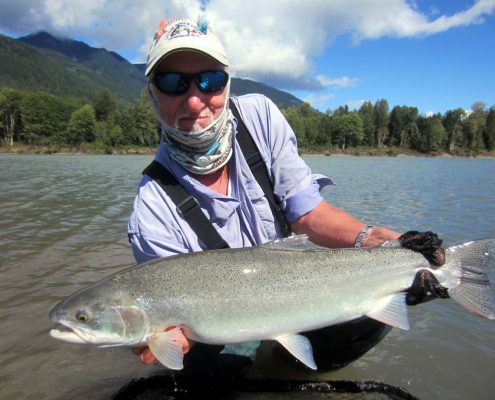 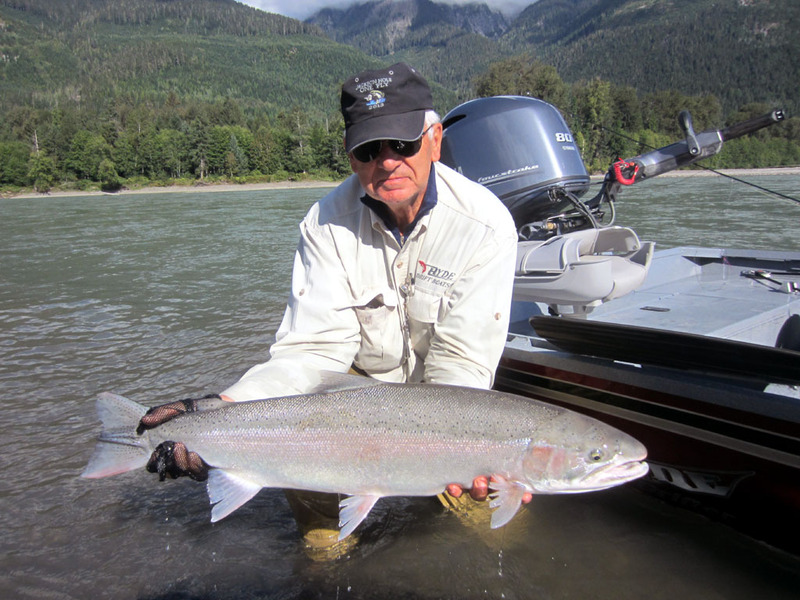 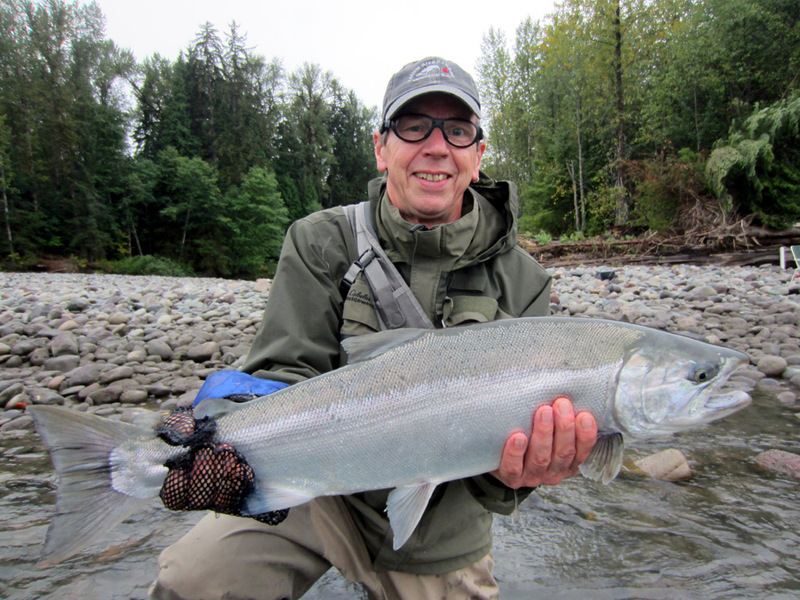 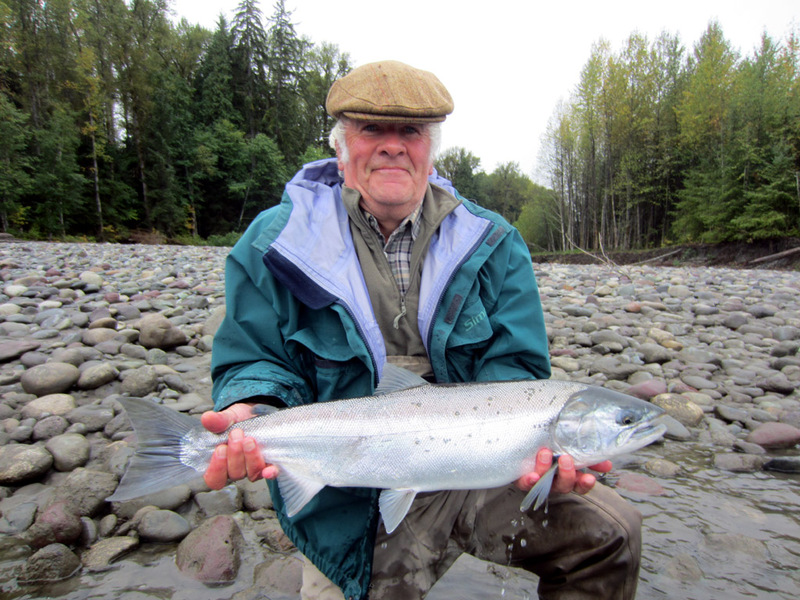 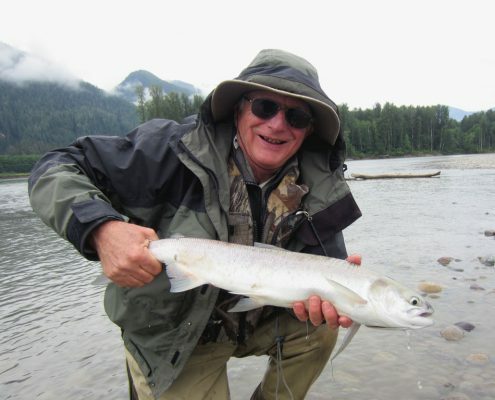 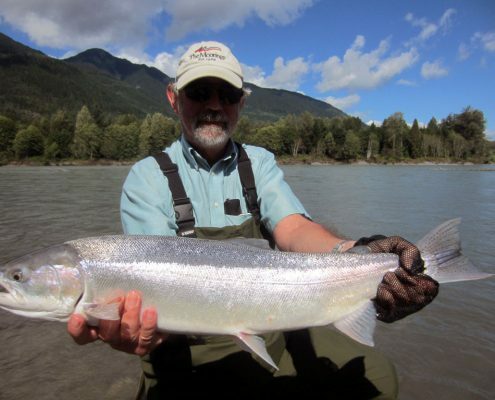 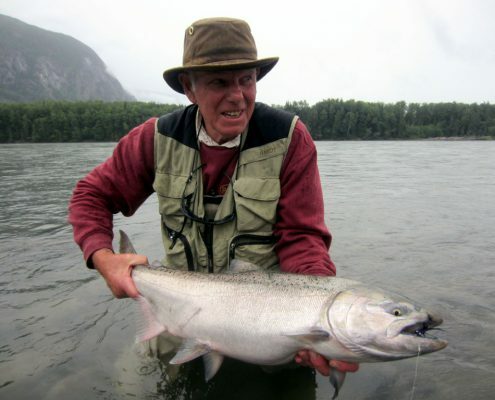 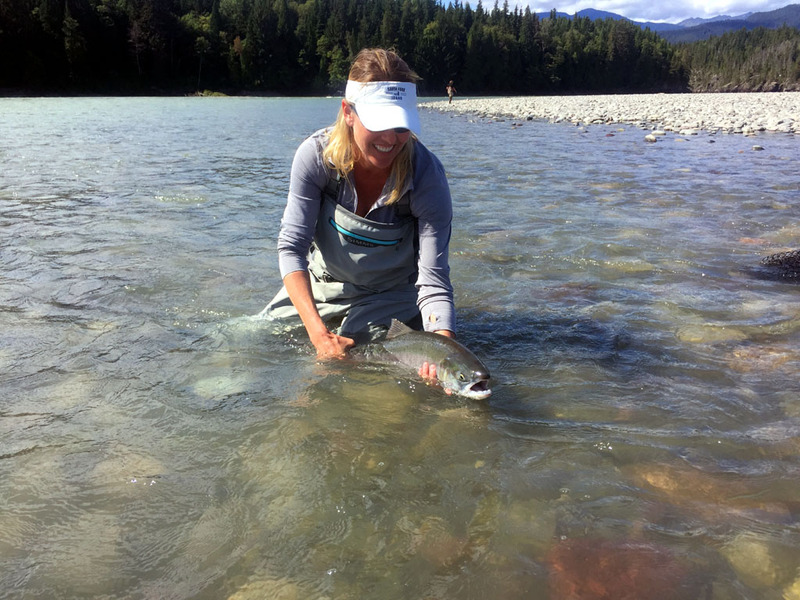 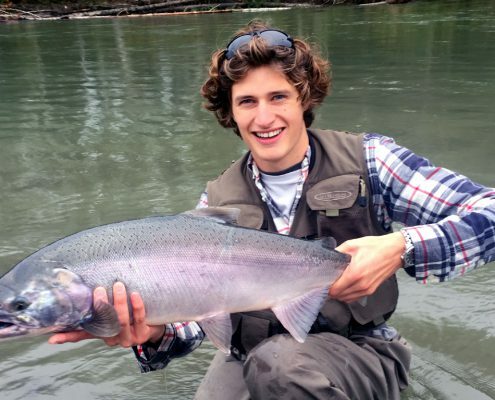 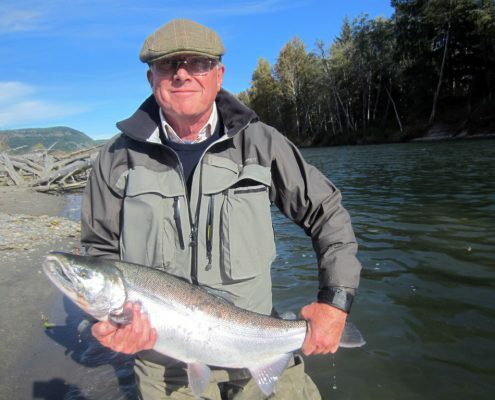 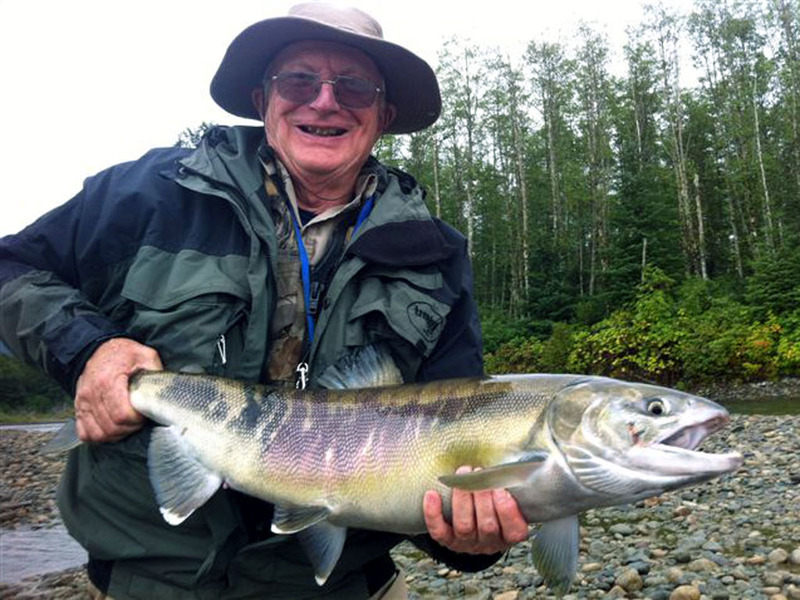 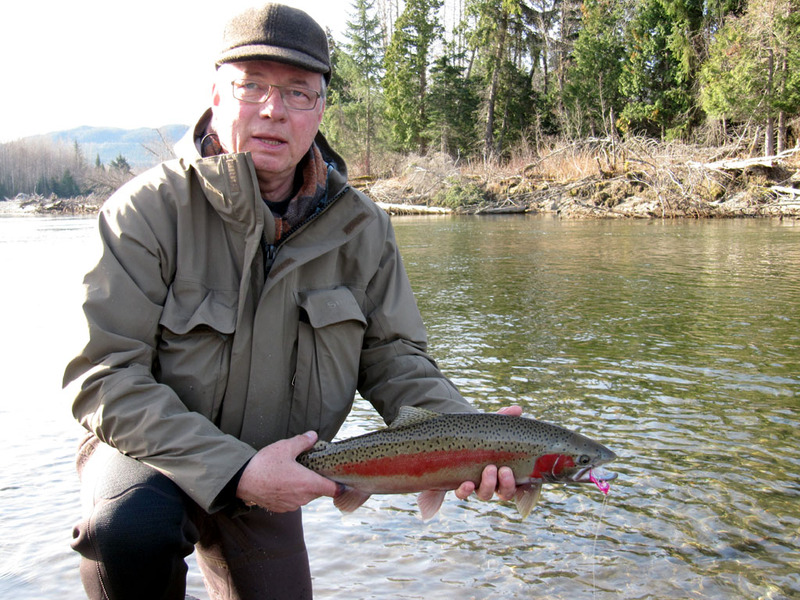 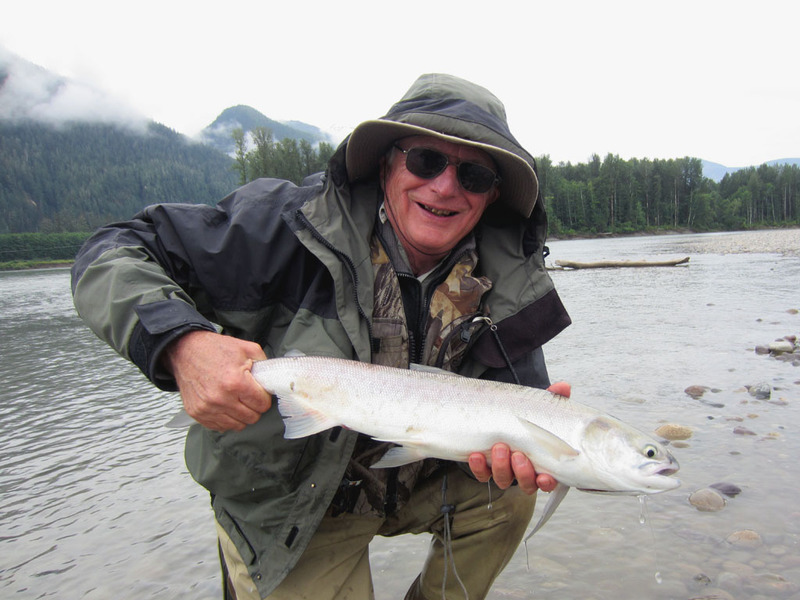 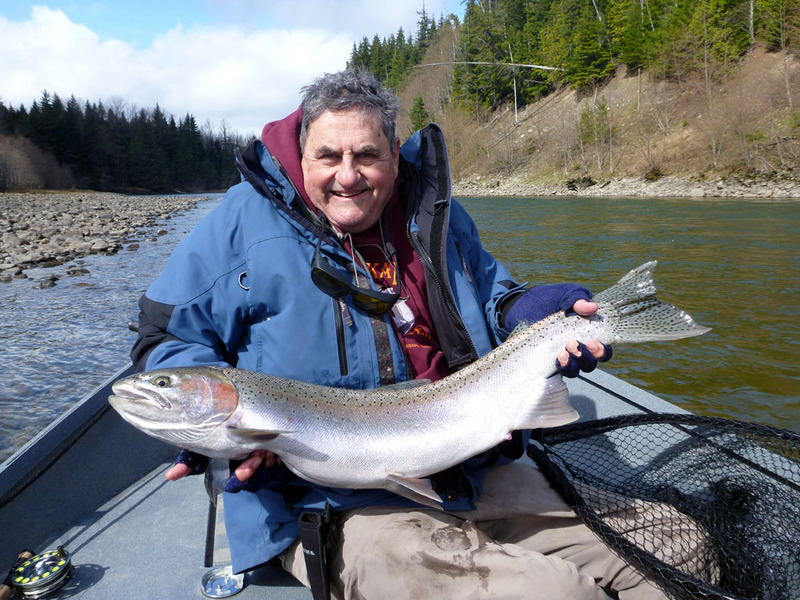 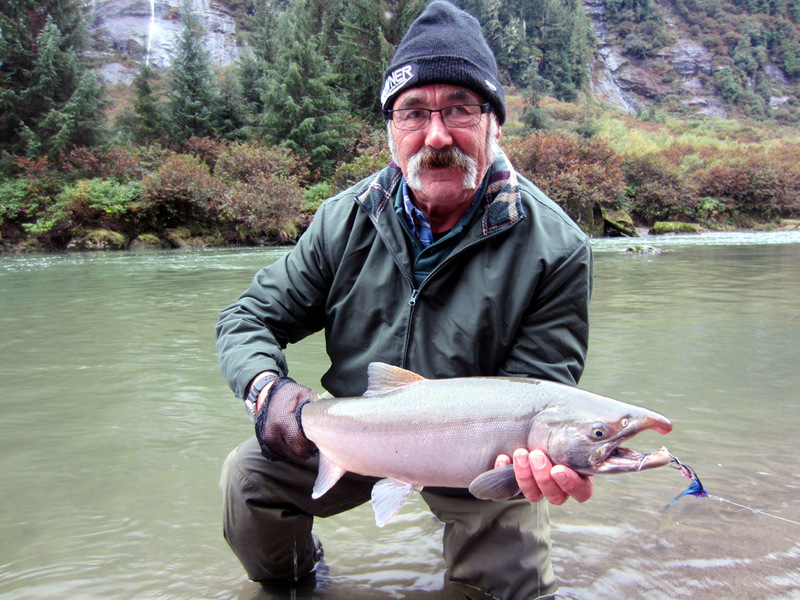 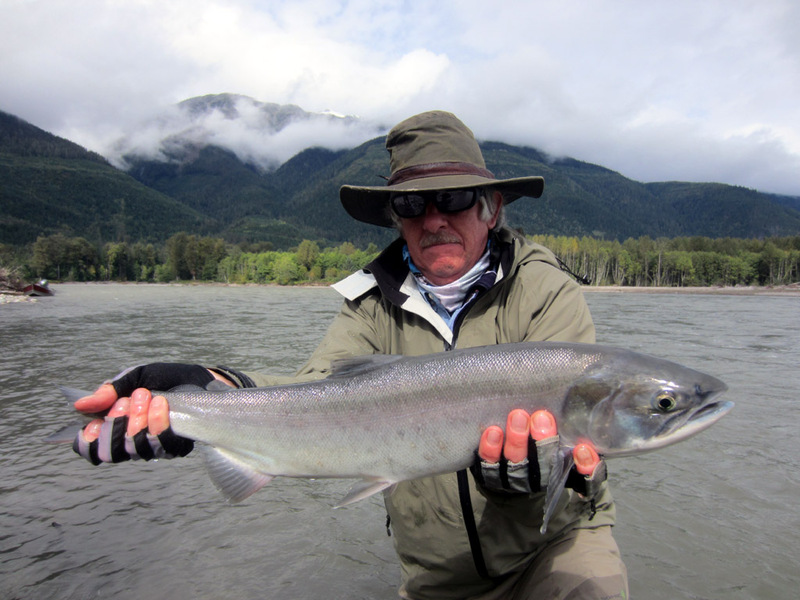 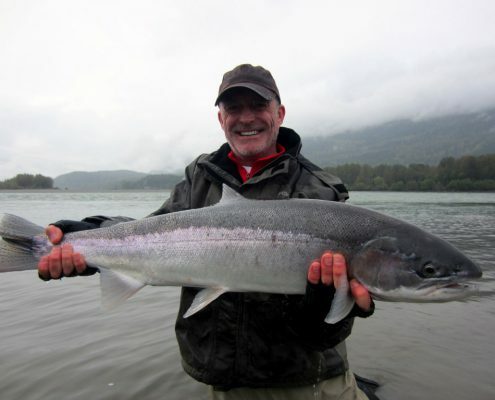 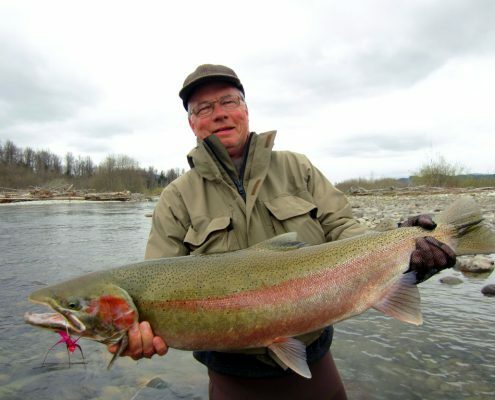 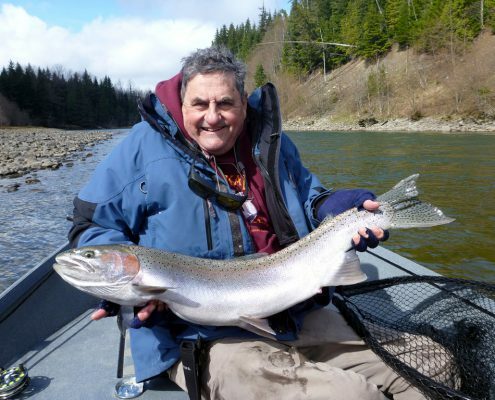 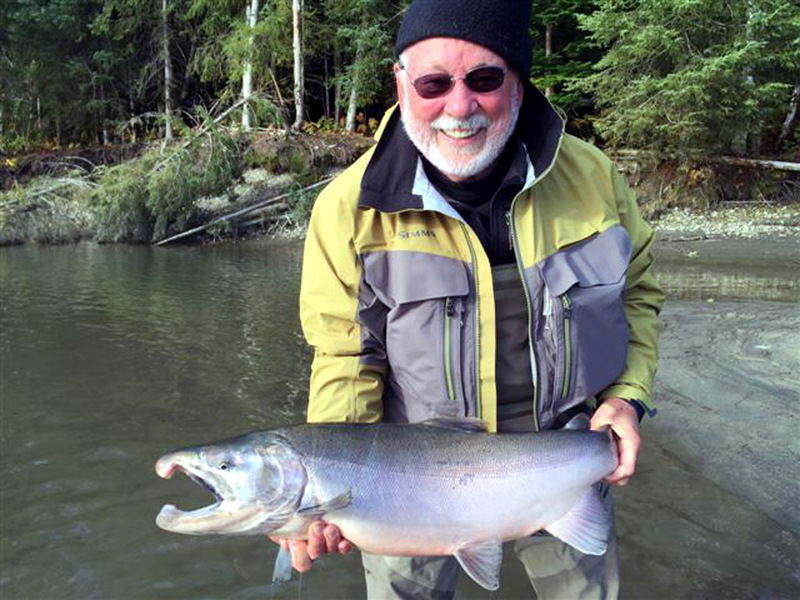 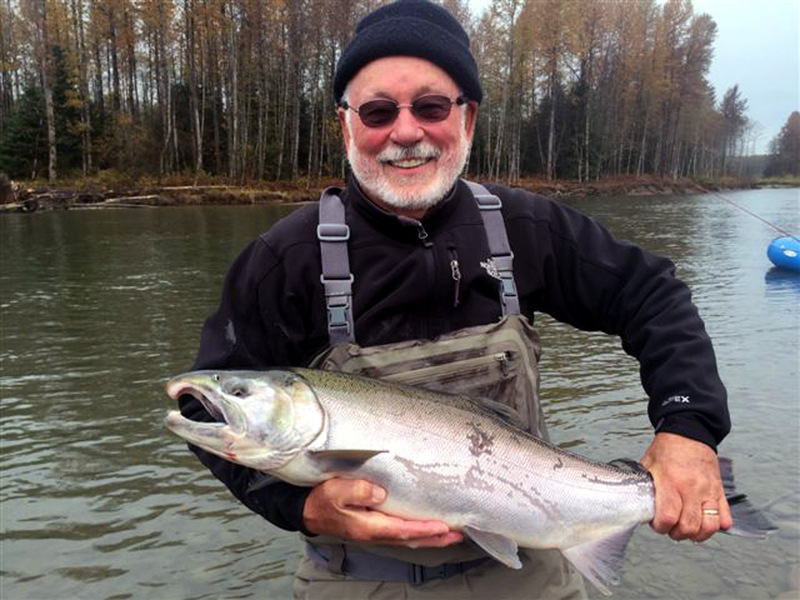 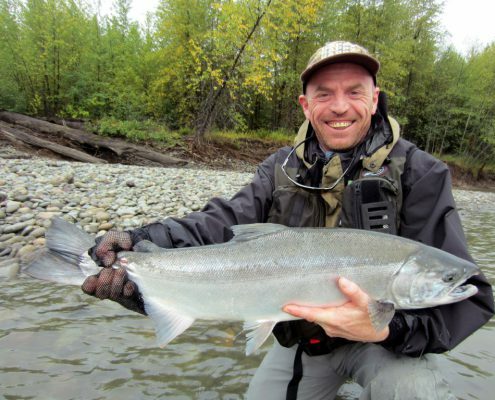 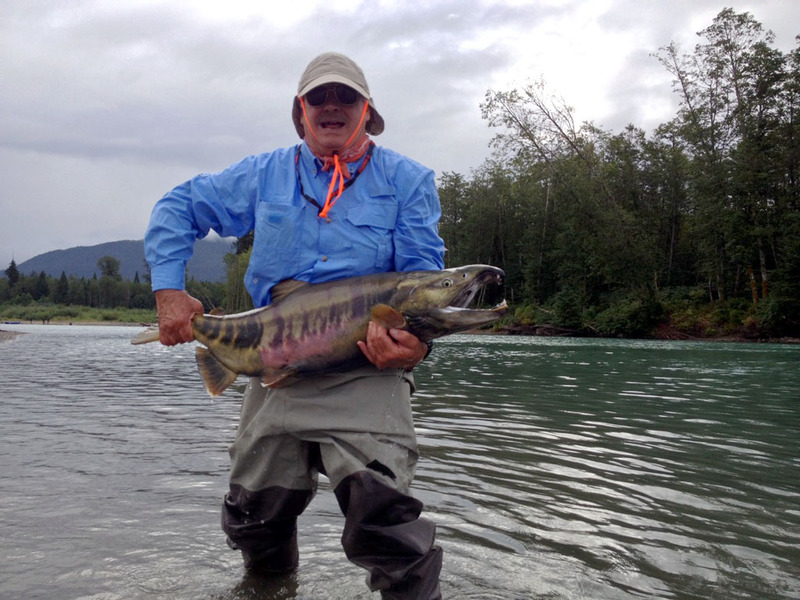 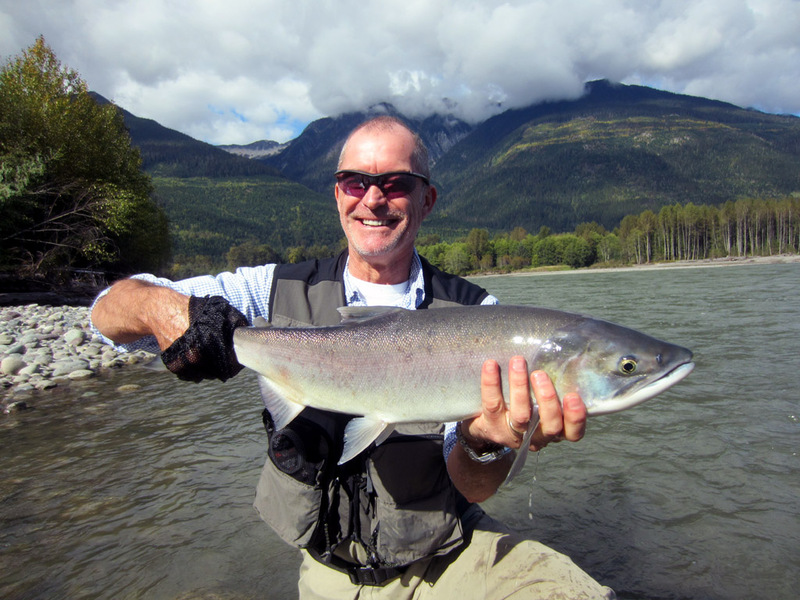 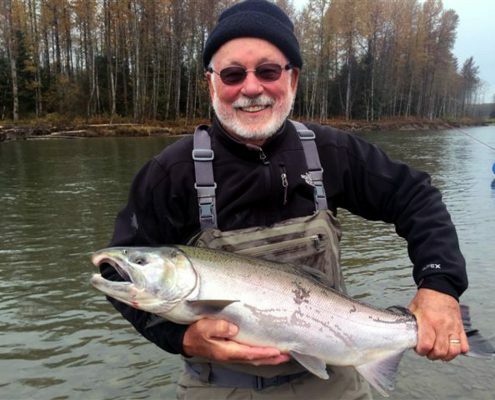 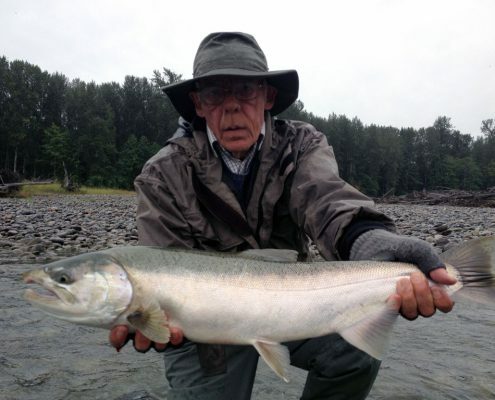 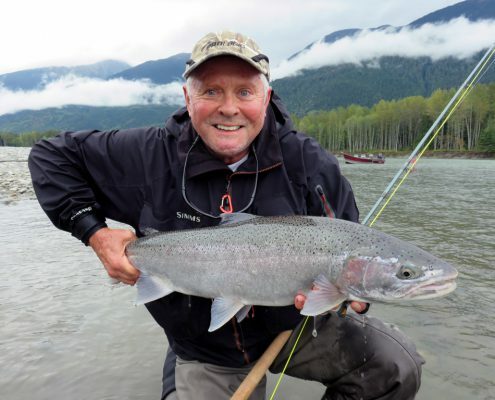 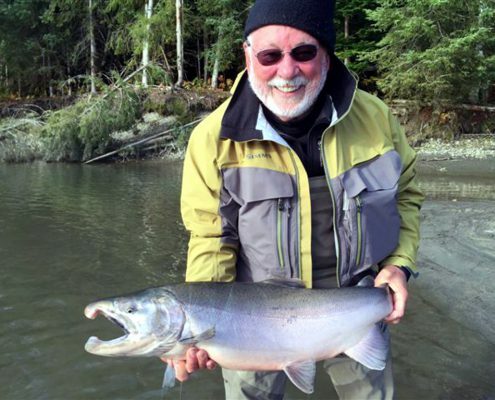 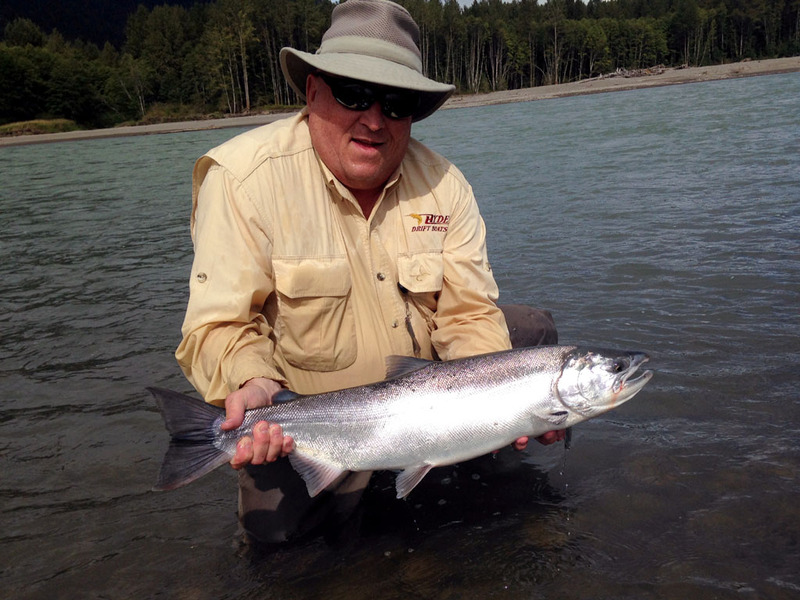 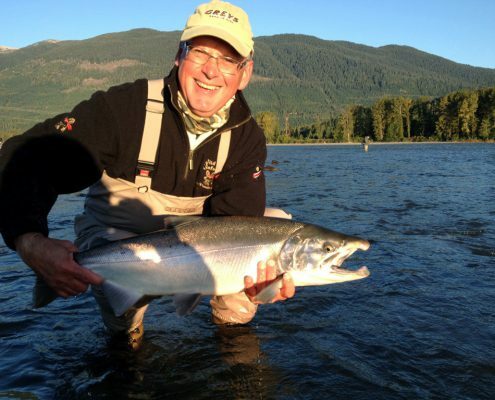 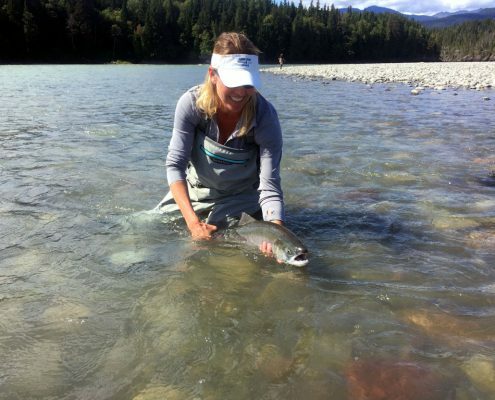 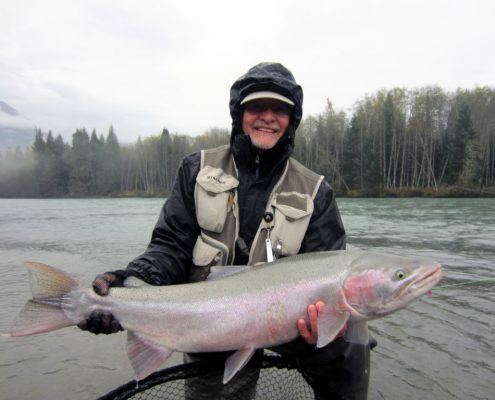 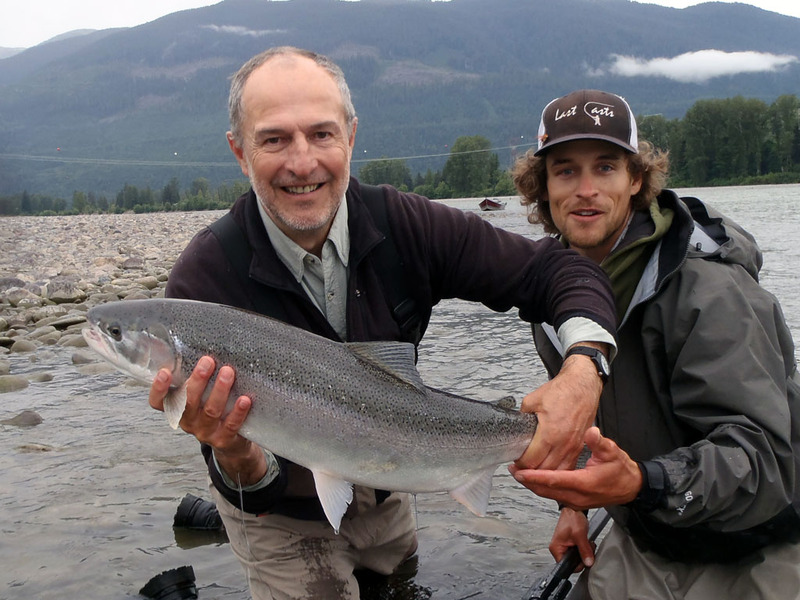 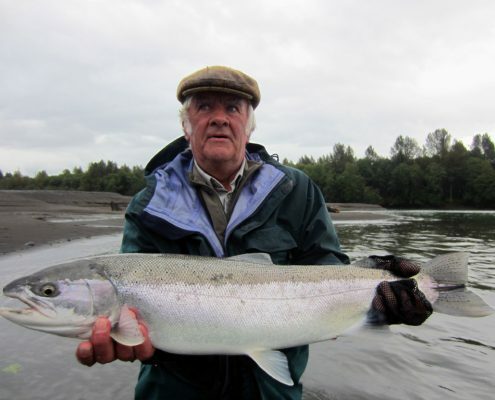 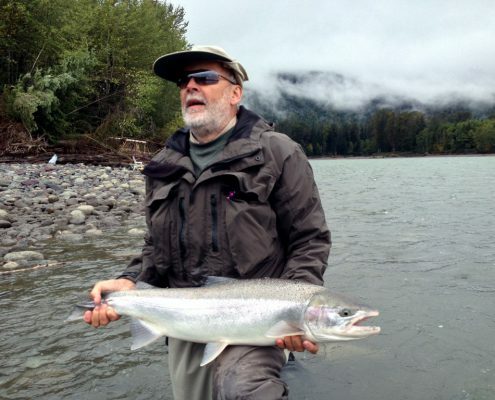 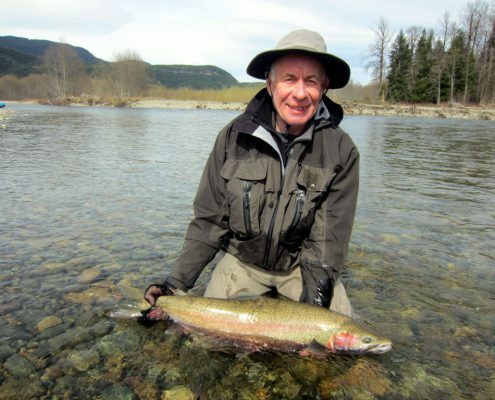 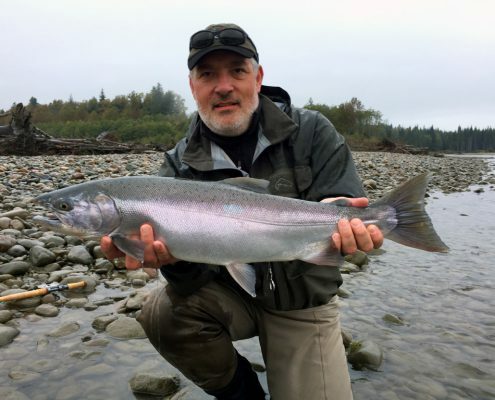 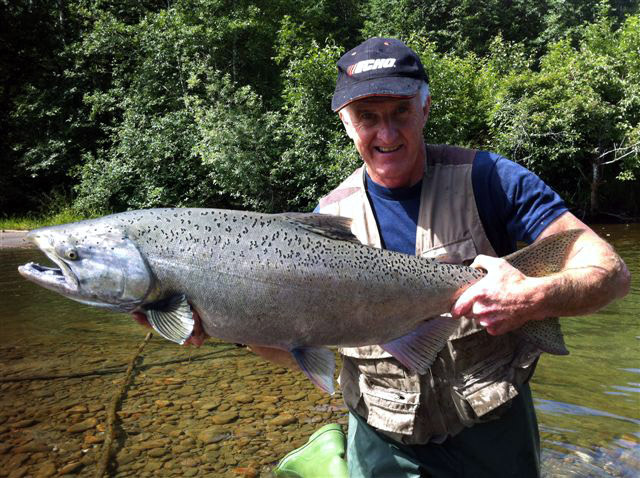 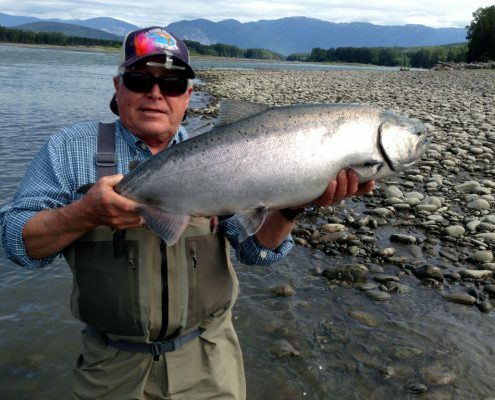 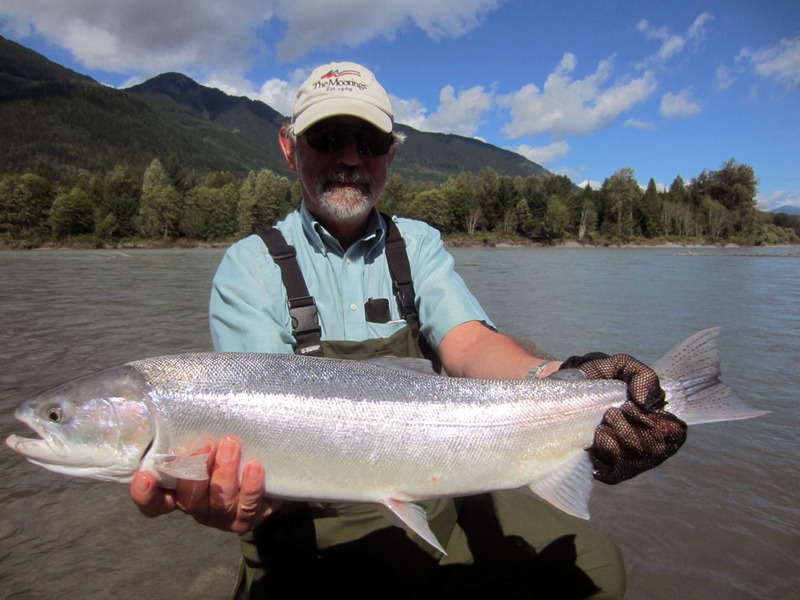 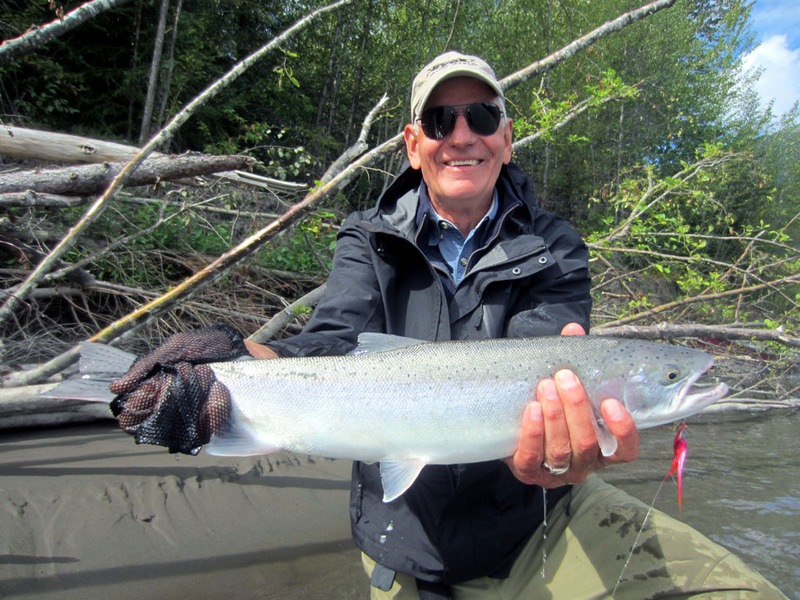 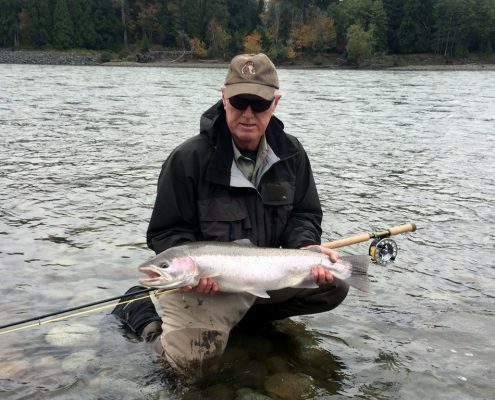 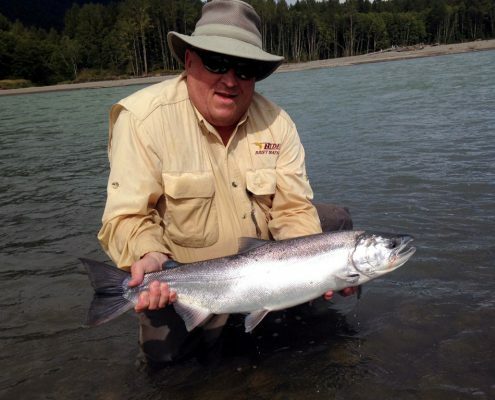 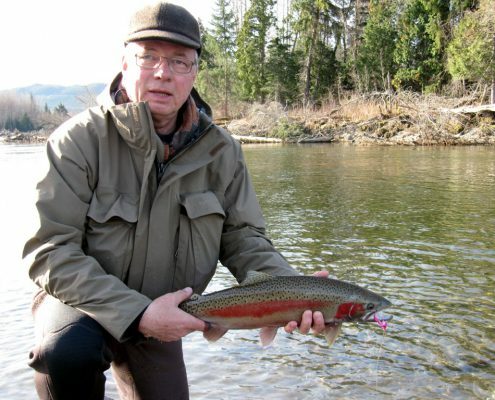 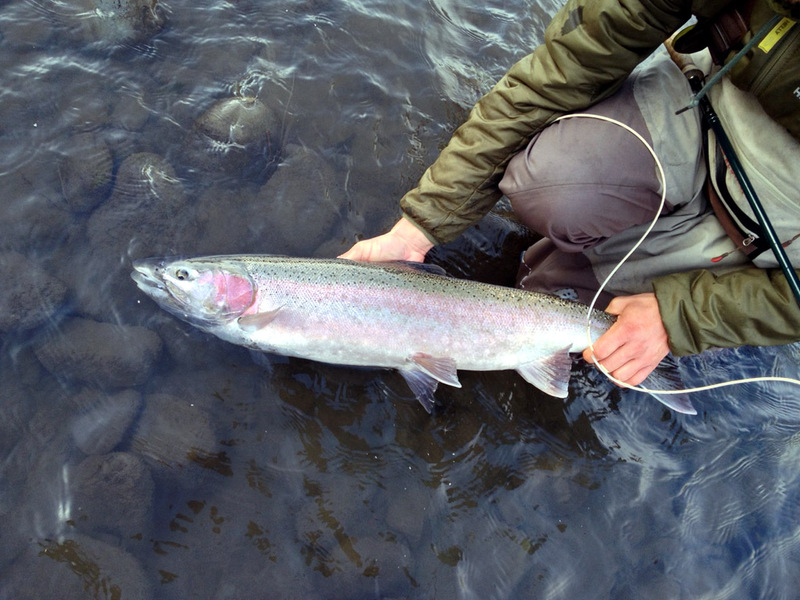 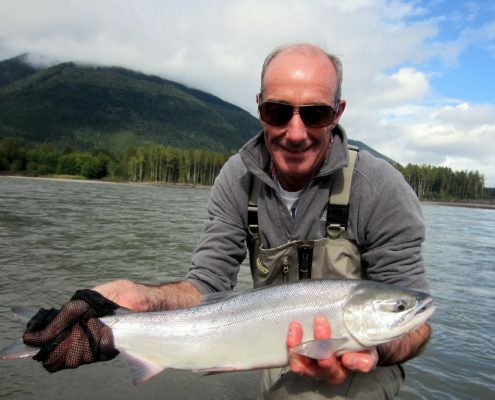 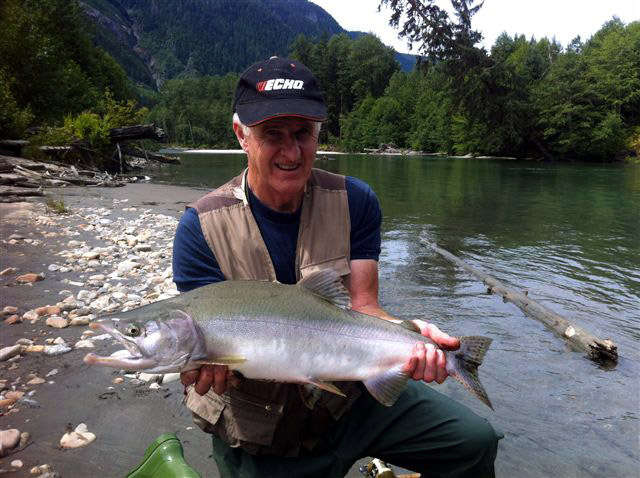 Kalum River Lodge anglers landed some superb Steelhead in the spring, summer and autumn. 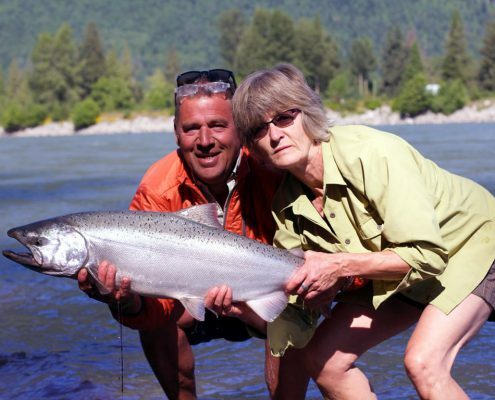 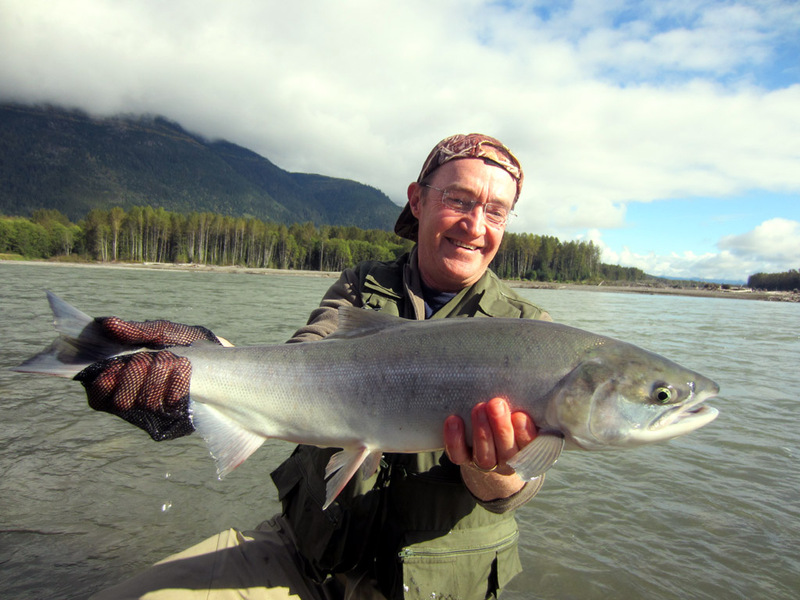 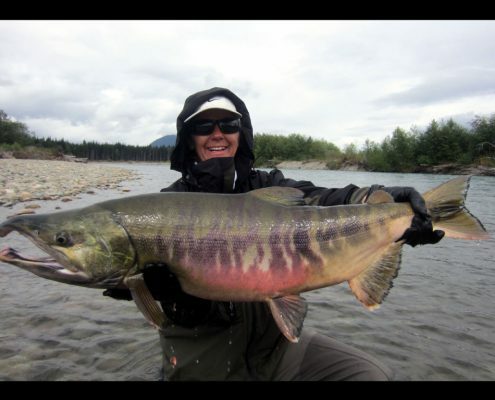 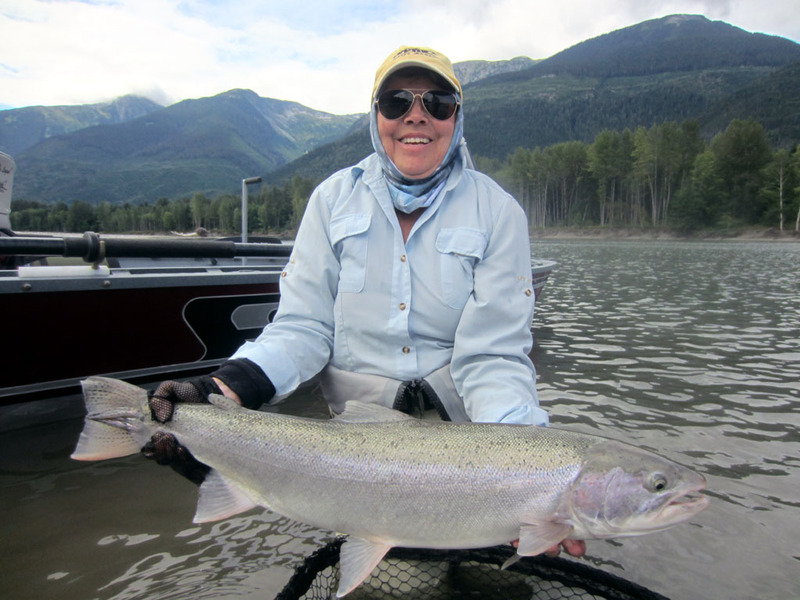 The biggest Steelhead for the season was a whopping 25lb fish caught by J.Ann Hyde on her single hand fly rod. 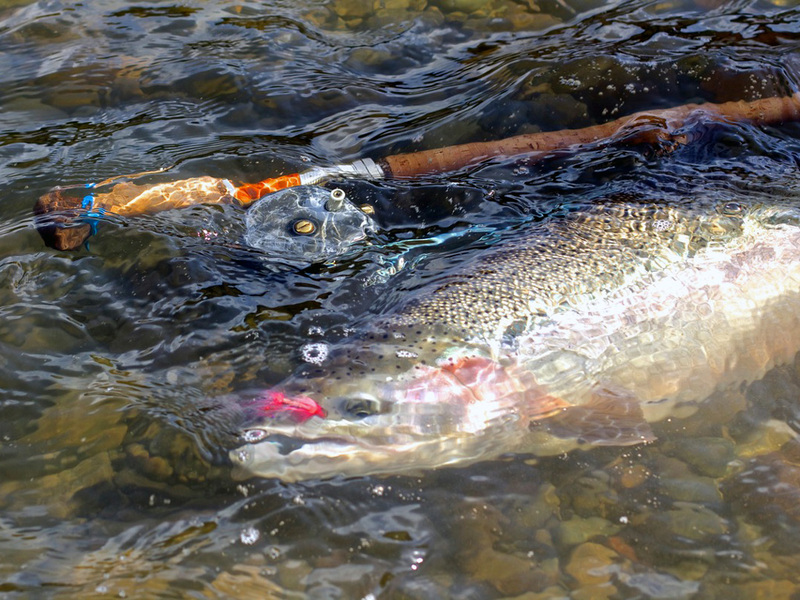 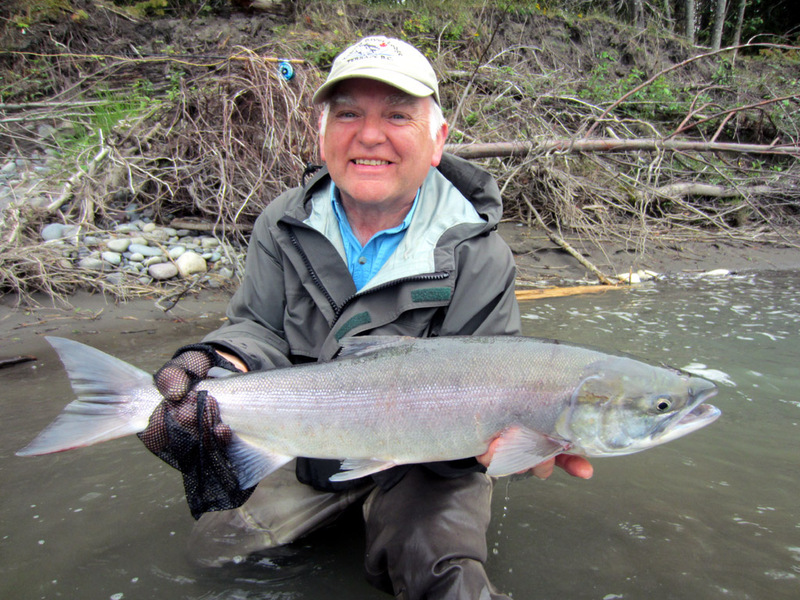 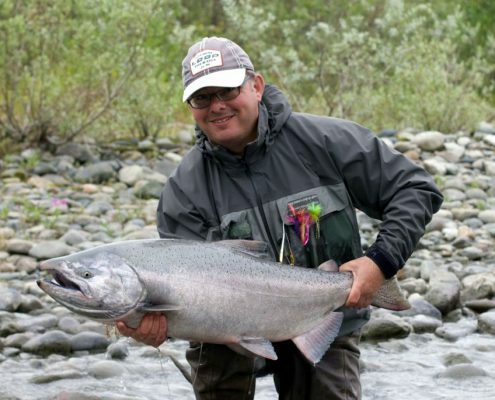 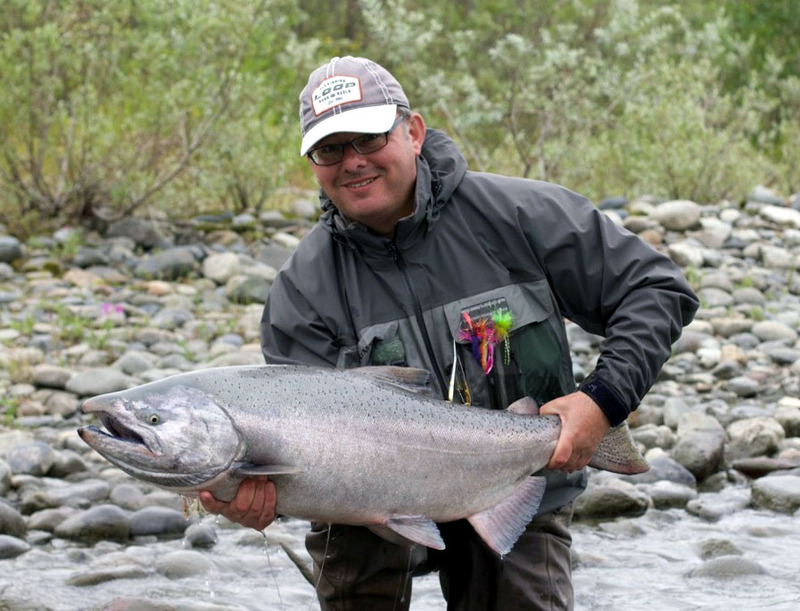 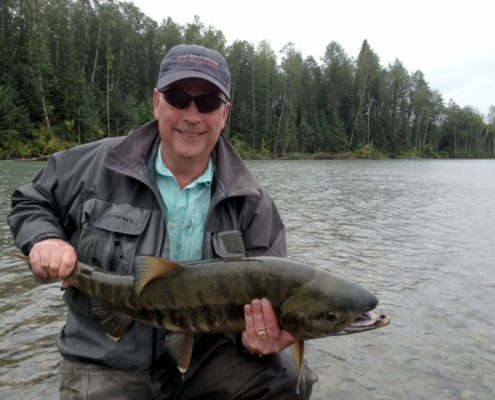 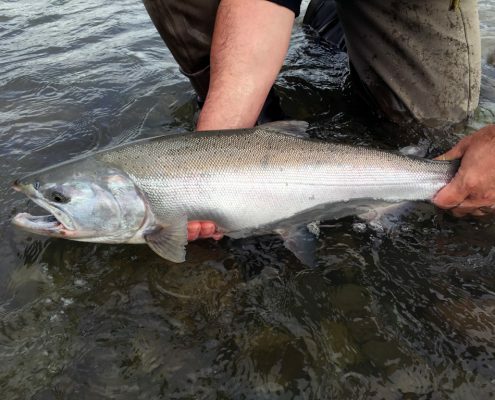 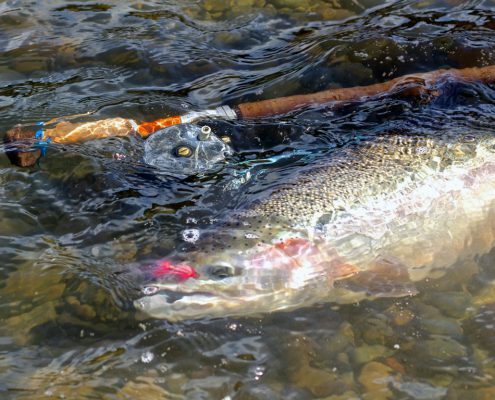 Our spring Steelhead fishing was exceptionally good from late March to early May. 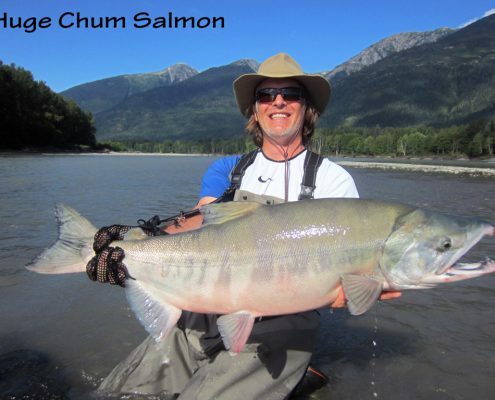 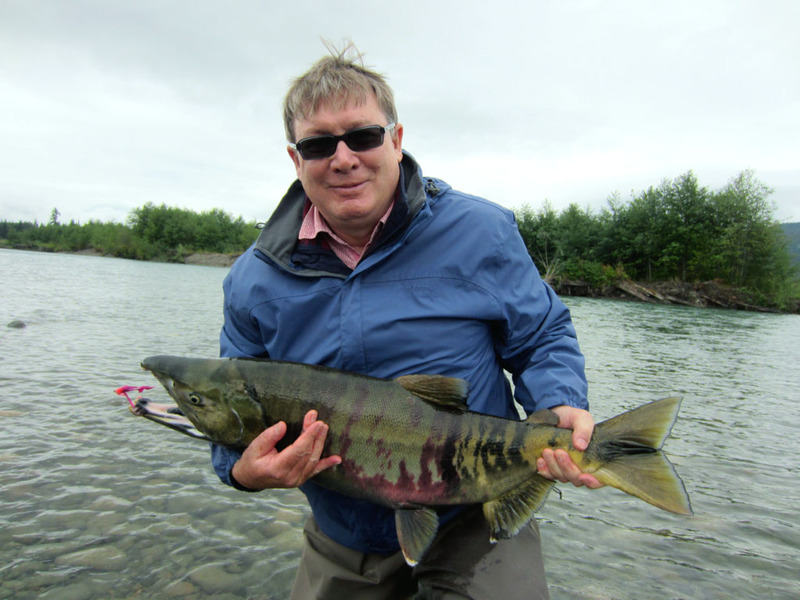 During the early summer season we had very strong runs of Chinook, Chum and Sockeye salmon. Our anglers had some great catches of salmon during this time and many of them have re-booked to do it again! 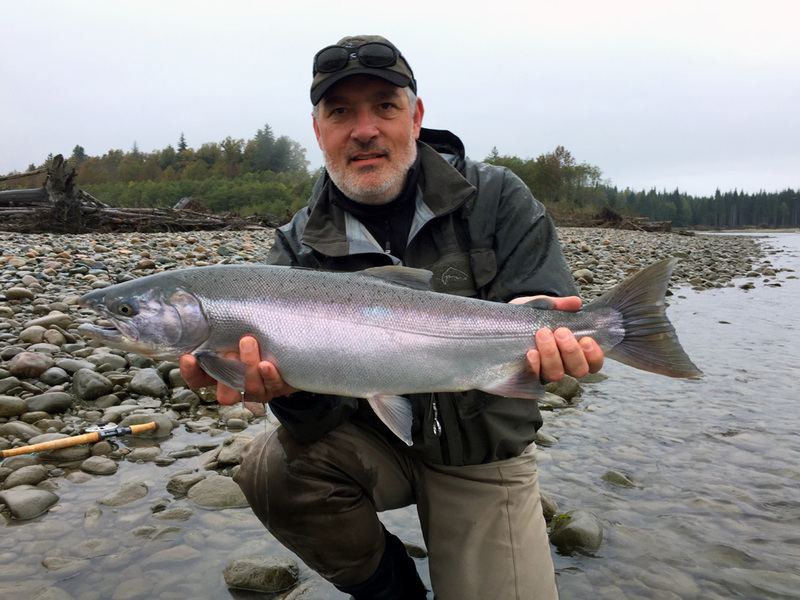 September/October fishing produced some nice Steelhead and Coho. 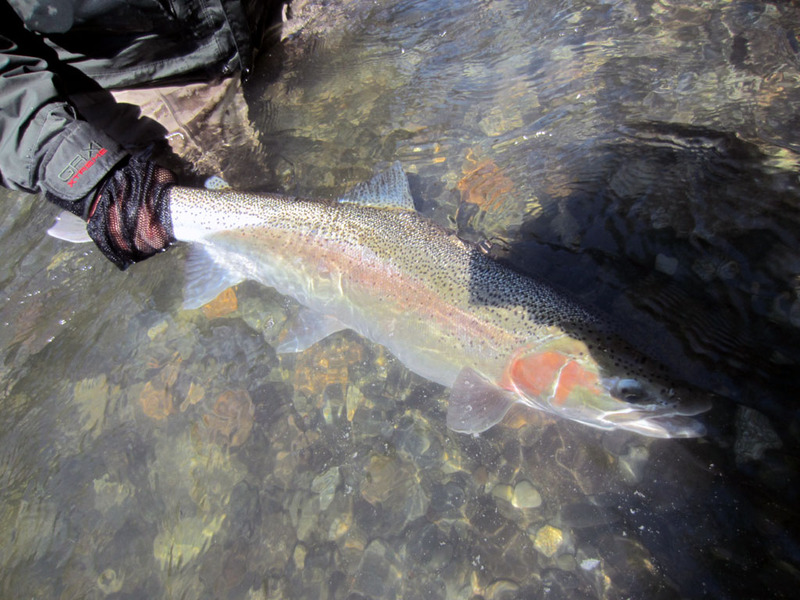 We are now counting down the days to the start of our 2016 spring Steelhead season in late March. 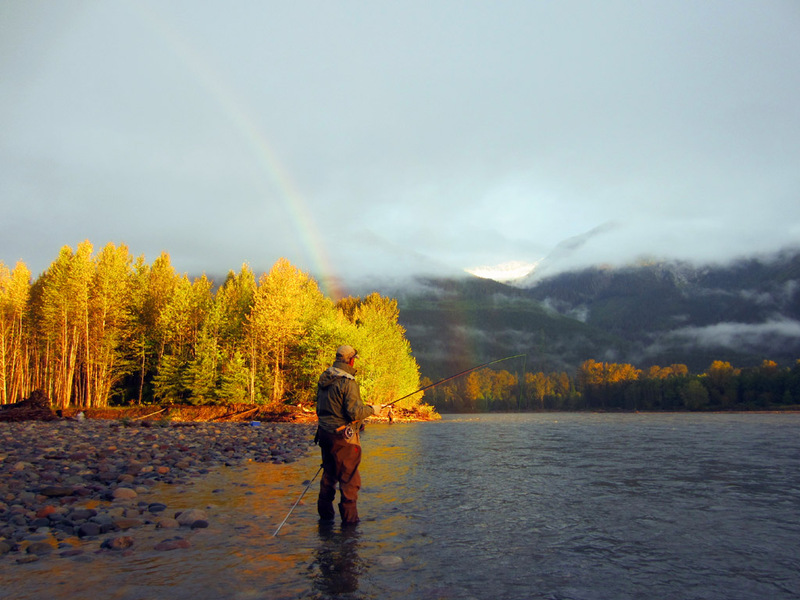 Autumn weather is now upon us. Despite losing conditions for a couple days we still had some nice catches during the week. 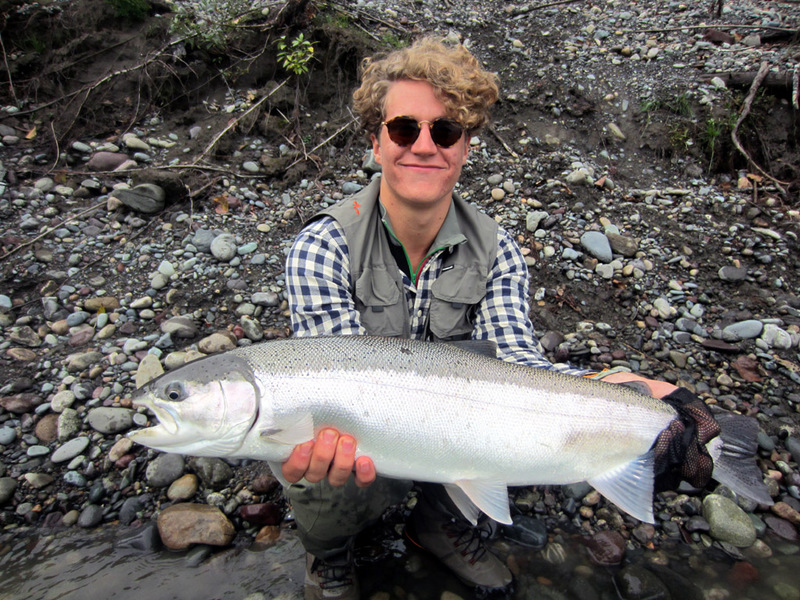 Top fly rod for one day was Thomas with thirteen nice salmon landed on the second day of his trip. 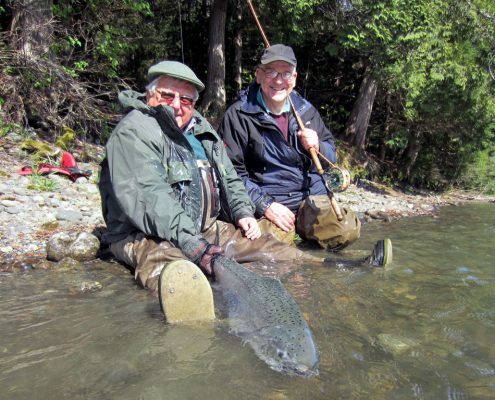 Two of our other guests, John R and John D, hooked over thirty salmon on their spinning rods one day and then went back to using their fly rods. 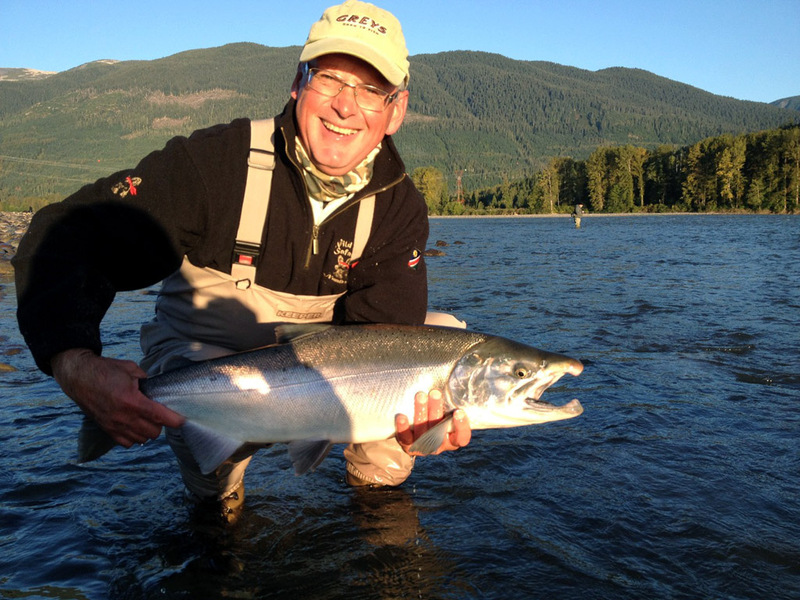 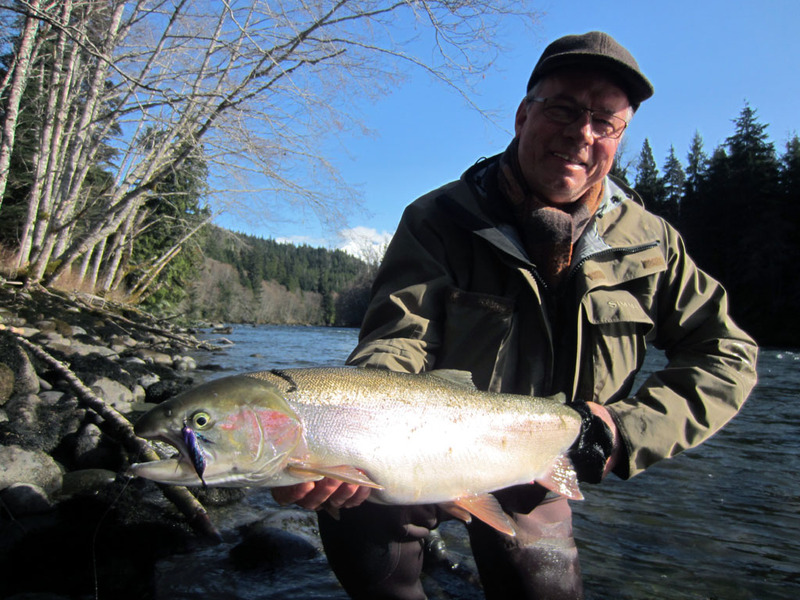 John D managed to hook three Steelhead on his single handed fly rod on their fourth day out, landing one close to 20lb. 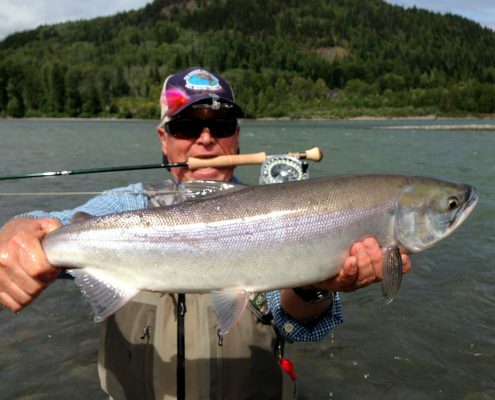 What a fight on the single handed rod!! 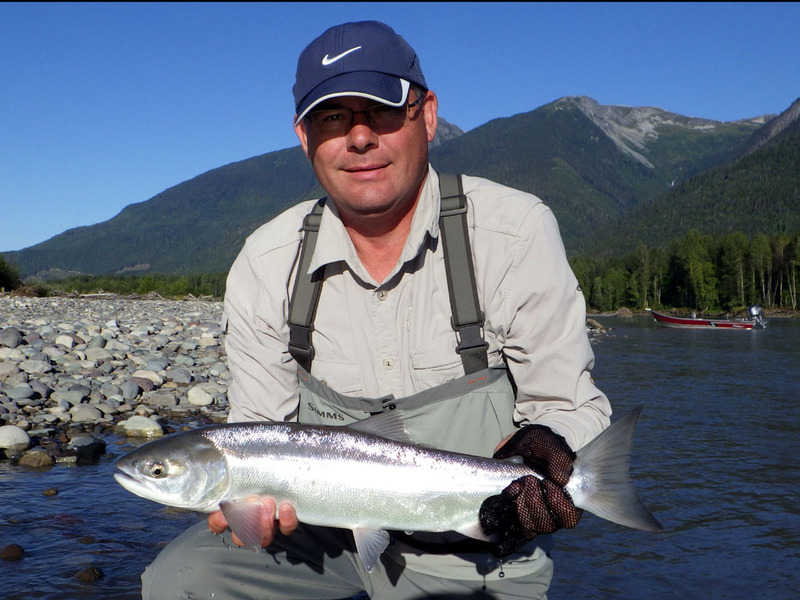 Thanks to everyone for an enjoyable week. 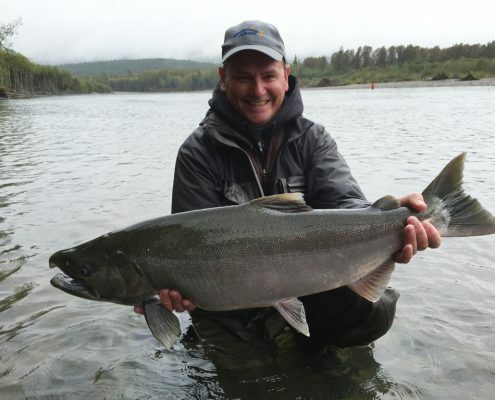 Despite a bit of tough weather the guys caught some nice fish this week. Species caught were Steelhead, Coho, Cuthroat and Dolly Varden. 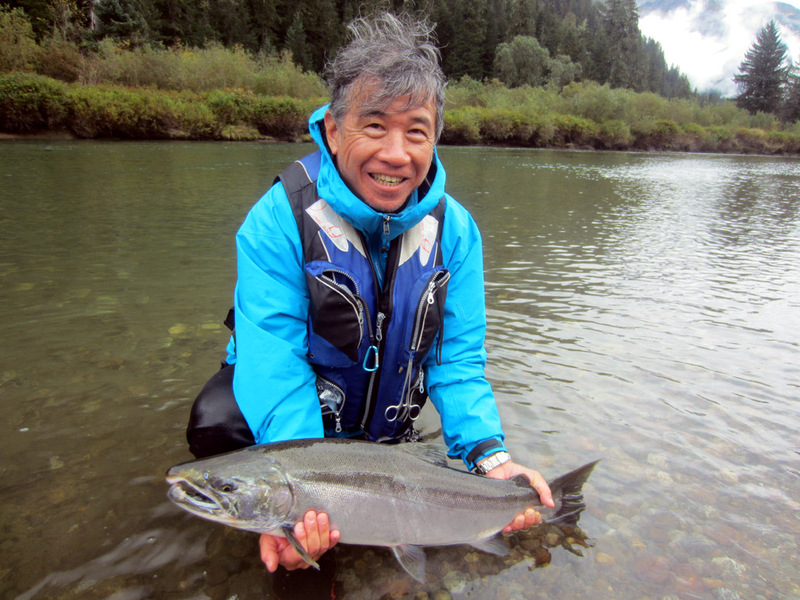 Thanks to our returning guests from the US, UK and Japan. 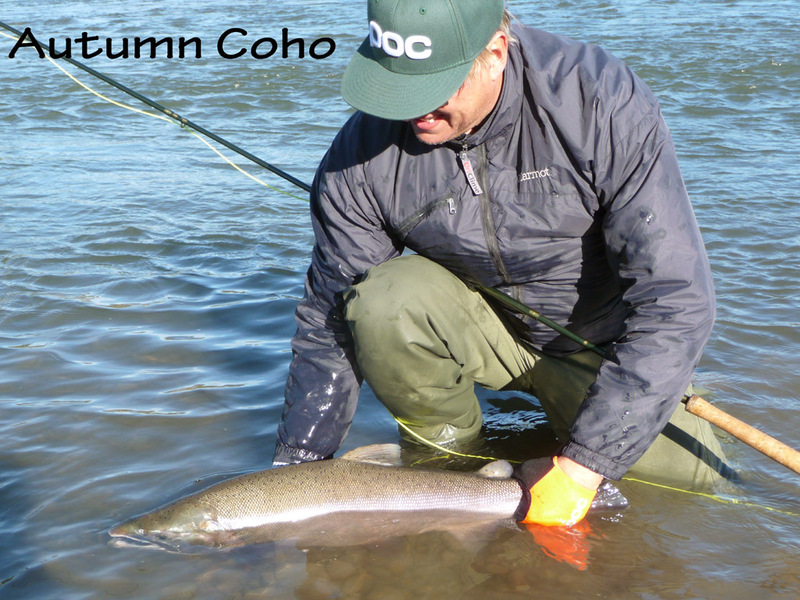 From late September and throughout October is when the large Northern Coho are running. 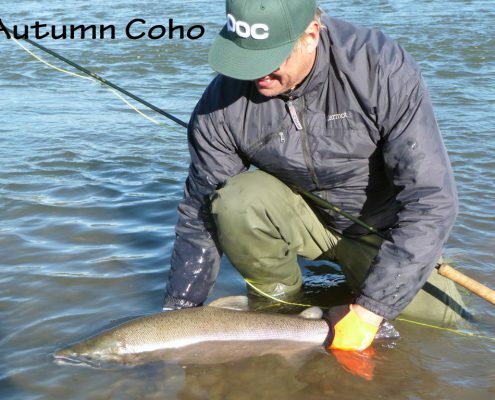 During this part of the season we fish several Coho rivers and also other rivers that hold both Coho and Steelhead. 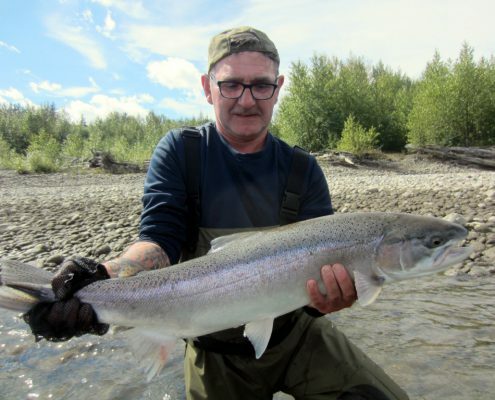 Allan, Phil, Kevin and Tom were back for another season along with some new guests to target these super fish. 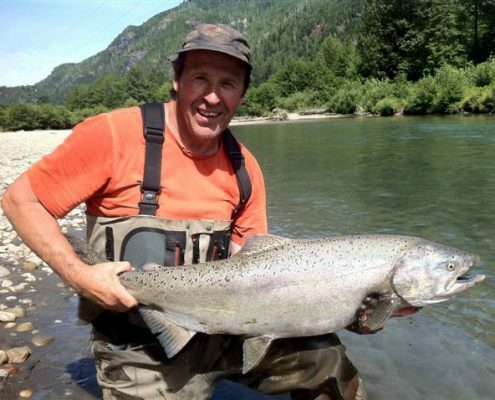 Last year at this time Phil landed a 24lb Steelhead and several others. 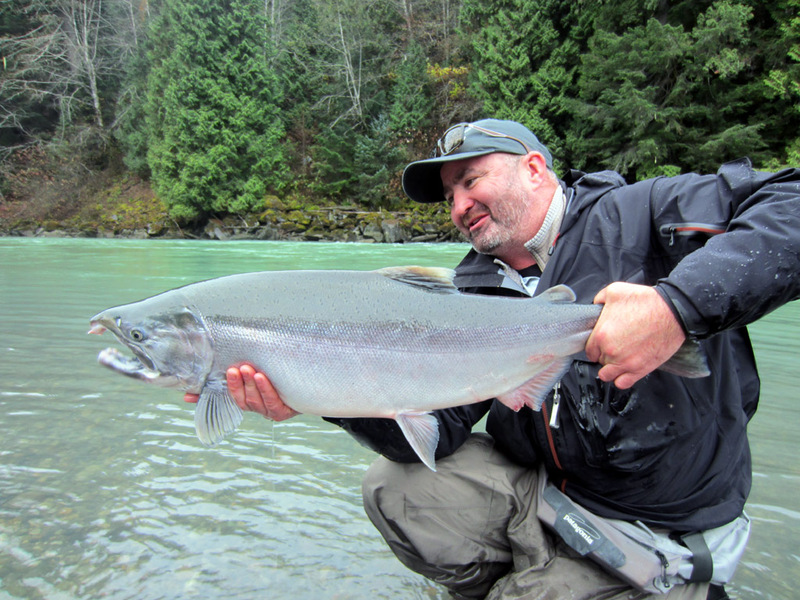 This year the guys were out on our smaller rivers and landed some big Coho along with some super Steelhead. 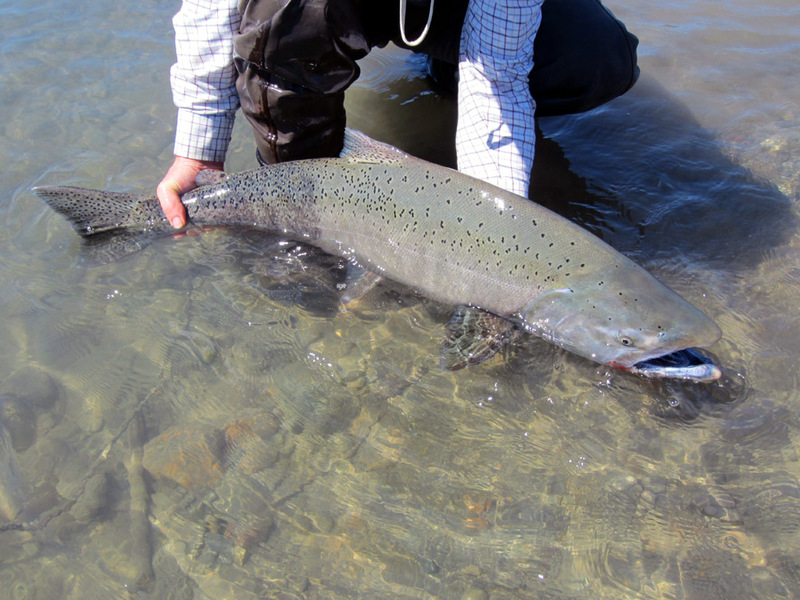 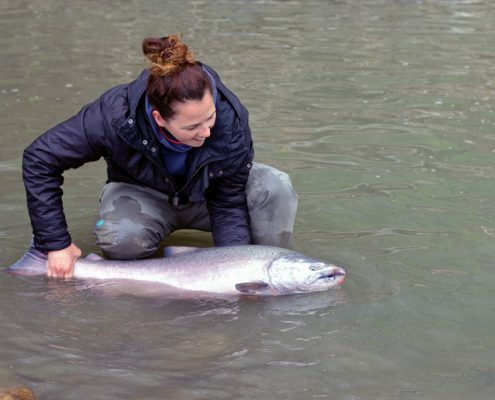 The only species left on the list for these guys is trophy Chinook salmon during our summer season. 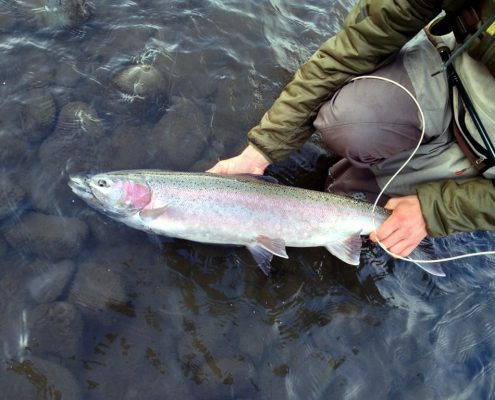 We look forward to their return in 2016 and more great fishing. 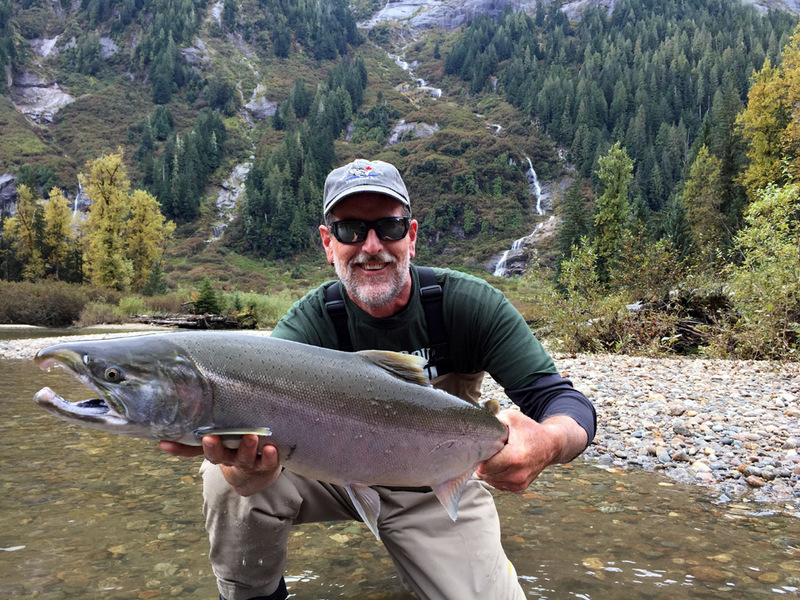 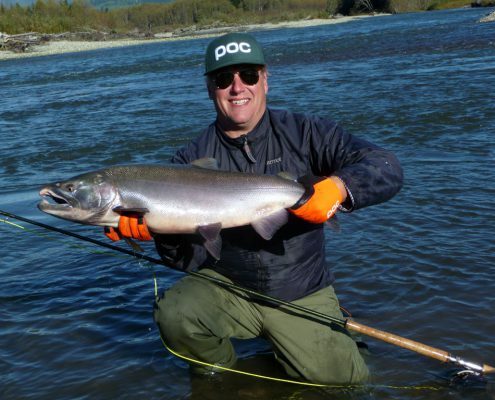 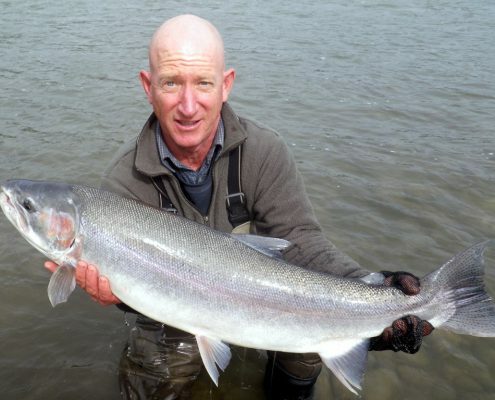 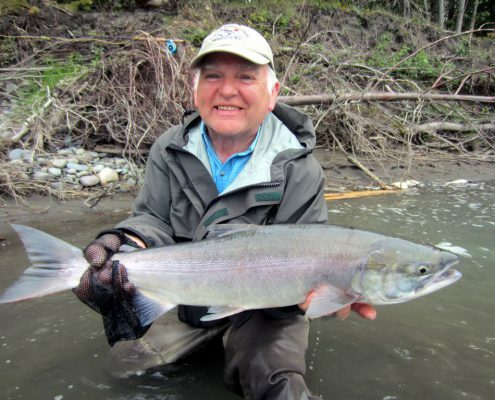 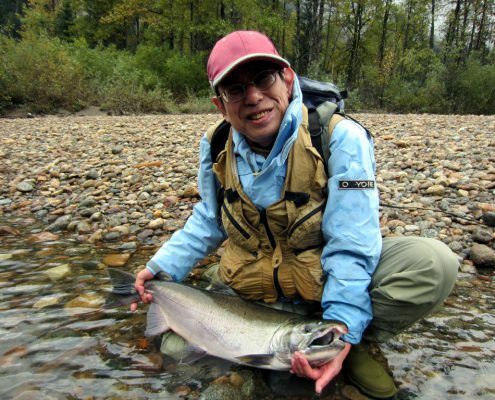 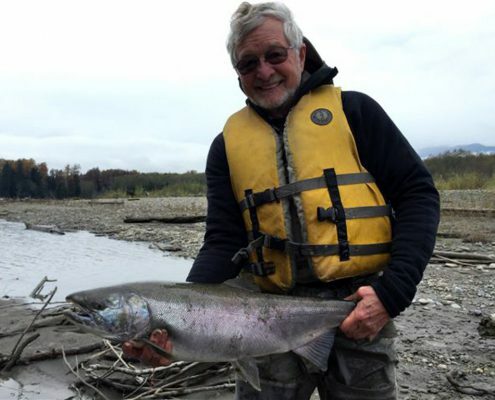 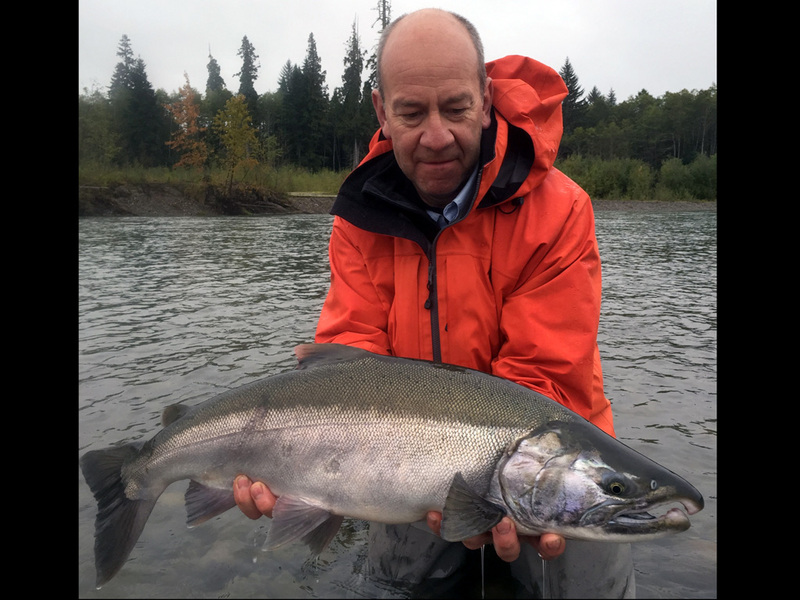 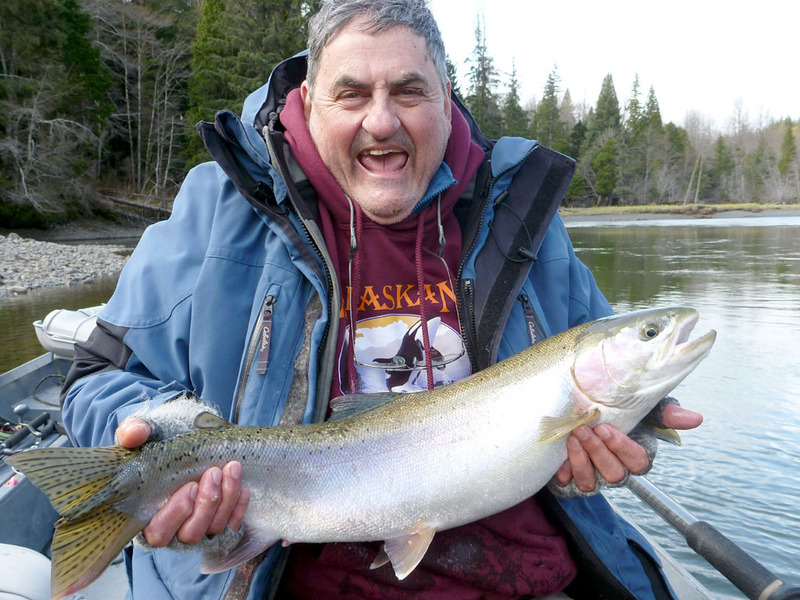 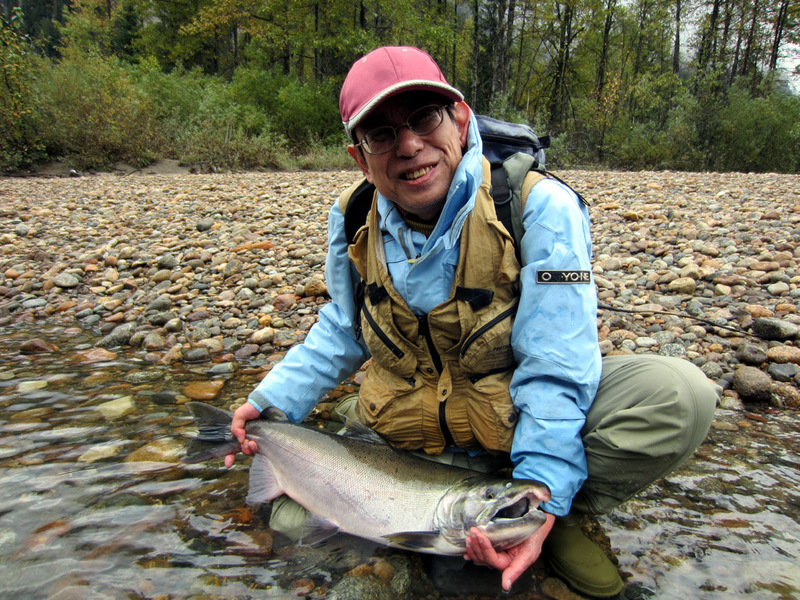 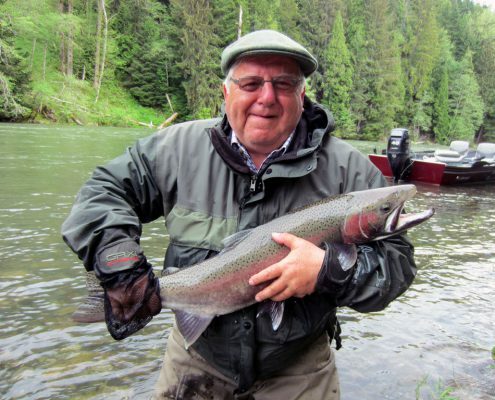 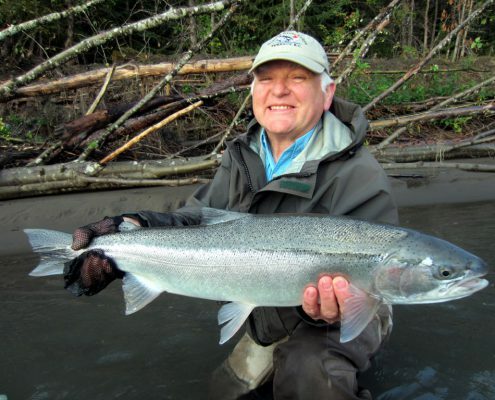 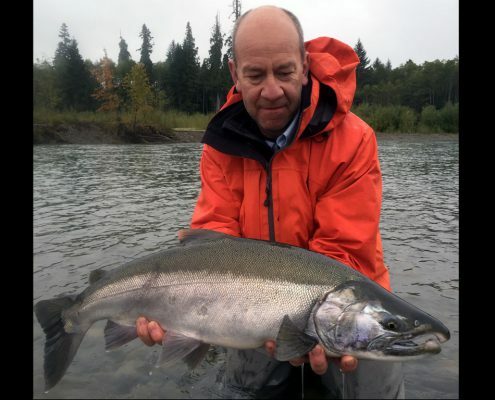 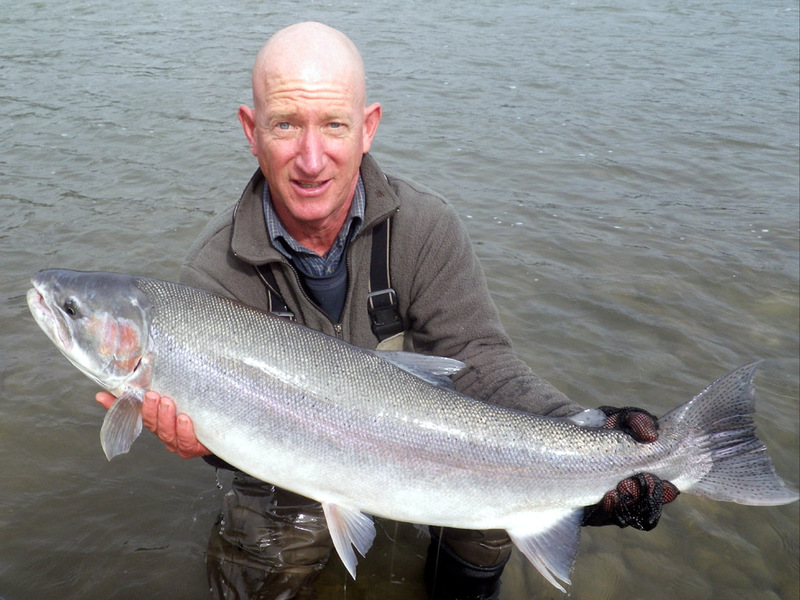 The Luck of the Irish as the expression goes proved true for Phillip last week at Kalum River Lodge as he caught three Steelhead in five casts. 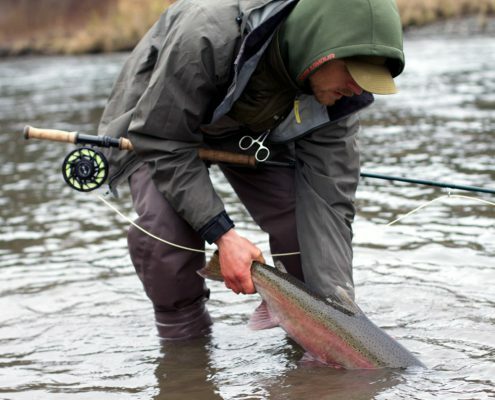 He then went on to hook another two Steelhead after landing the first three! 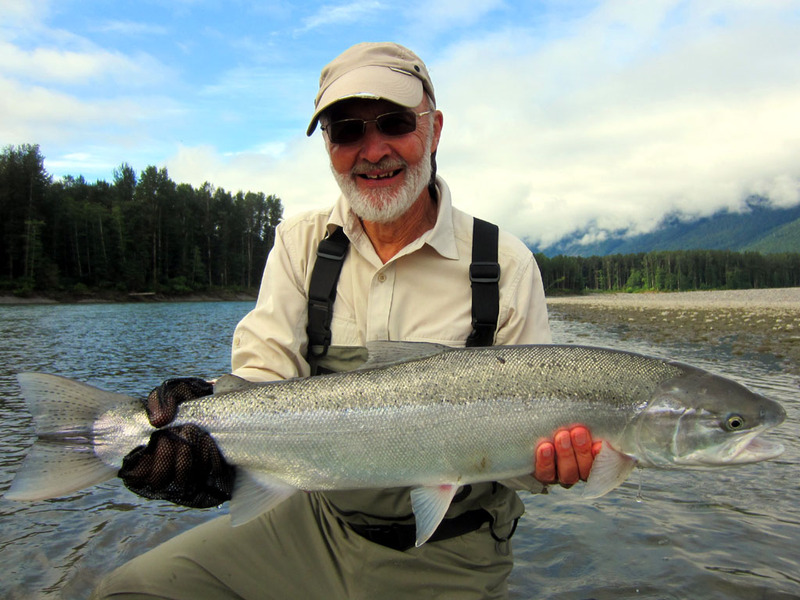 Great people, great fish and another super week at the lodge. 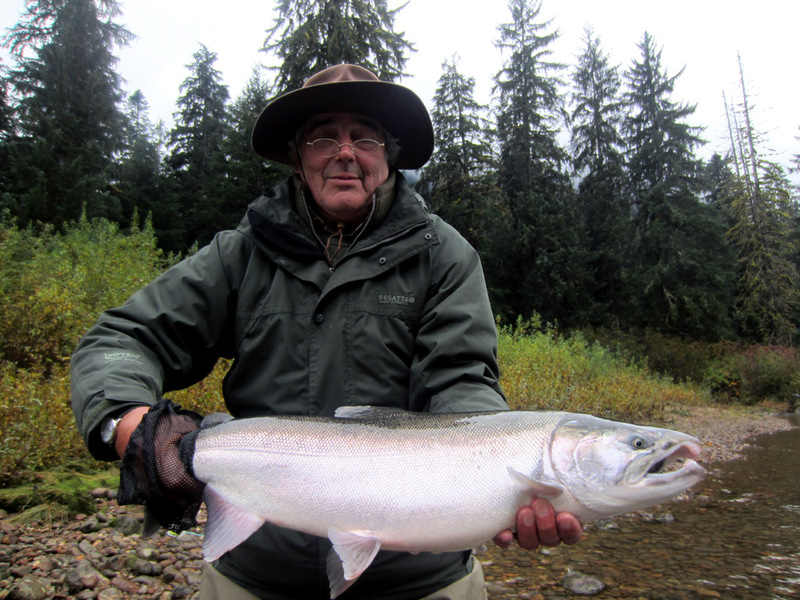 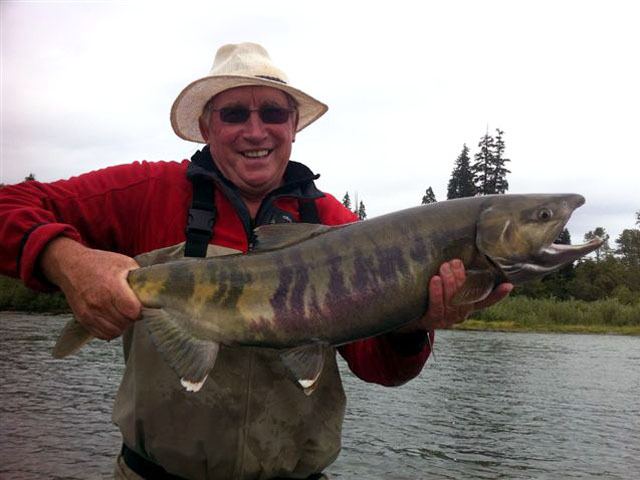 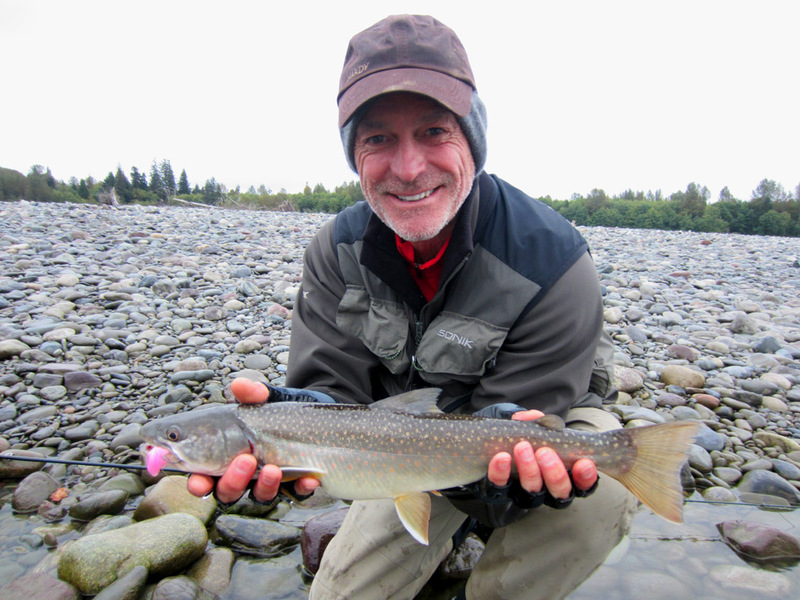 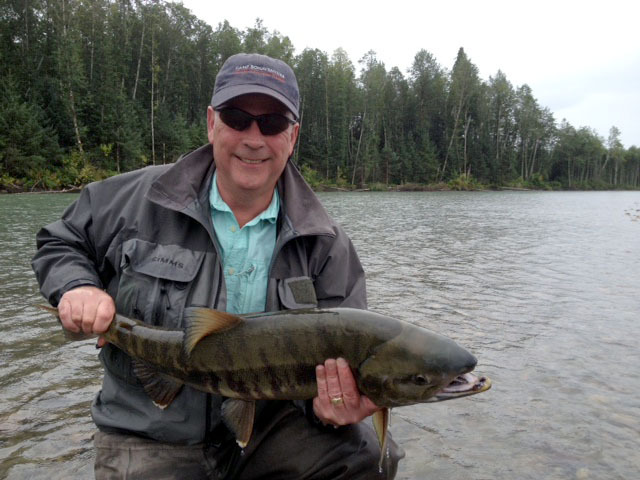 Another week of great fishing here at Kalum River Lodge. 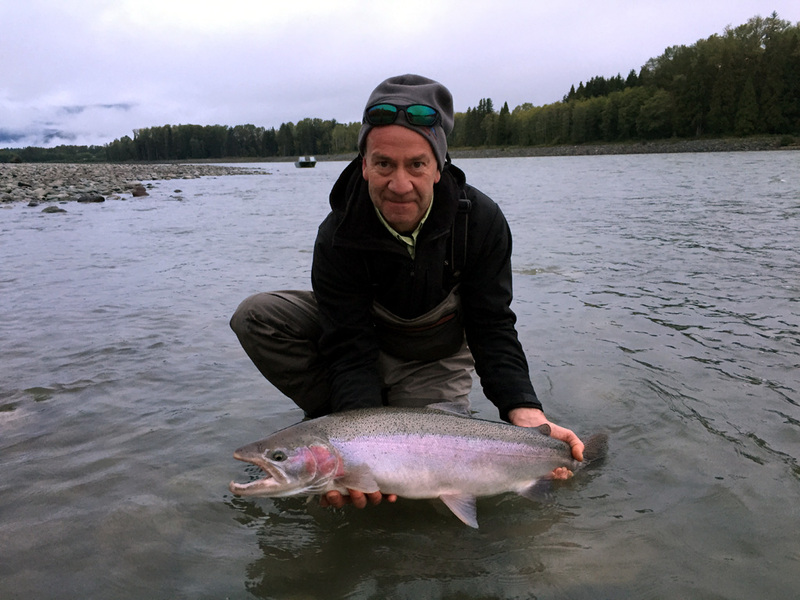 The highlight of the week’s catches was a 22lb Steelhead. A team effort between Head Guide Andrew Rushton and guest Alun Williams brought this superb fish to the bank. 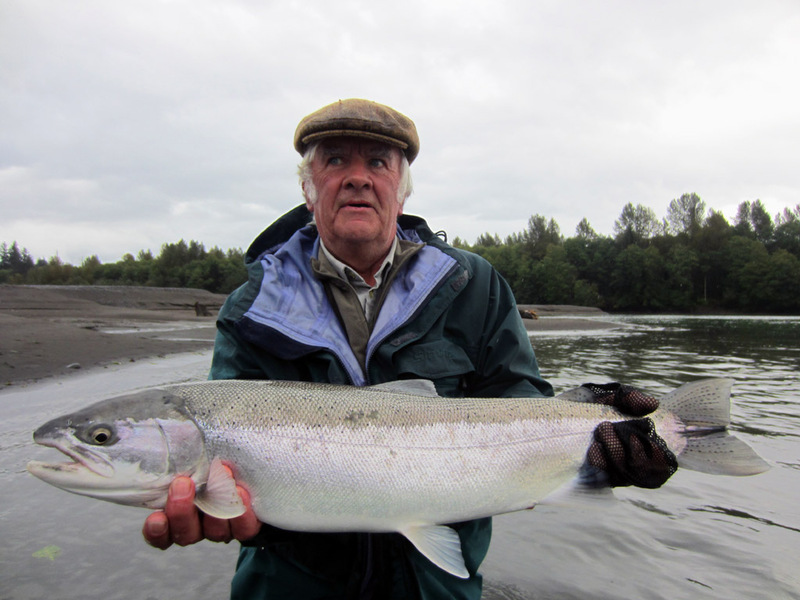 This time of the season we start fishing many of our smaller rivers for both Steelhead, Coho salmon and trout. 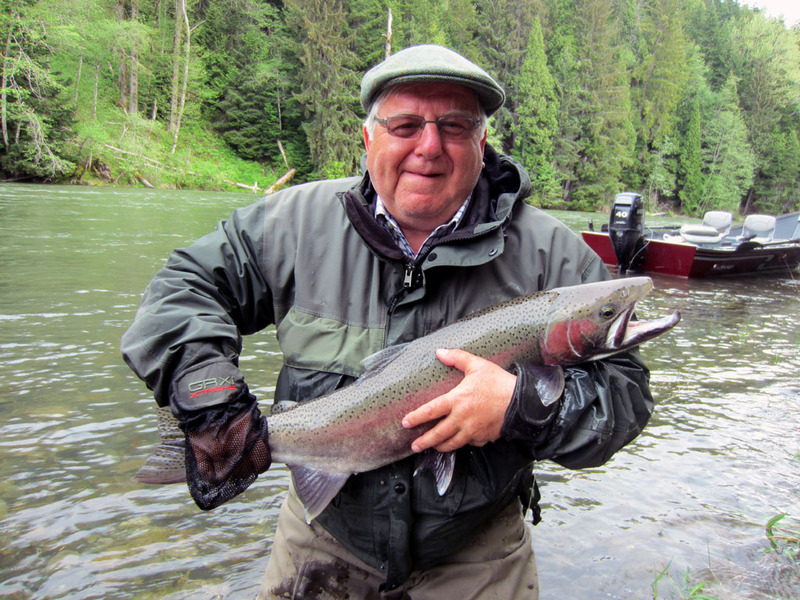 As you can see from the photos our guests have some great memories to go home with. 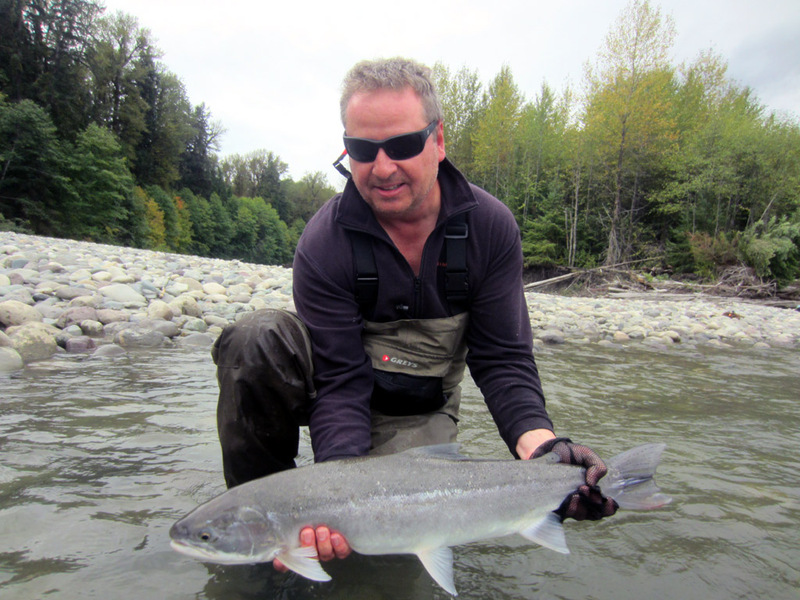 With variable weather this week and some heavy rain we had a couple of challenging days. Despite the rain our fly angers came through with some good catches. 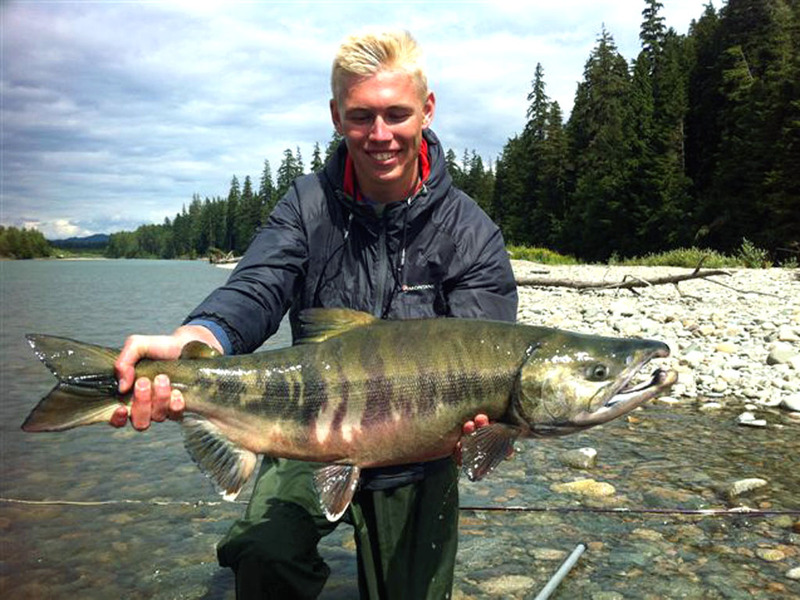 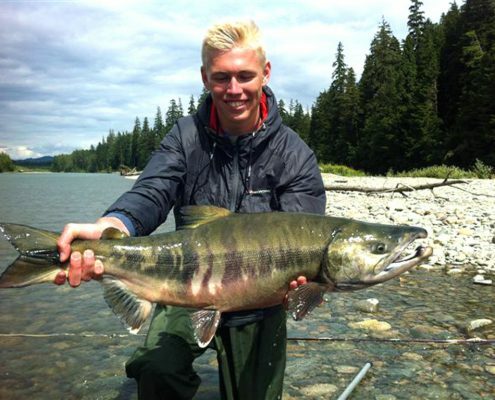 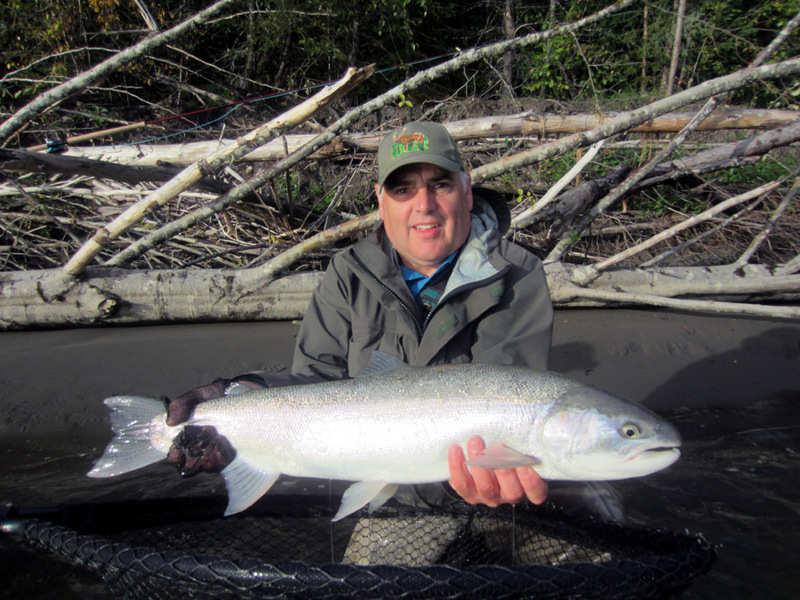 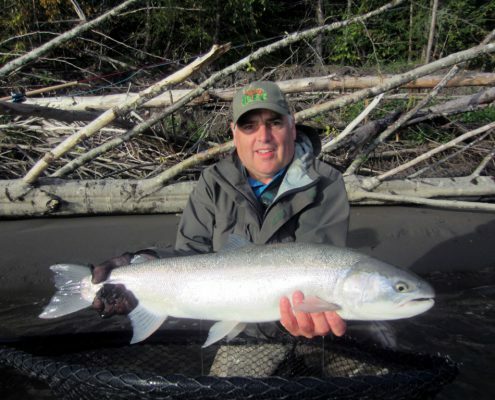 Top rod for the week was our regular guest Thomas B with the most Steelhead and a grand slam for the week. 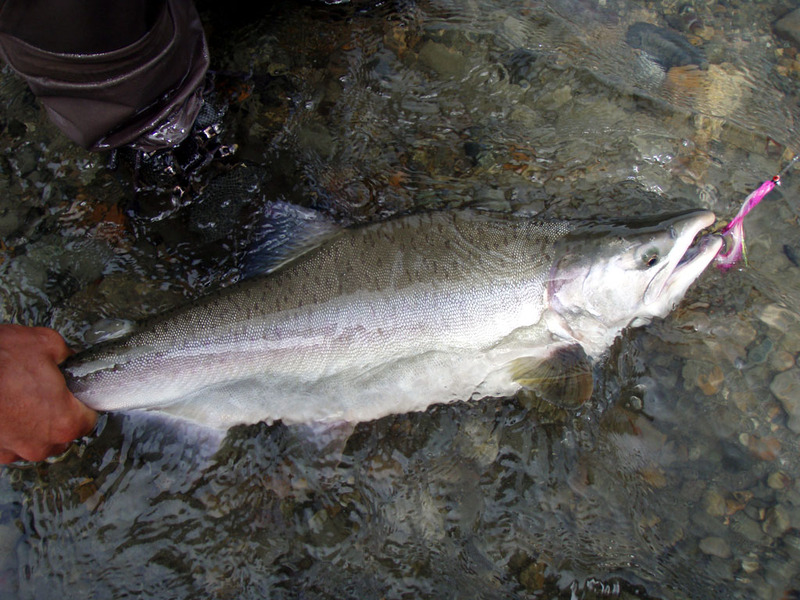 A grand slam is all five species of salmon and Steelhead . 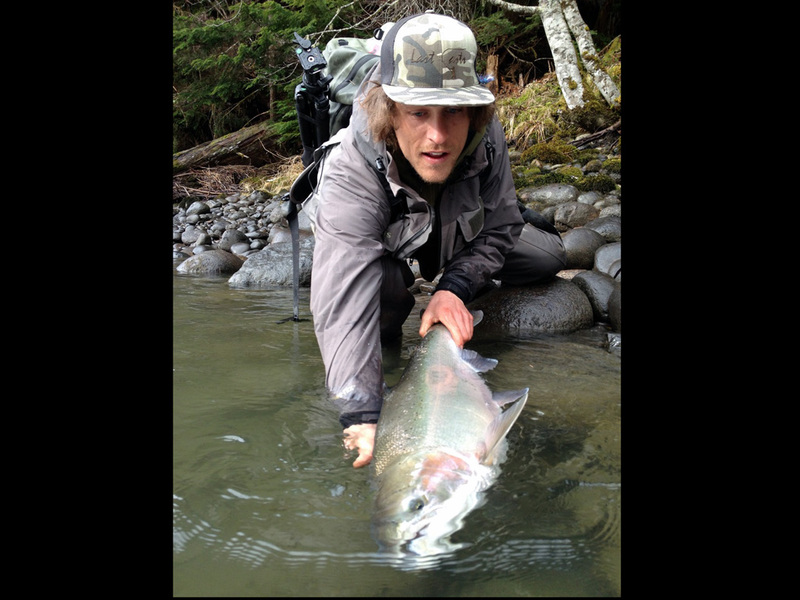 Thomas almost accomplished this feat in one day but didn’t get a Coho so he settled for a grand slam for the week. 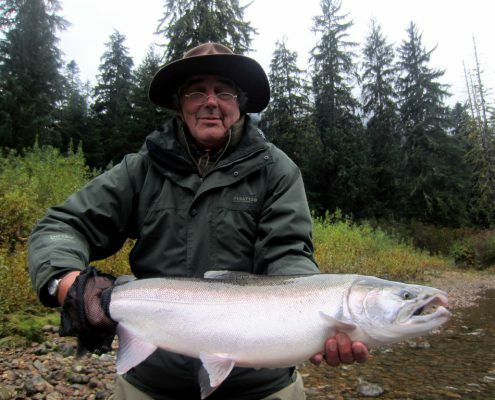 Another great week at Kalum River Lodge. 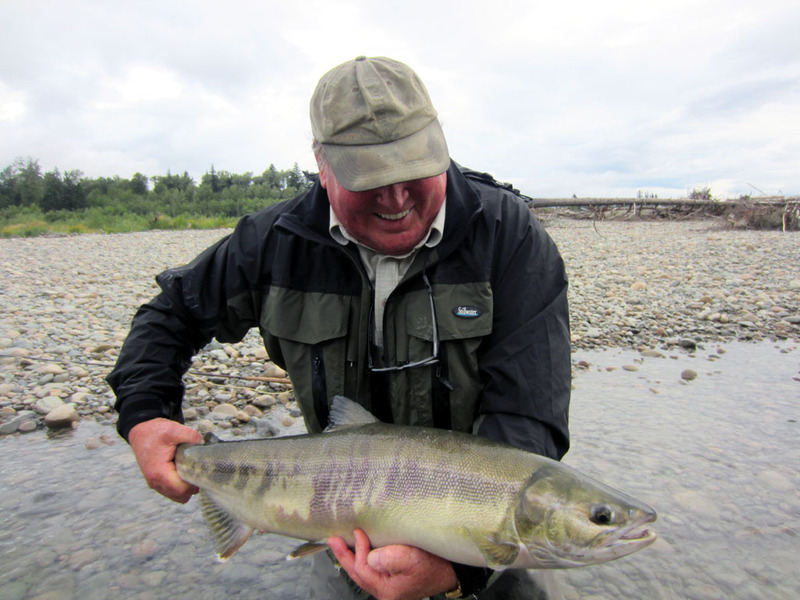 Guests Syd, Jim and Andy had an exciting week that included a day on one of our wilderness rivers. 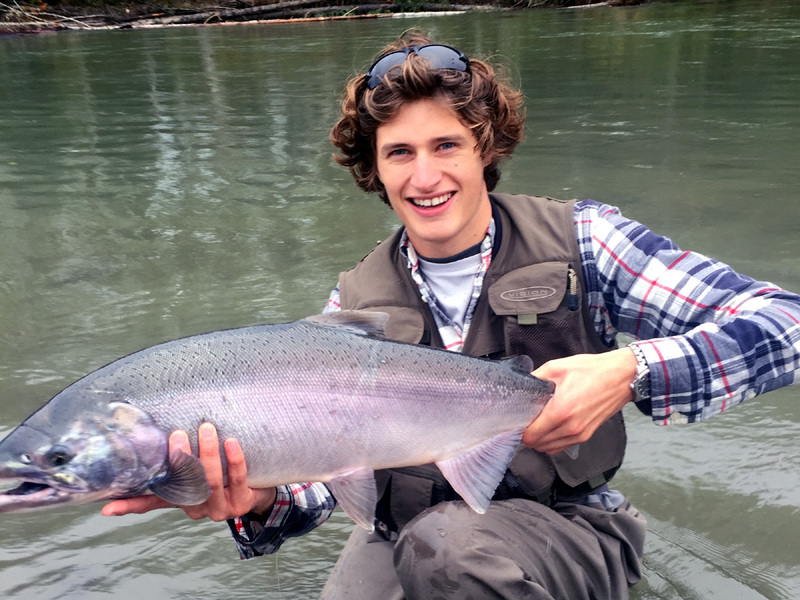 After rafting and hiking the guys were rewarded with catches of Steelhead, Coho and trout. 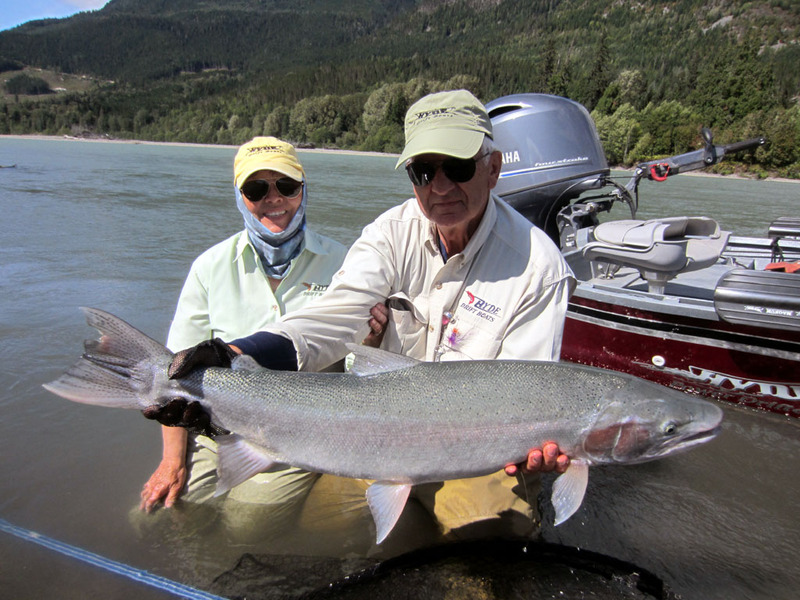 The variety made for a memorable week and we look forward to their next trip. 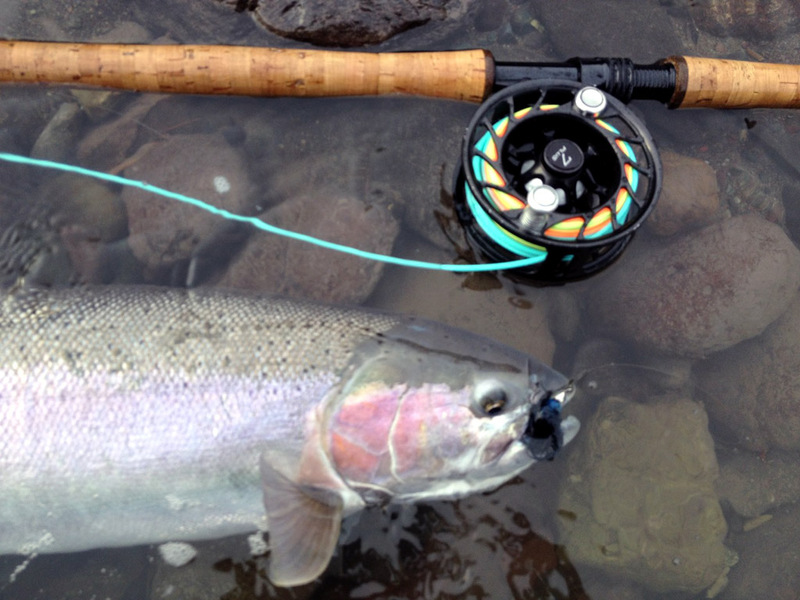 Also thanks to our other repeat guests Billy, Jim, Clay, Marcus, Thomas and Kermit who made for a fun filled week. 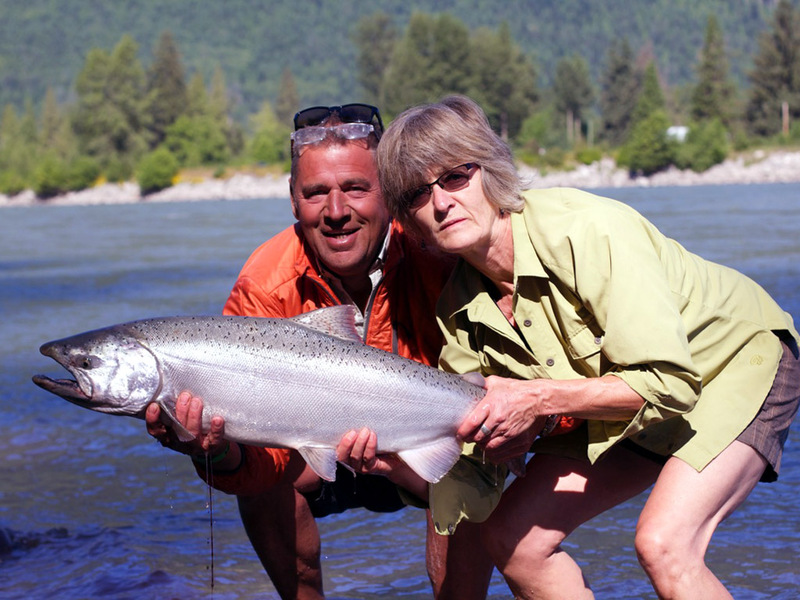 After a great trip last year, LaMoyne and J.Ann Hyde (owners of Hyde Drift Boats) returned this week with a group of avid fly anglers. It was a week of big Steelhead. 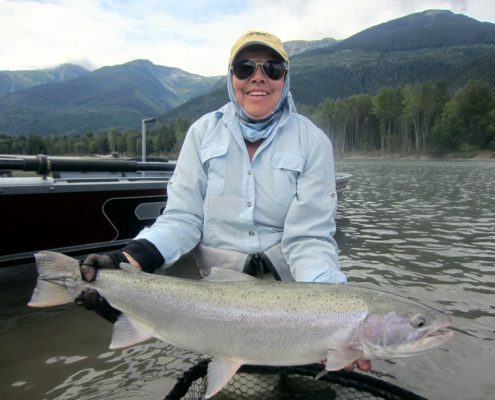 J.Ann was top rod for the week after she landed several large Steelhead, including a huge Steelhead of 25lb. This powerful fish took her down to the end of her backing and after a long chase down the river it was finally brought to the bank. Everyone had a great week and caught a lot of fish. 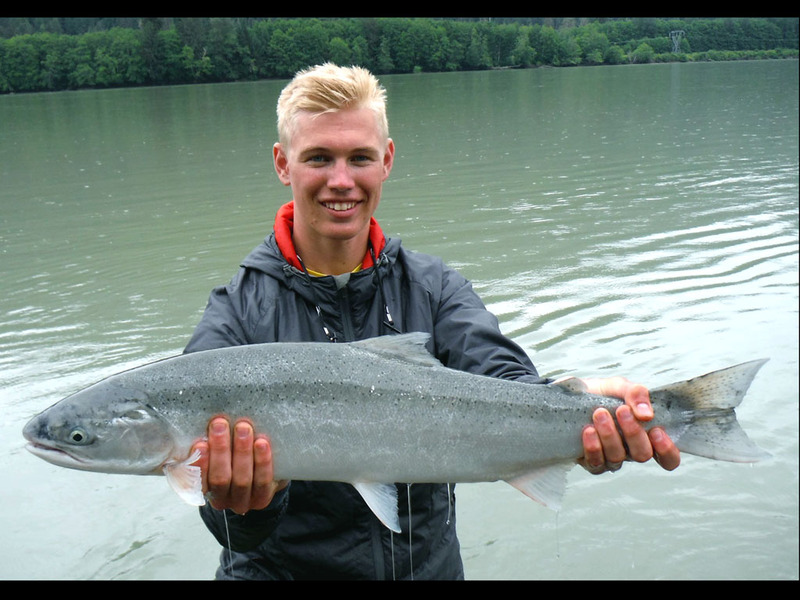 Here are just a few of the many fish landed by the group. 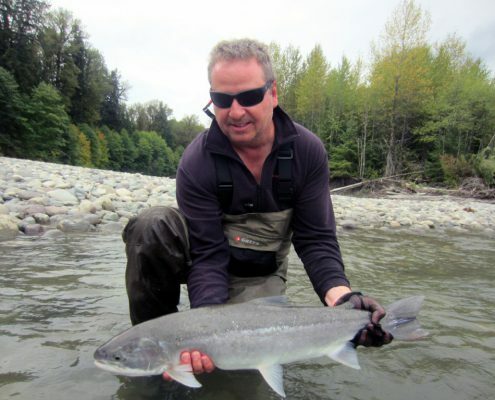 Many thanks to LaMoyne Hyde for another memorable week and we look forward to doing it again next year. 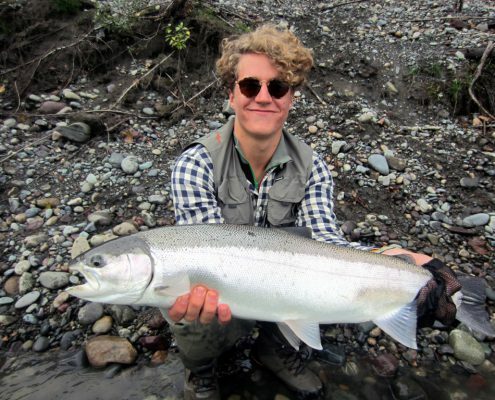 “The boys are back” again! 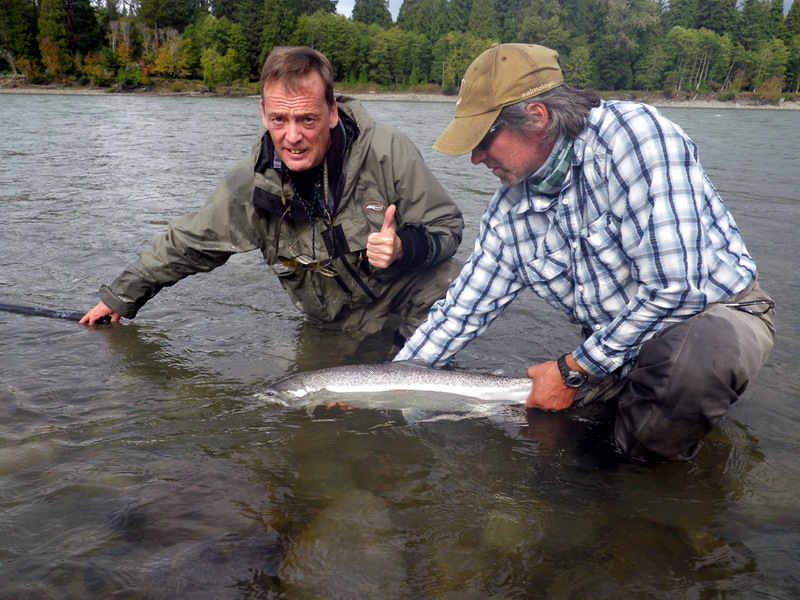 This is season four at Kalum River Lodge for Alan and Bruce, and season three for Geoff. 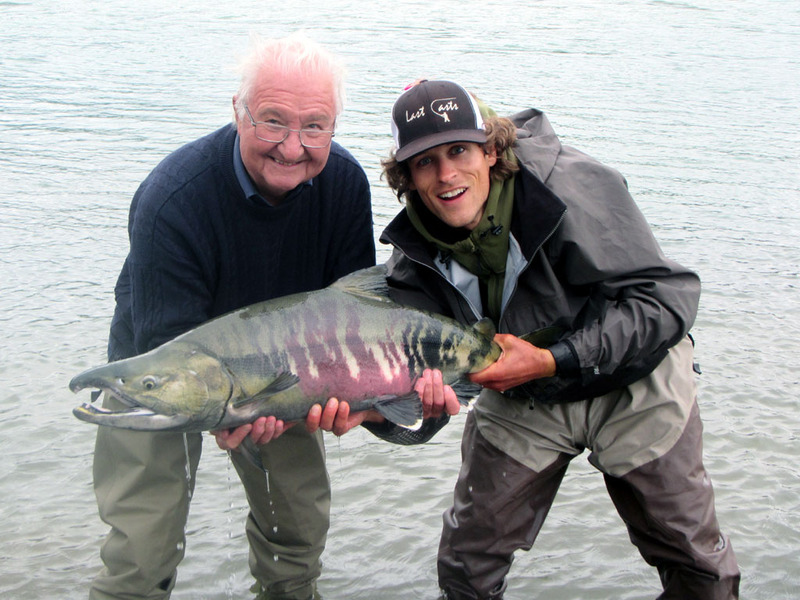 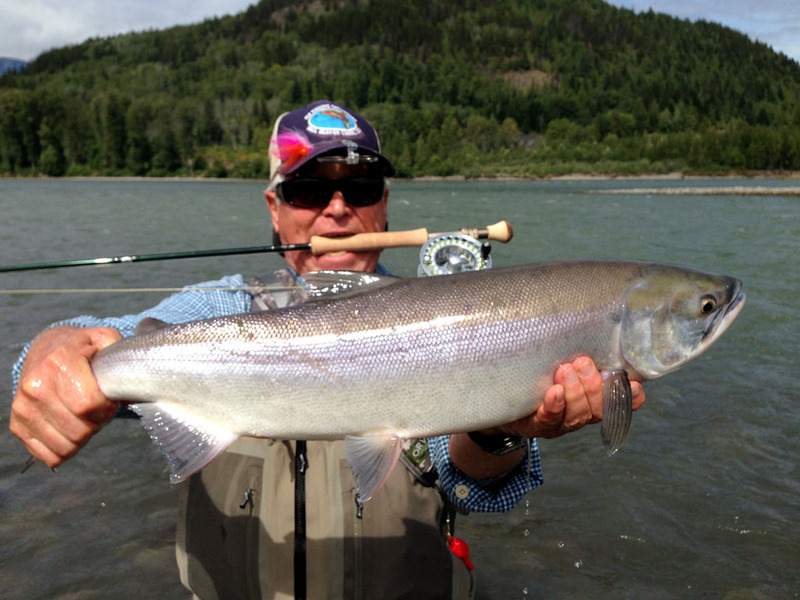 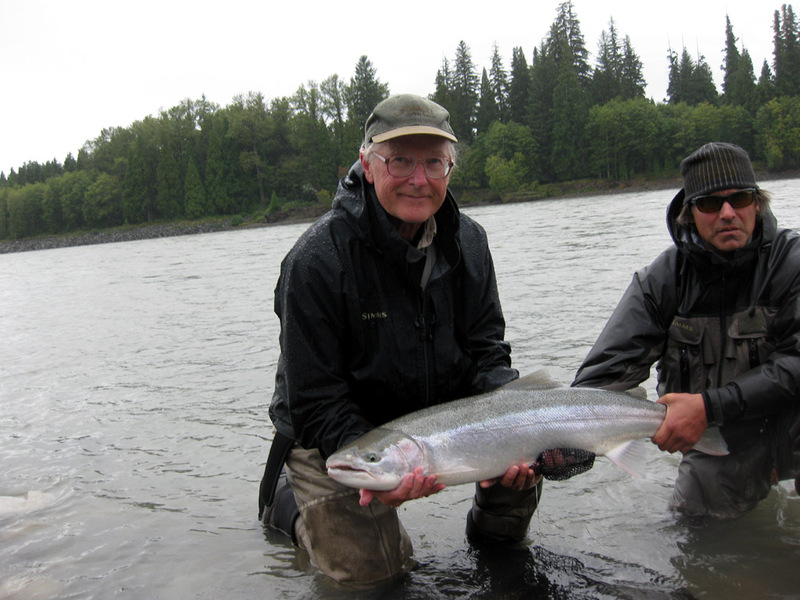 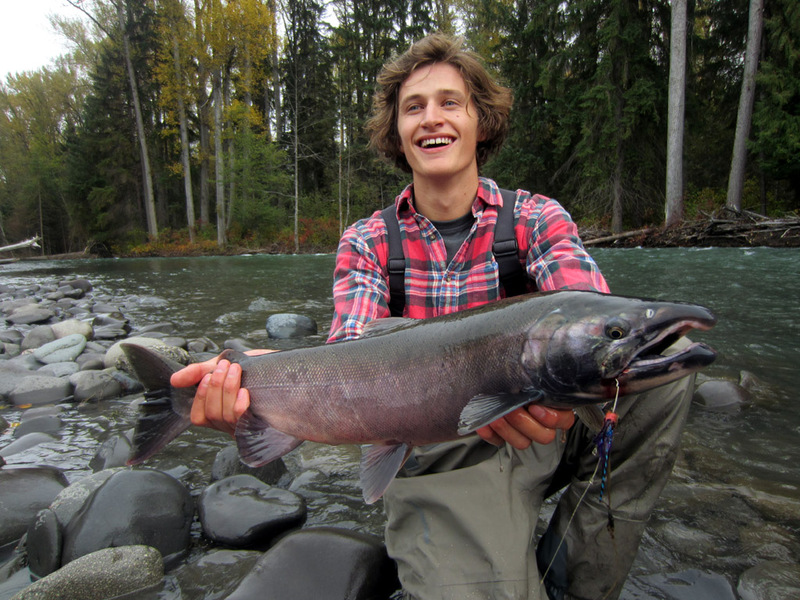 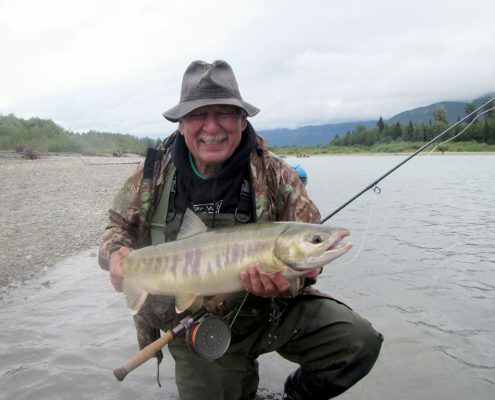 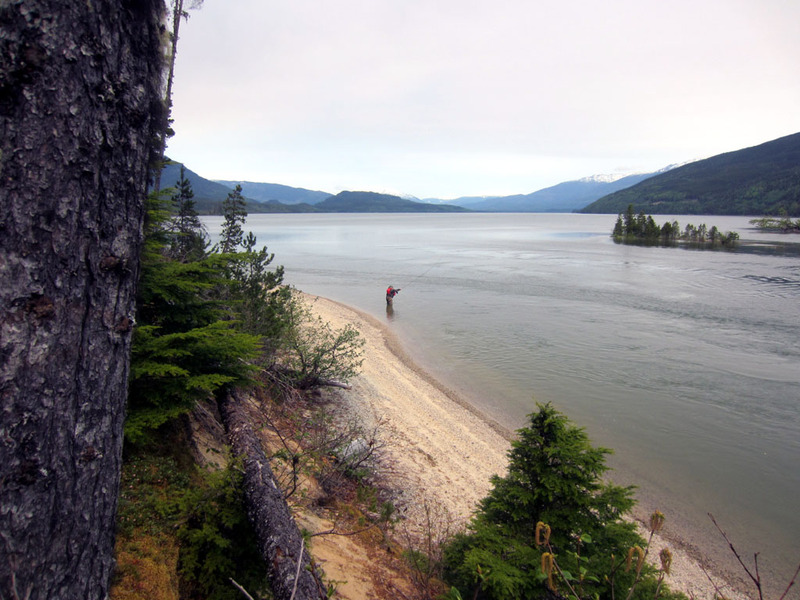 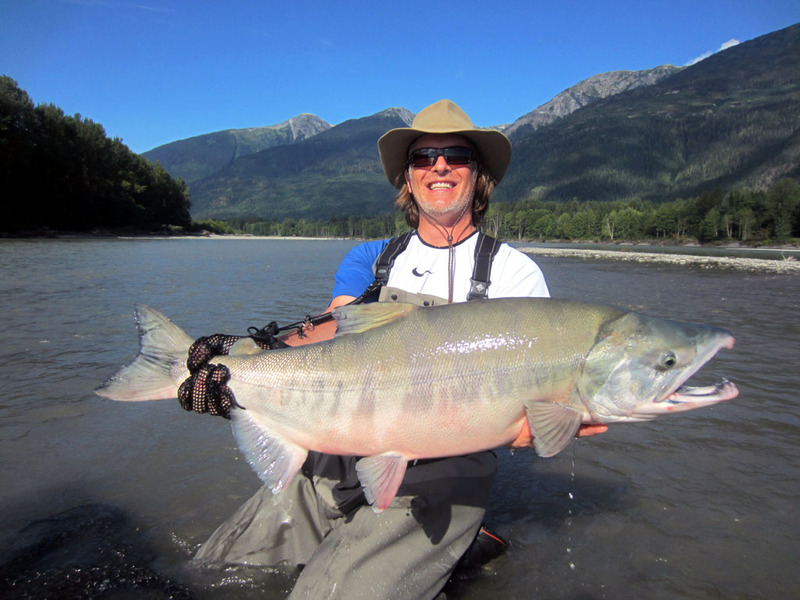 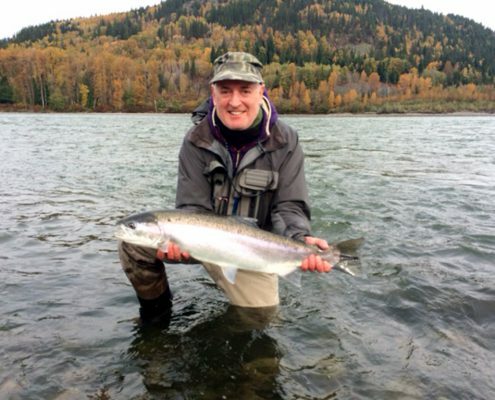 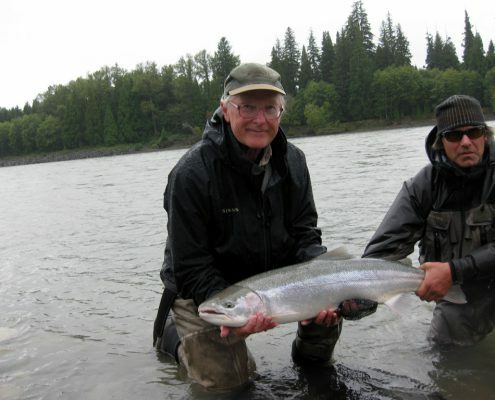 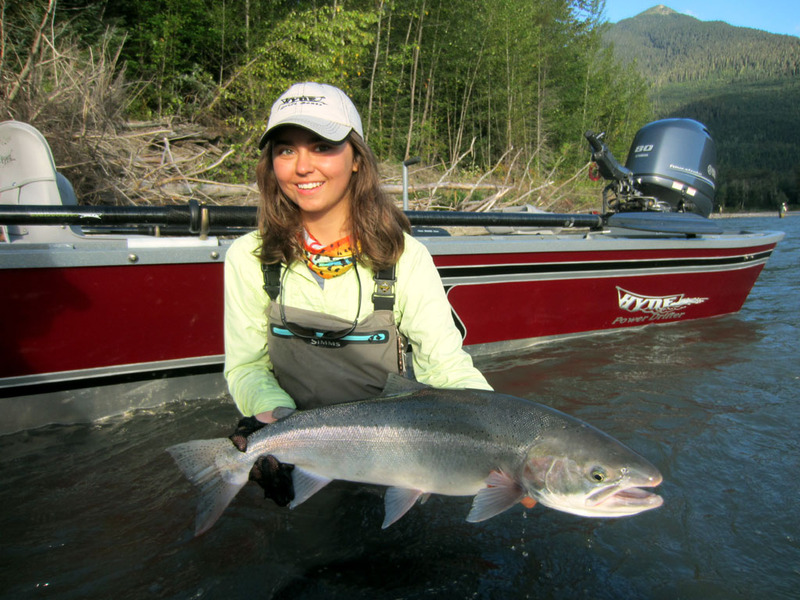 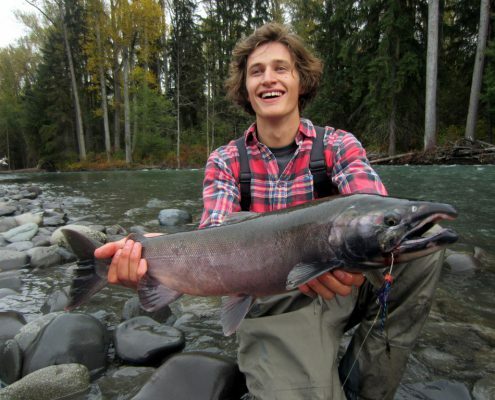 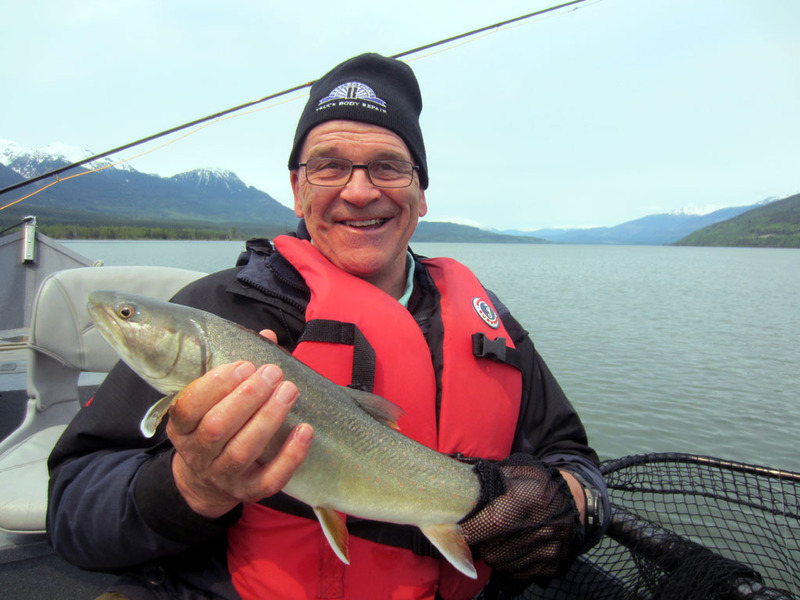 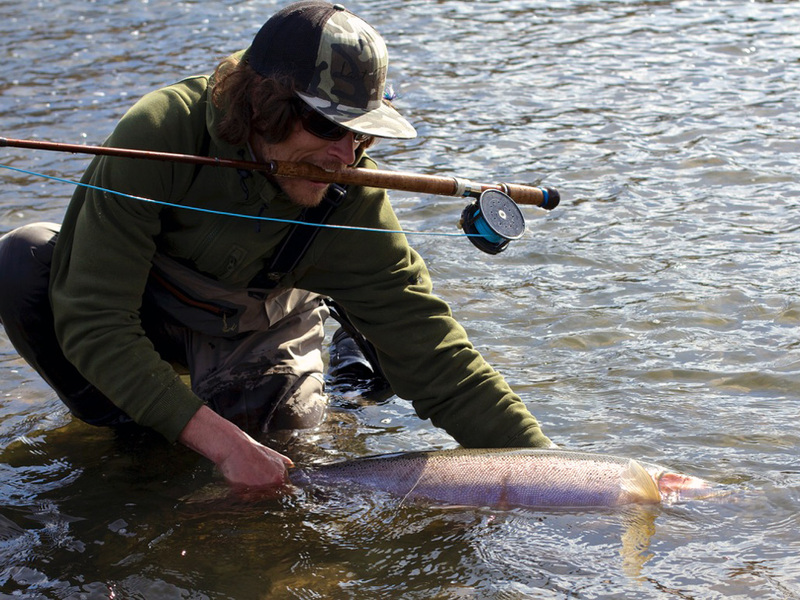 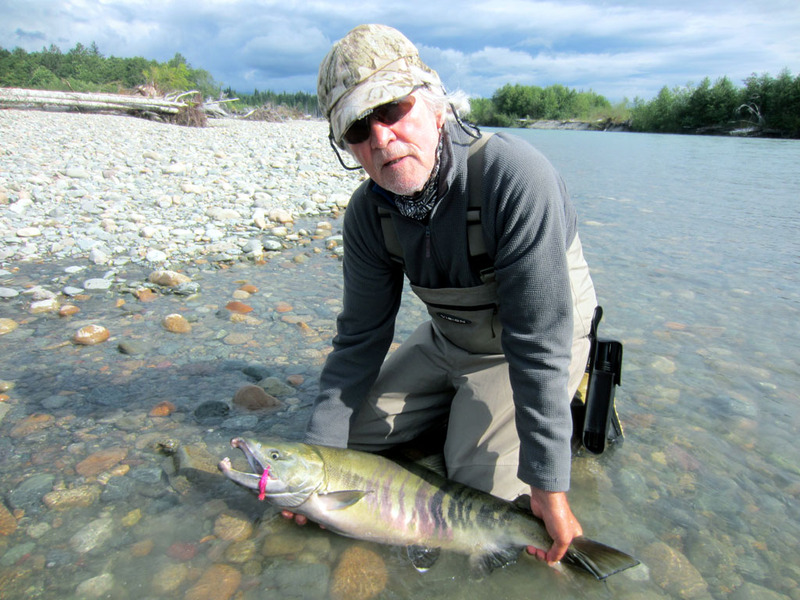 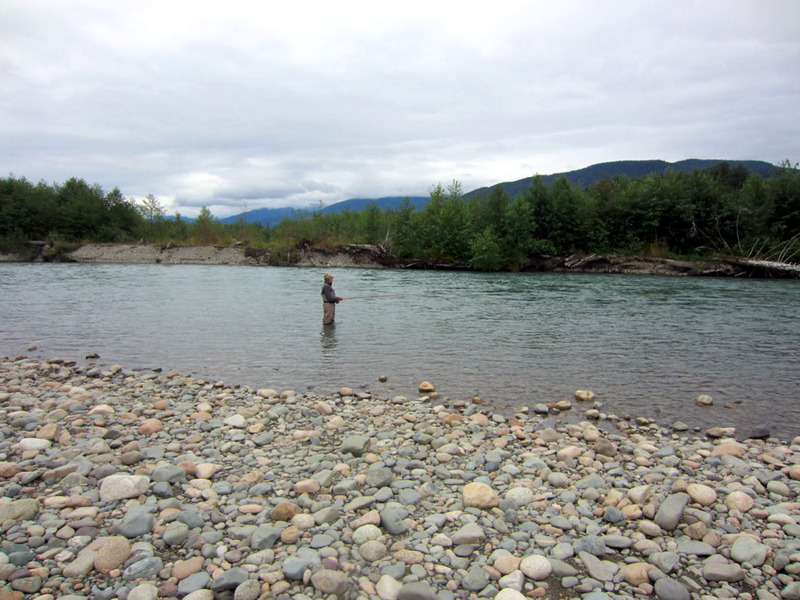 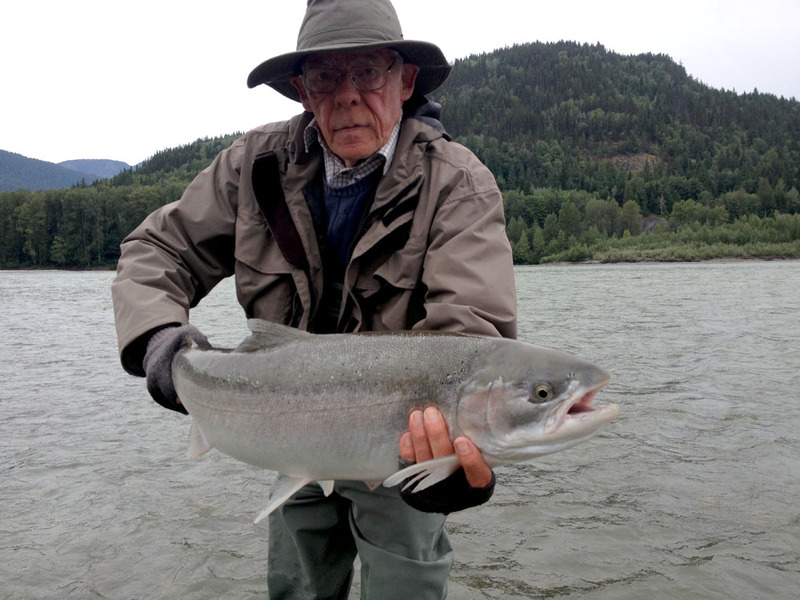 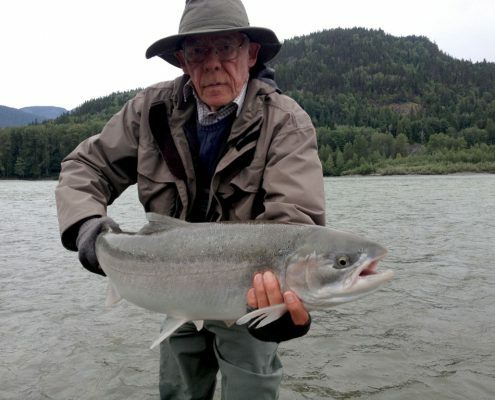 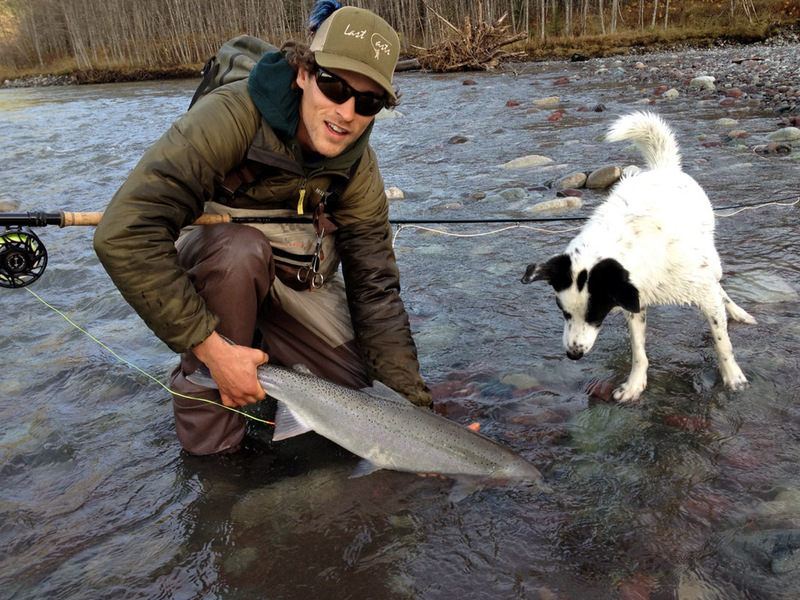 They were back out on the Skeena with their spey rods and into some good fish from day one. 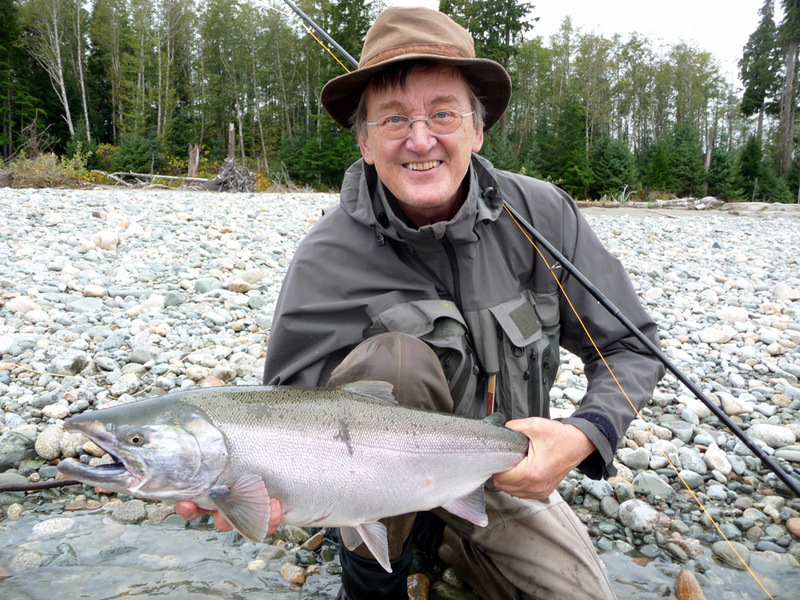 They were joined for the week by John who was back for his fourth year (you may recognize John if you have watched our DVD). 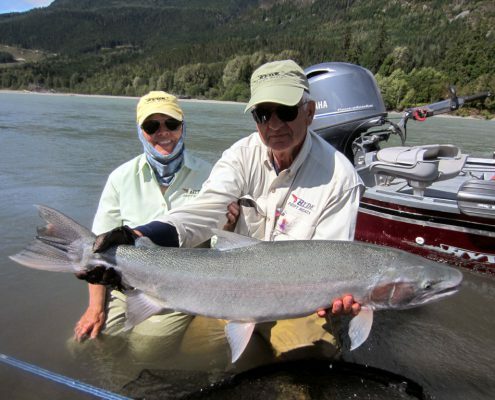 For our first time guests, the fishing exceeded all their expectations. 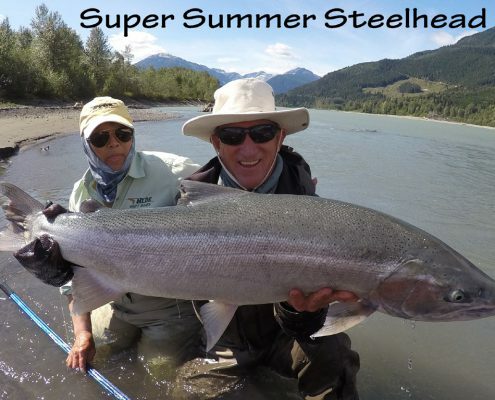 Everyone had a great week catching Sockeye, Chum, Coho and Pink salmon, along with some super Steelhead. 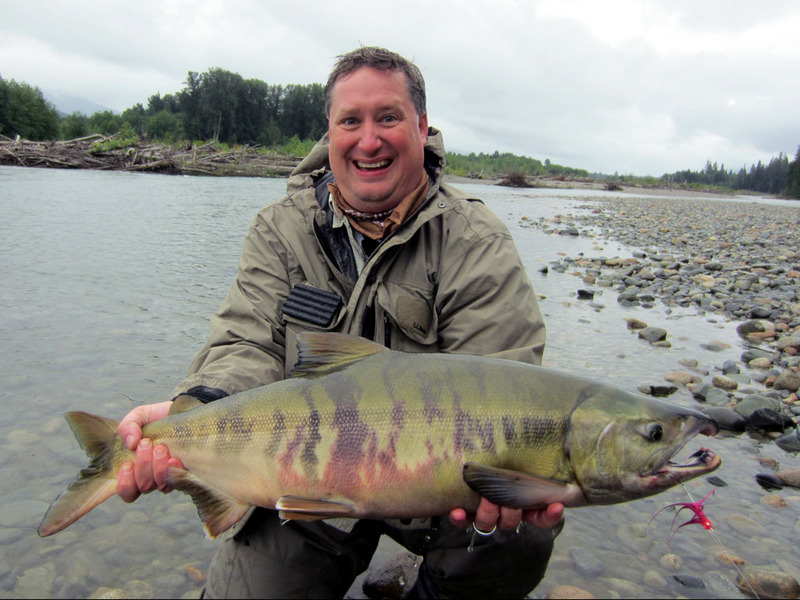 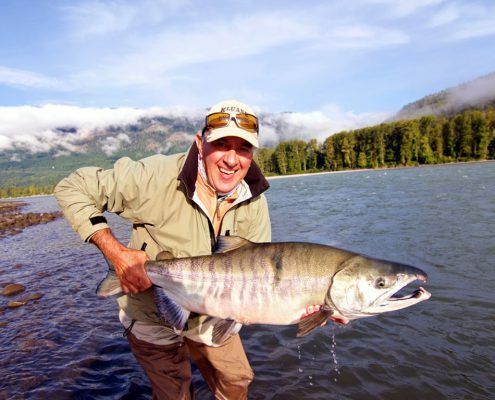 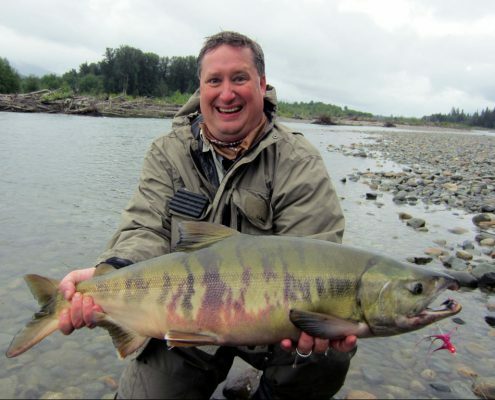 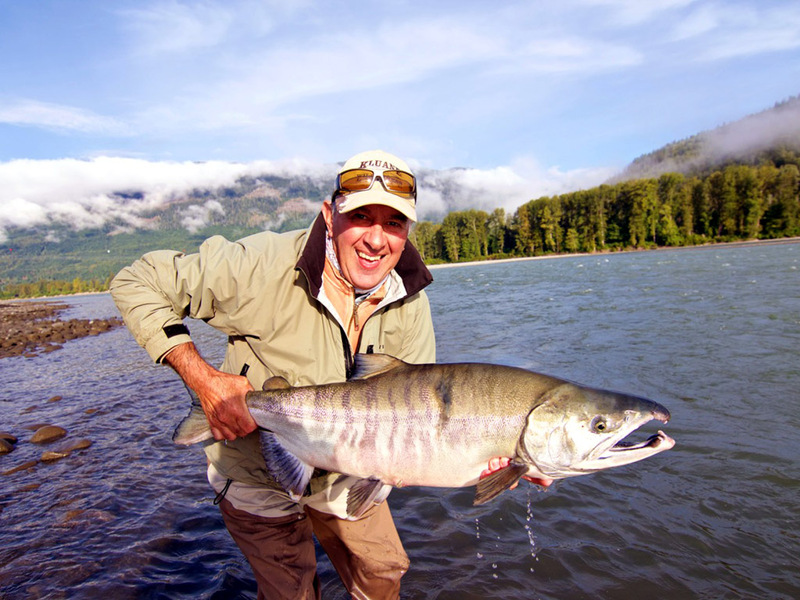 Another action packed week at Kalum River Lodge! 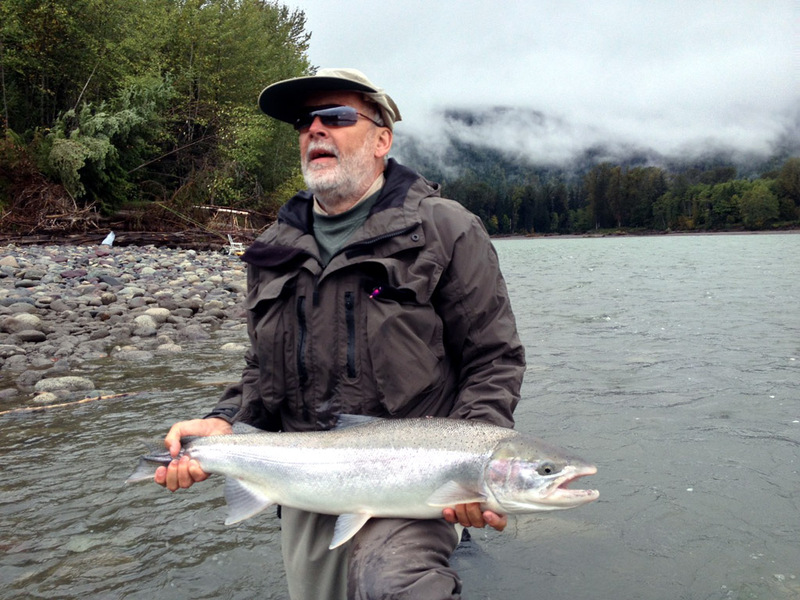 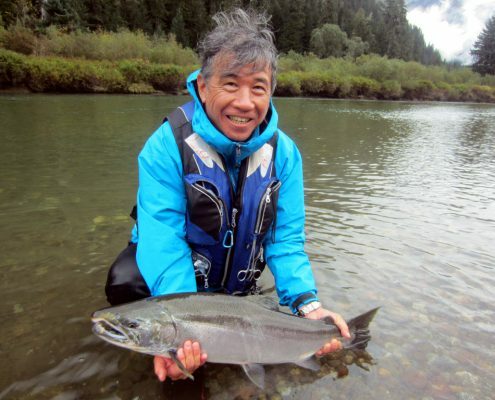 With good numbers of salmon in the rivers, everyone was catching a lot of fish. 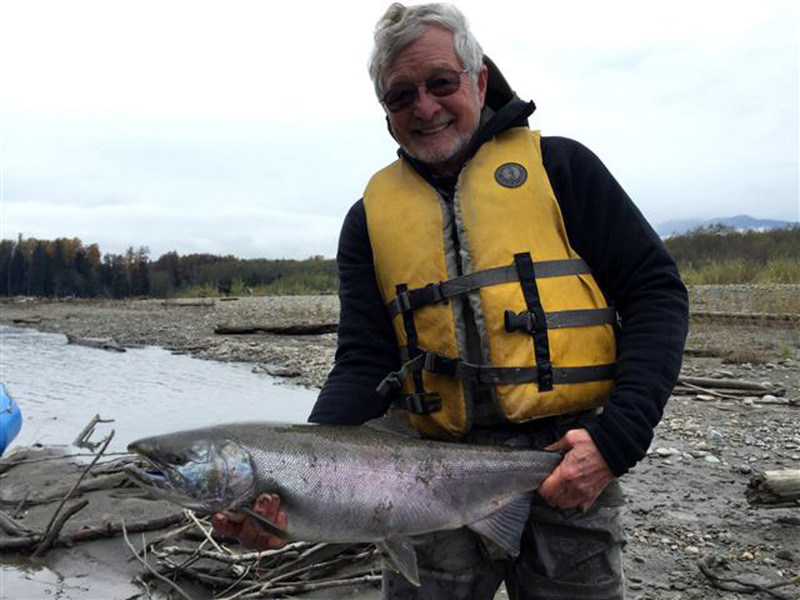 Our anglers enjoyed the challenge of fighting big aggressive Chum salmon and landed many up to 25lb. 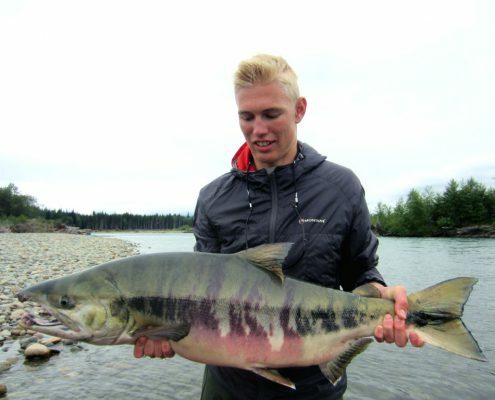 With Chinook, Pink and Sockeye salmon as well the guys had a lot of action. 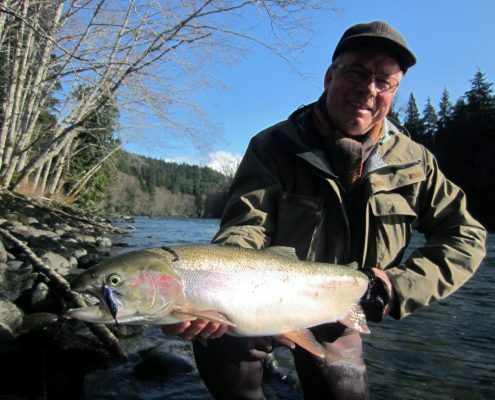 Several anglers brought in some nice Steelhead. 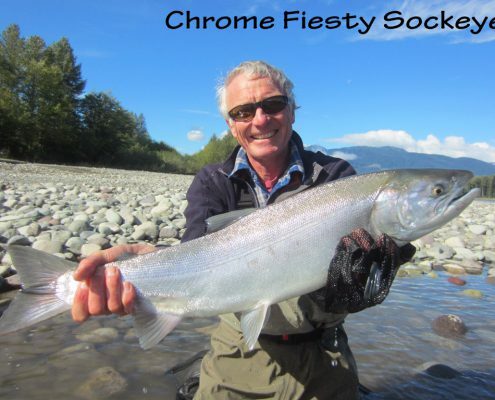 It was a great week and we had a lot of happy customers!!! 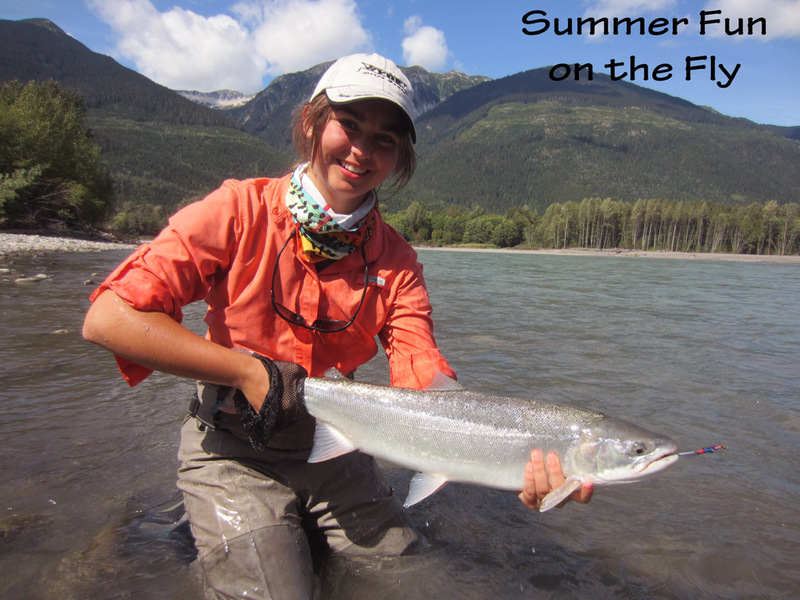 A bit of sunshine, a few showers and a lot of fish! 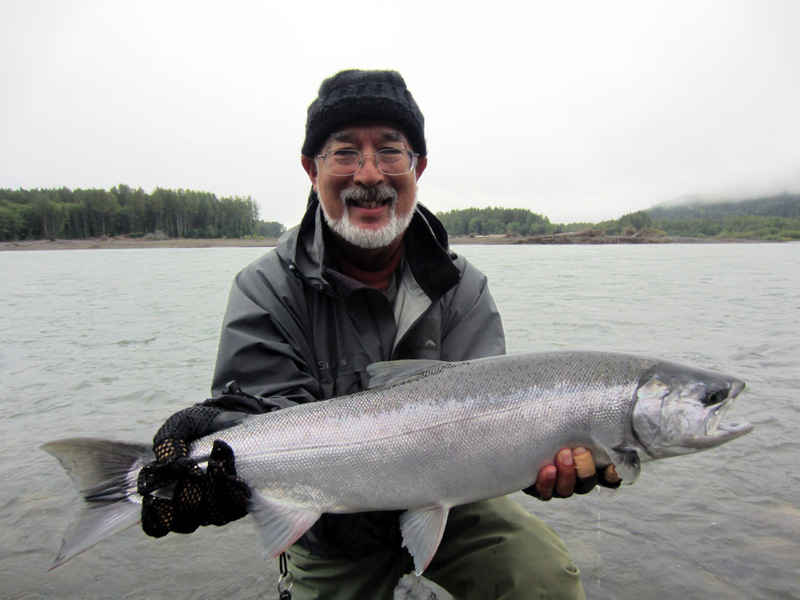 Our new and returning guests this week had a super time and a variety of fish. 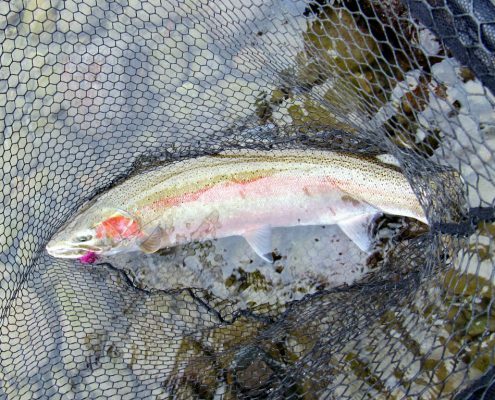 Although we hooked most of the fish species not all cooperated in coming to the net. 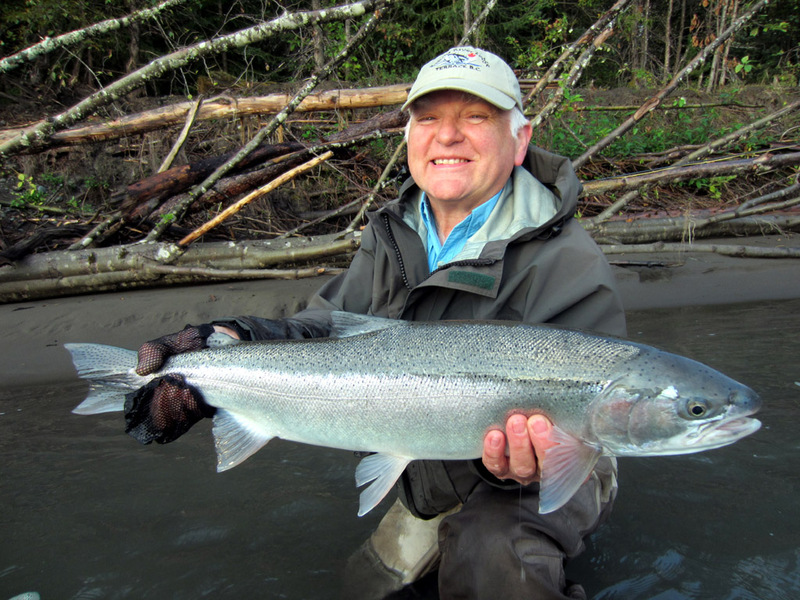 We have had good numbers of early Steelhead and are excited with the prospects for the coming weeks. 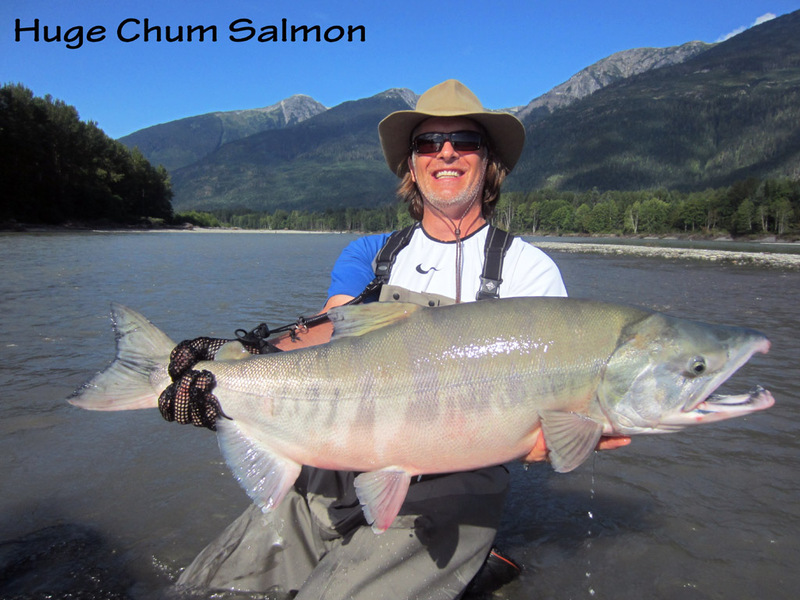 It’s been a real Salmon Festival this week with good numbers of Chinook, Chum, Pink and Sockeye being caught. Catches of a few early Steelhead have added to the excitement. 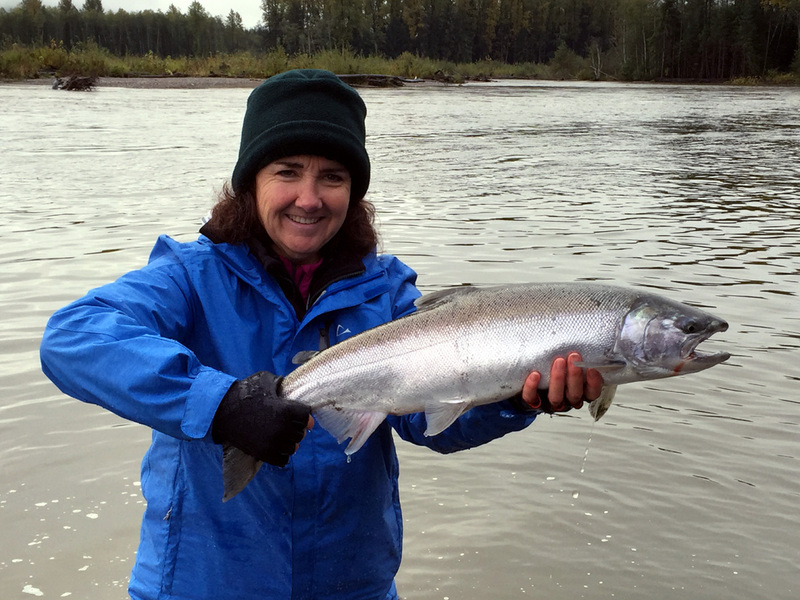 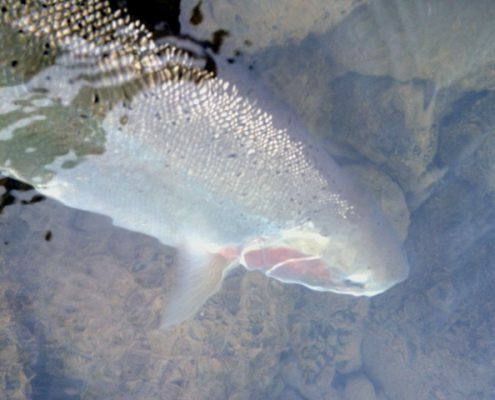 Cooler temperatures with a bit of rain has been bringing fresh fish up the rivers. 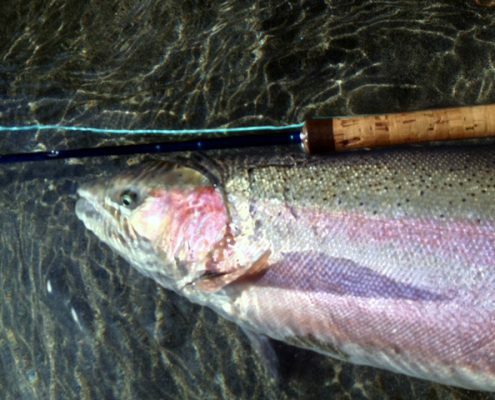 This is a great time of year to catch a lot of fish and test your skills against a variety of species. 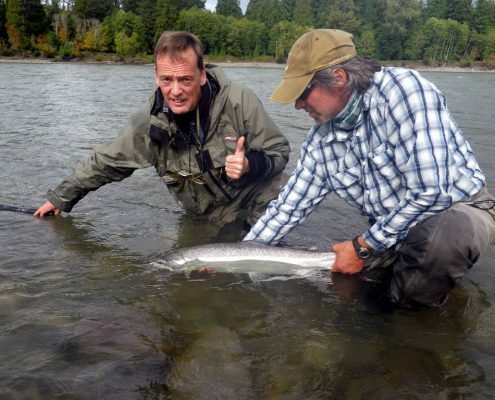 As you can see our guests were having a lot of fun! 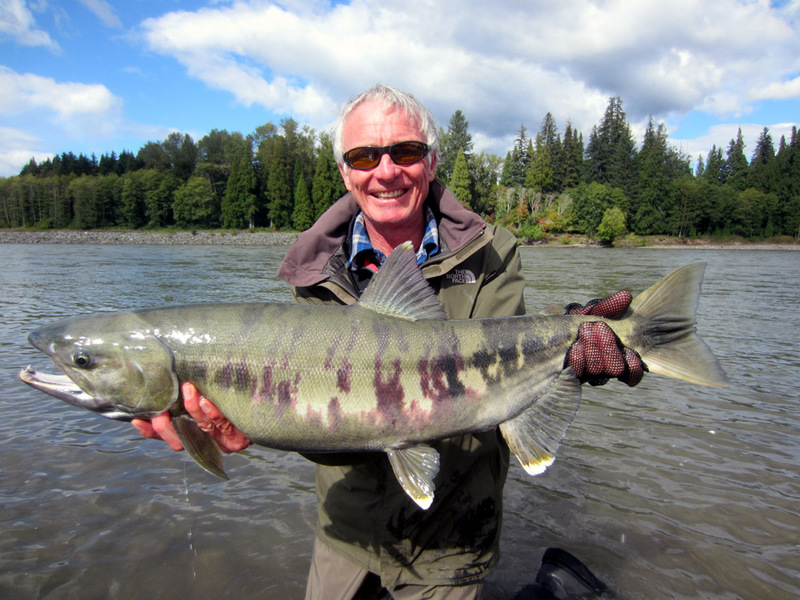 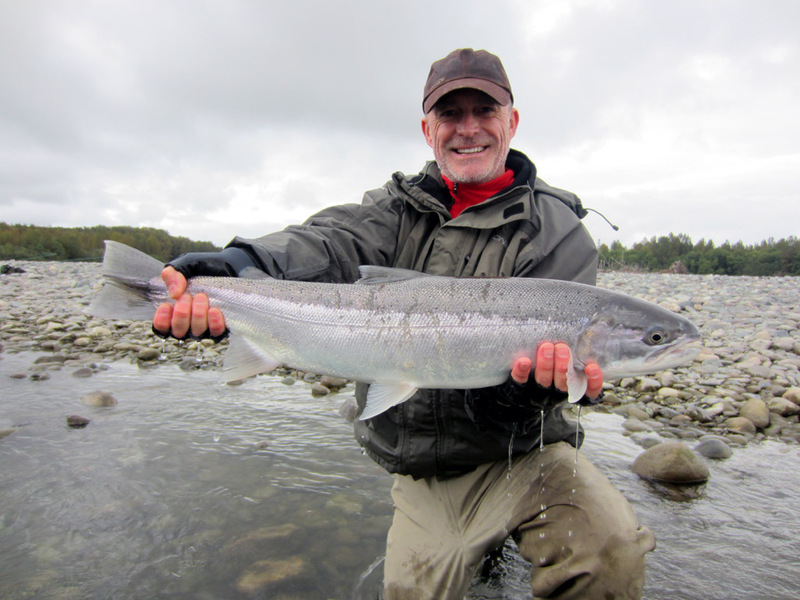 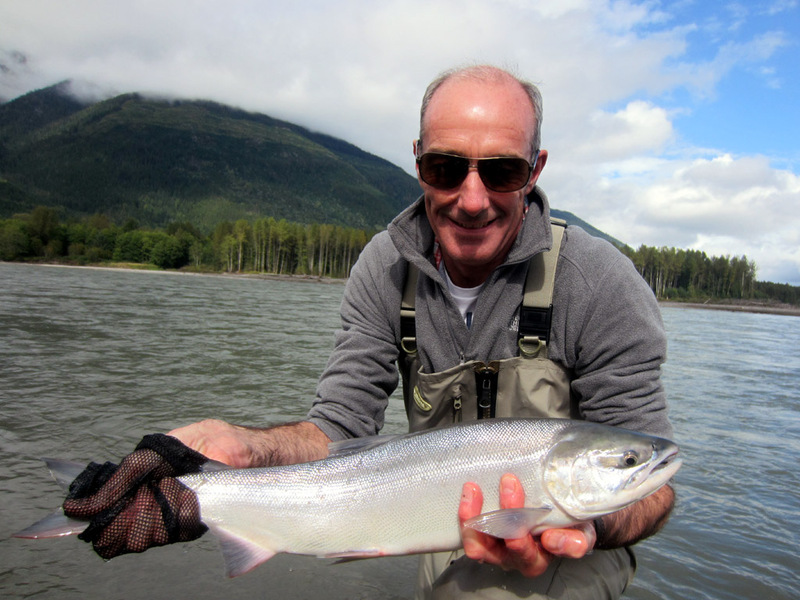 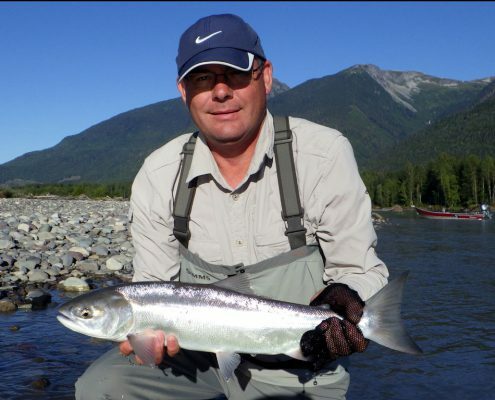 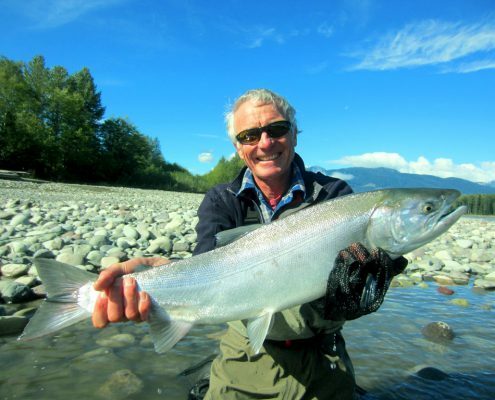 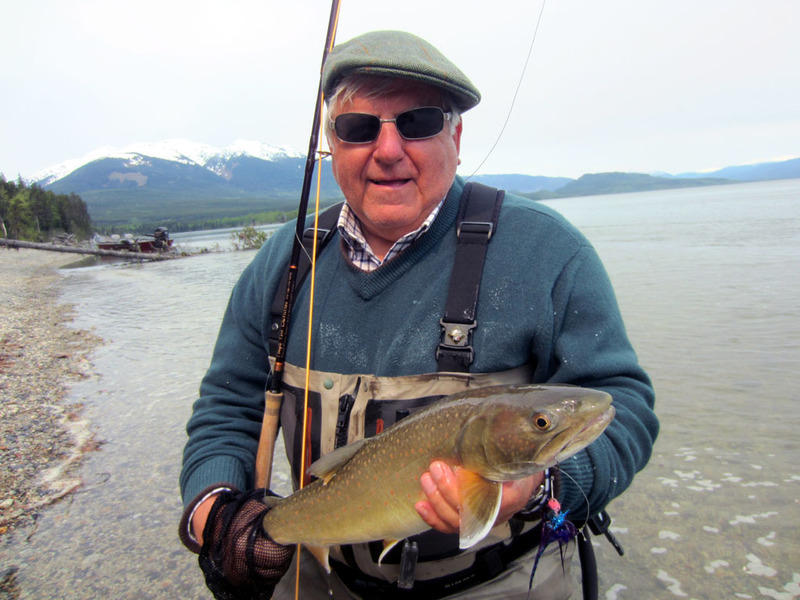 Kalum River Lodge’s guide Glen Kilcup has been out fishing on his favourite coastal river. 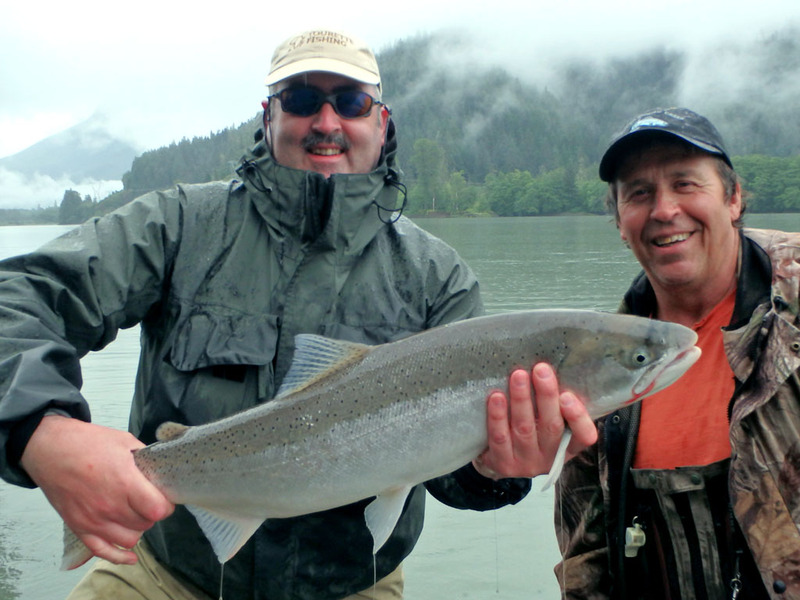 With stunning scenery and great fishing the guys had a memorable day. 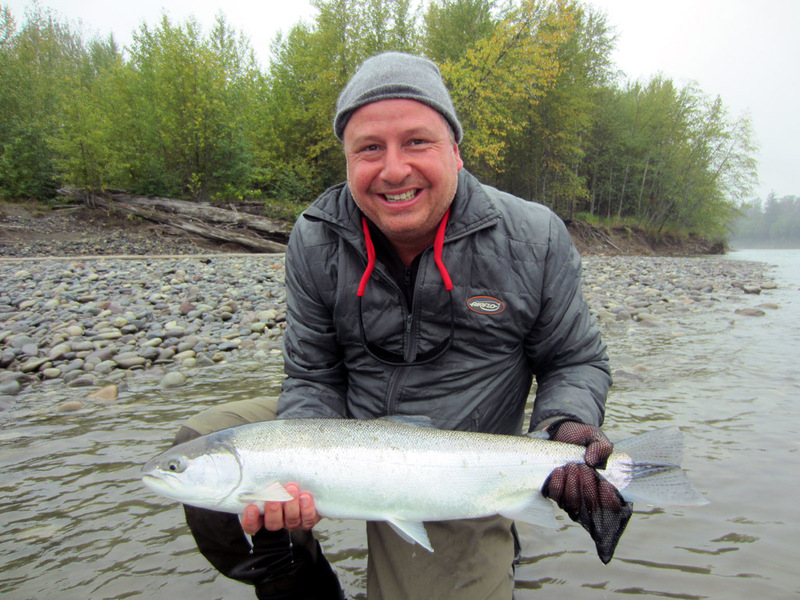 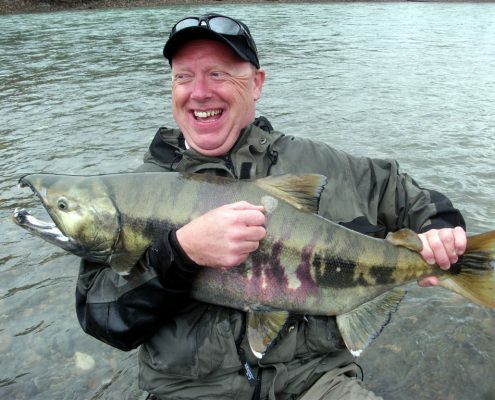 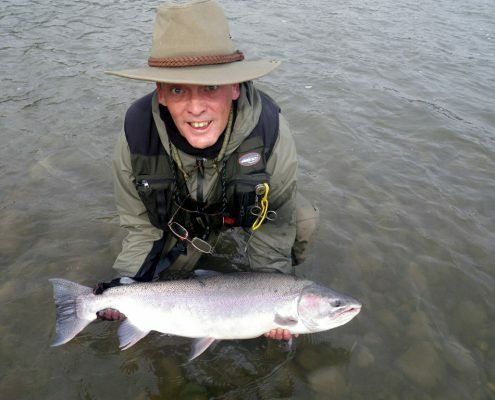 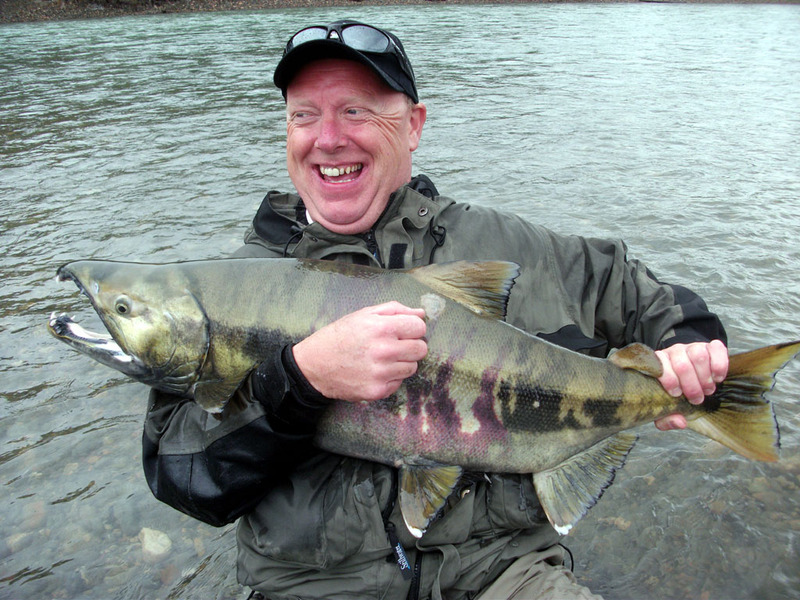 Chinook fishing continues to be good at Kalum River Lodge. 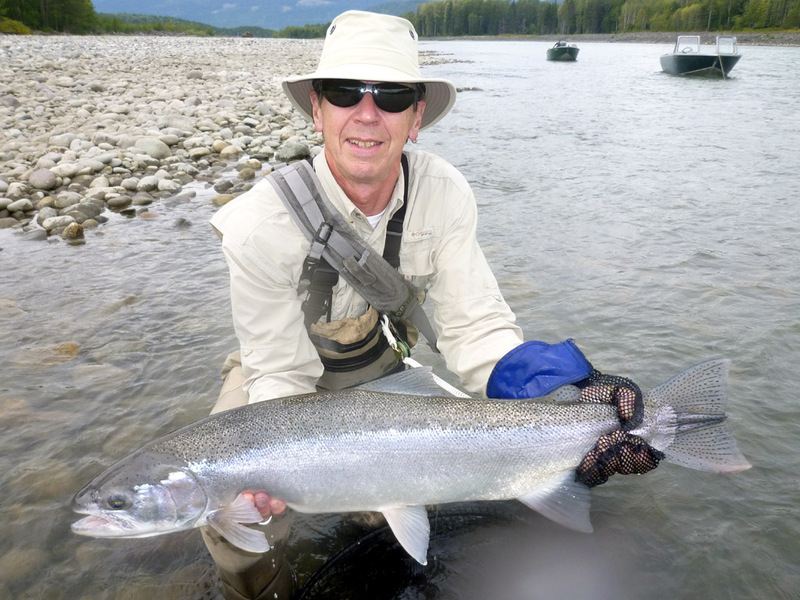 Most of our favourite rivers are showing strong runs of Chinook resulting in good catches for our anglers. 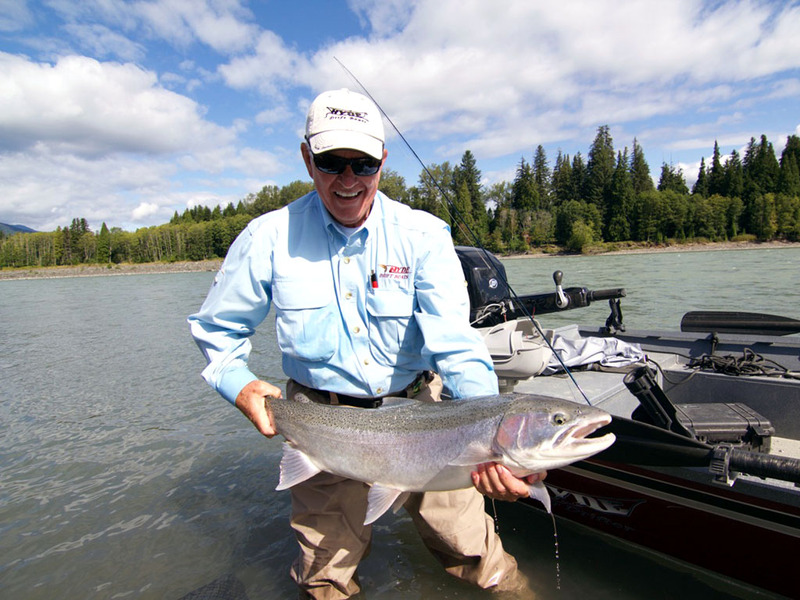 This time of year anglers have the opportunity to fish a large variety of rivers for trophy Chinook. 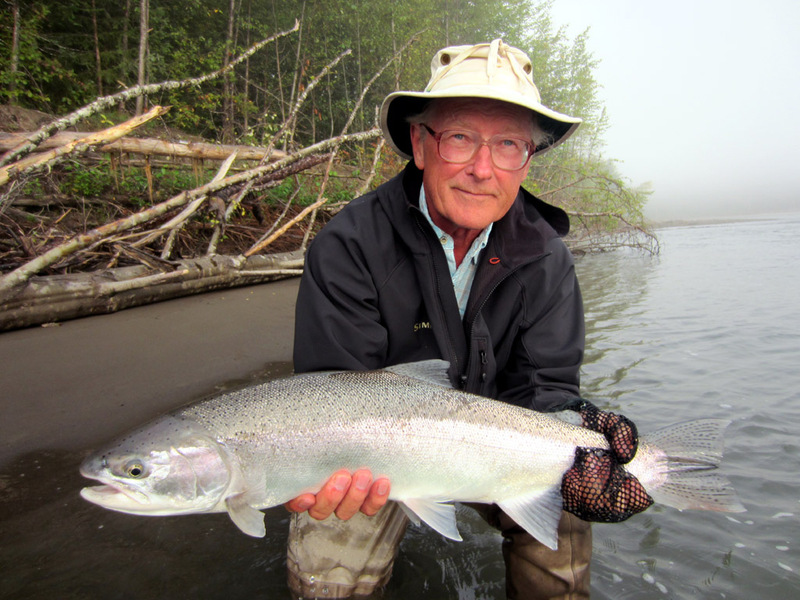 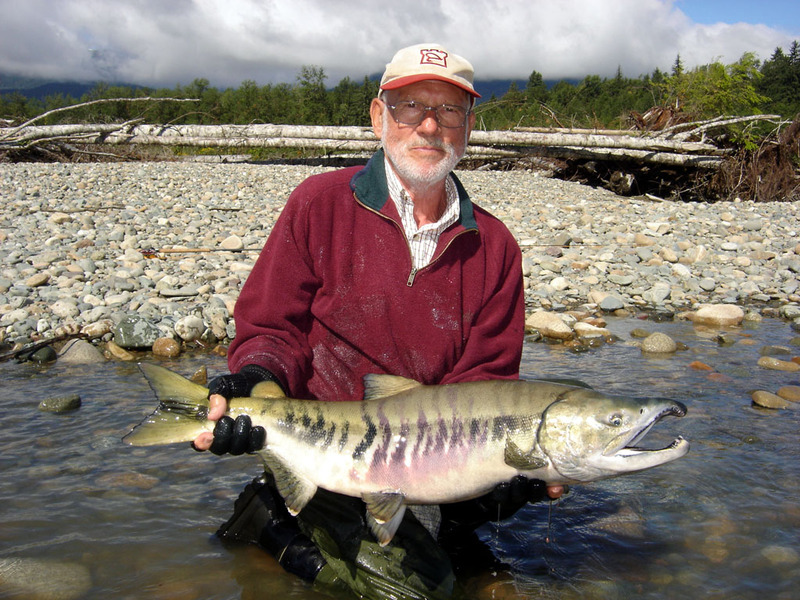 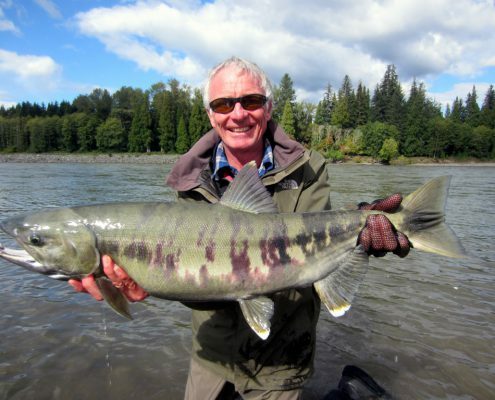 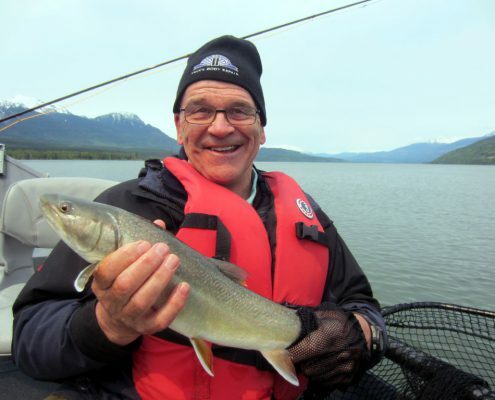 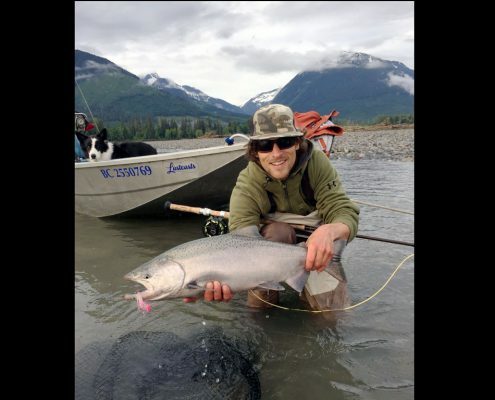 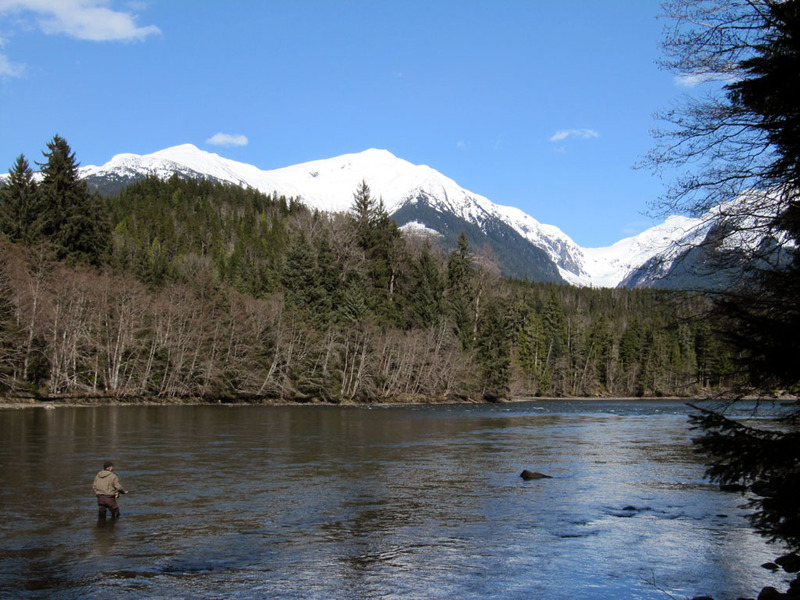 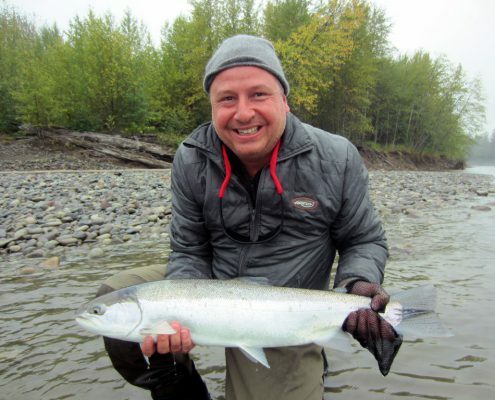 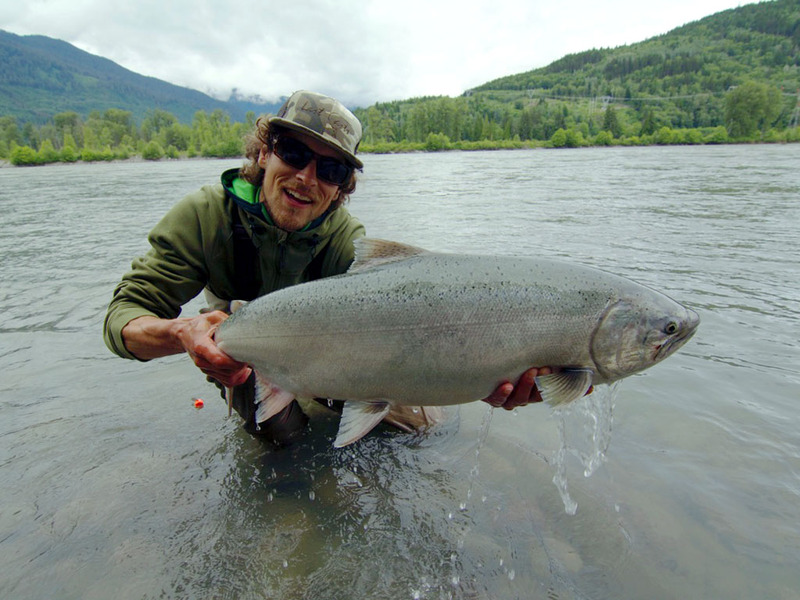 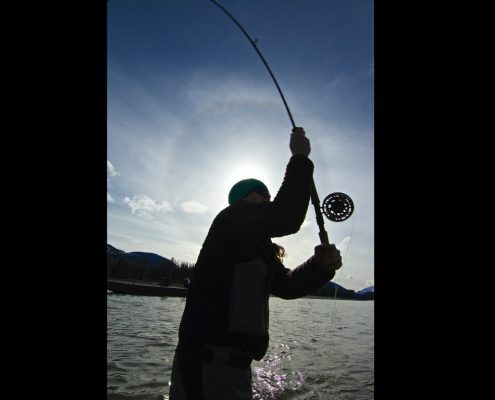 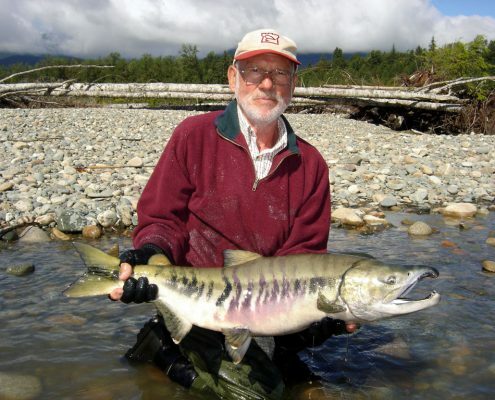 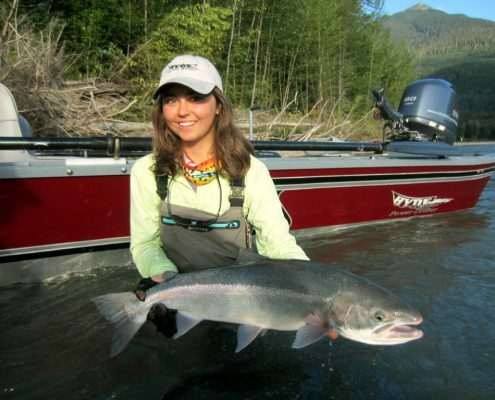 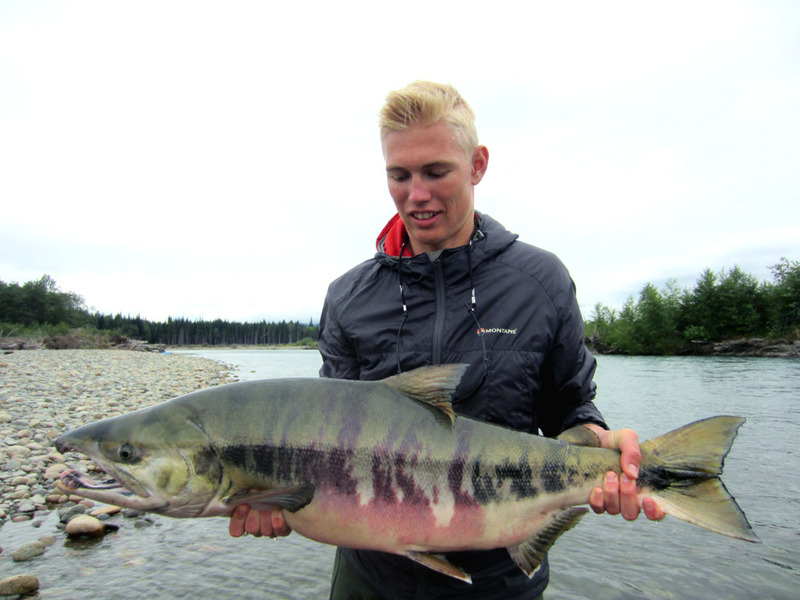 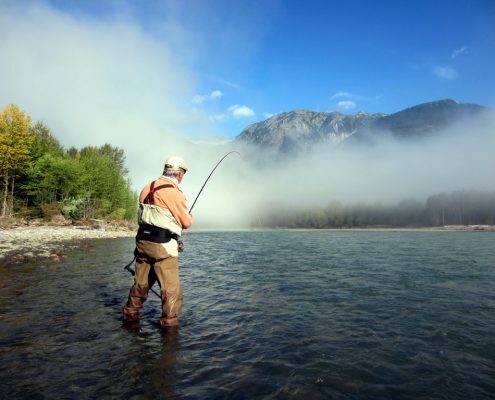 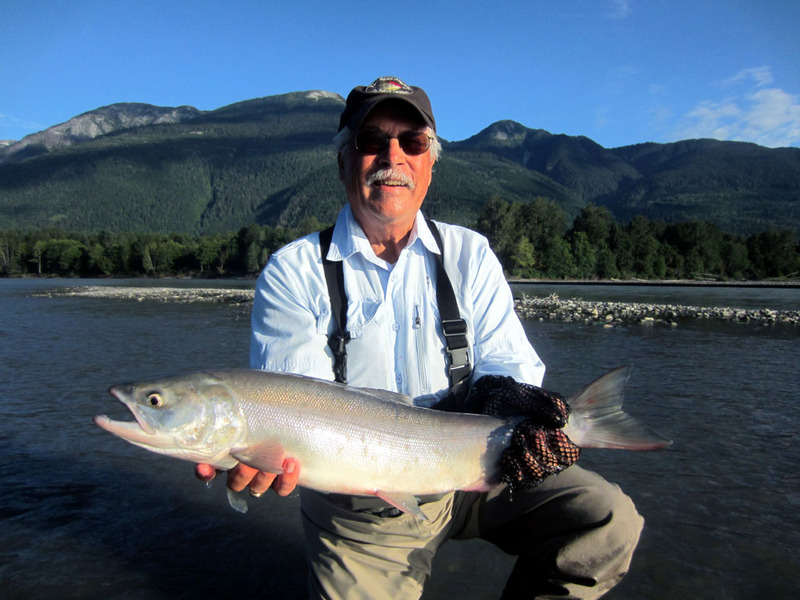 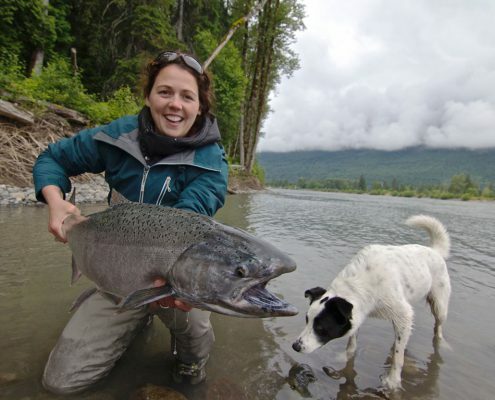 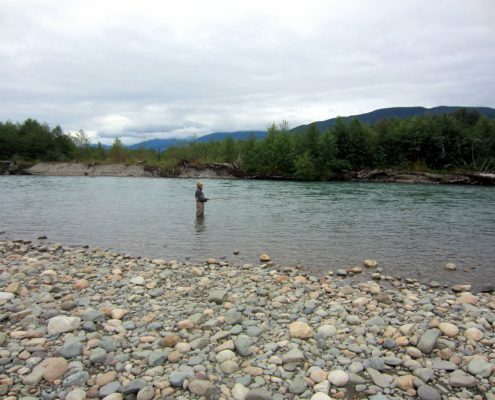 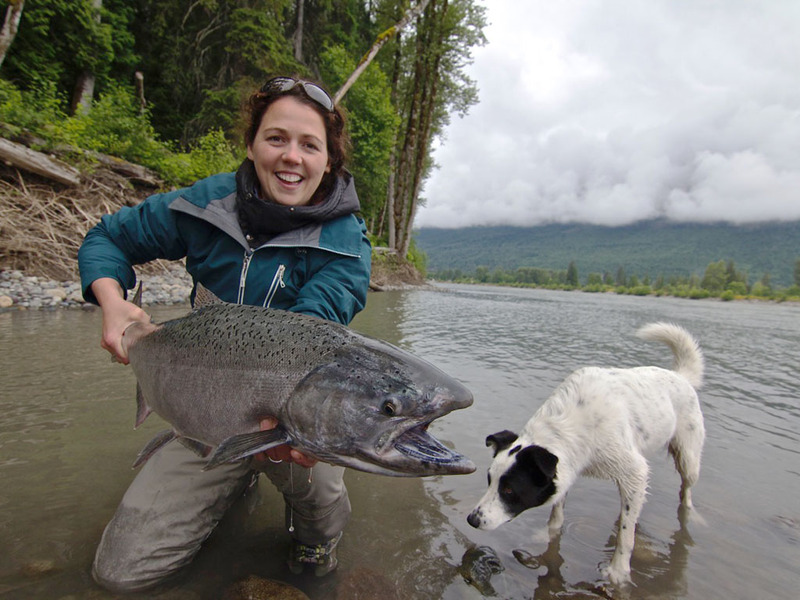 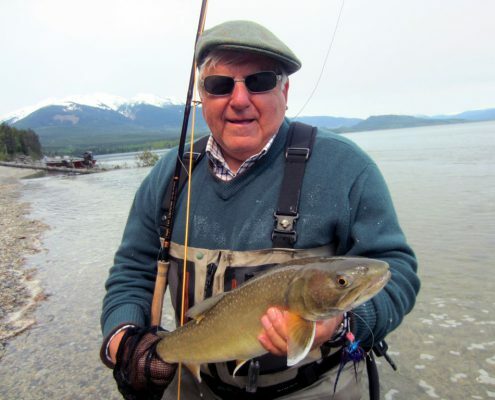 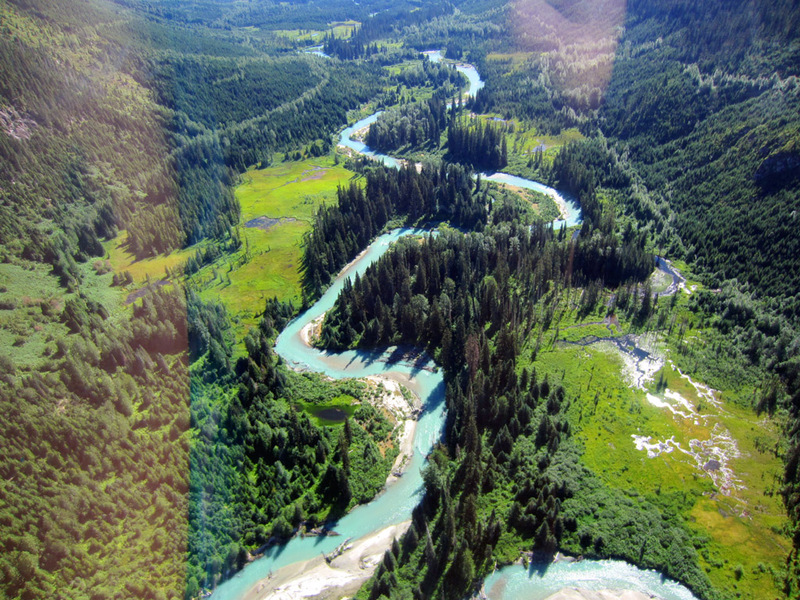 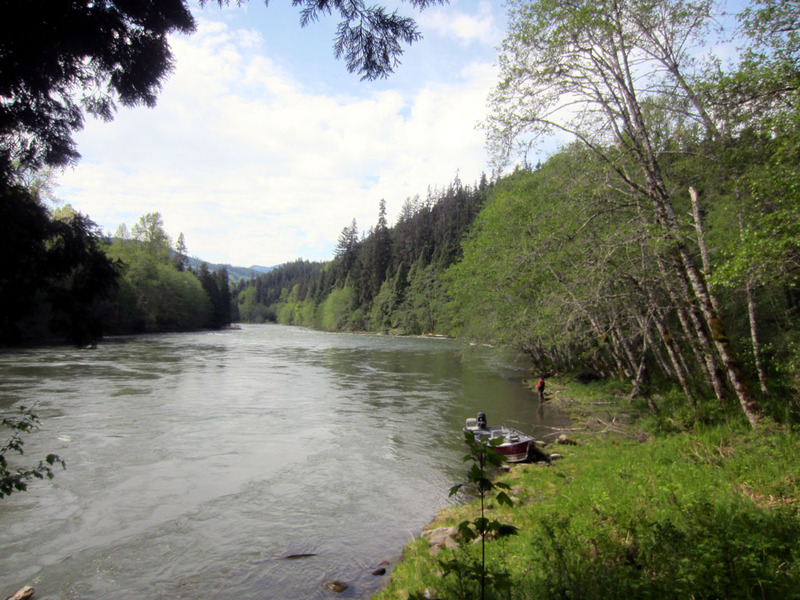 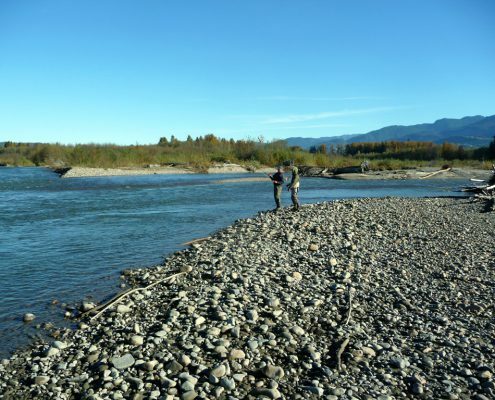 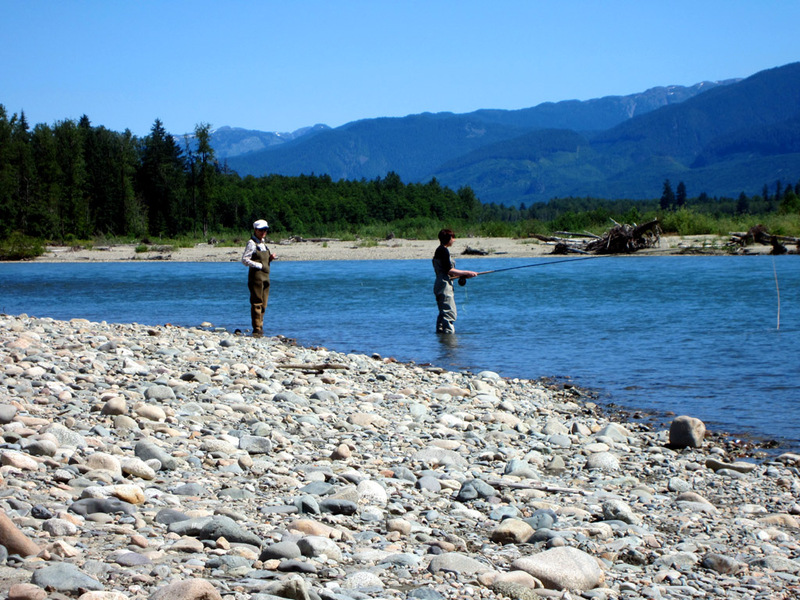 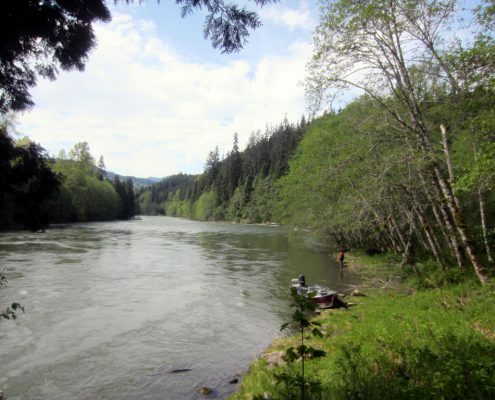 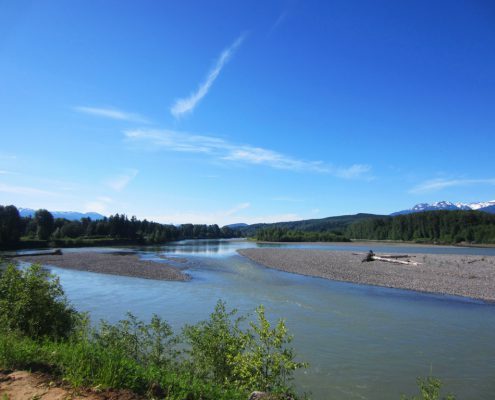 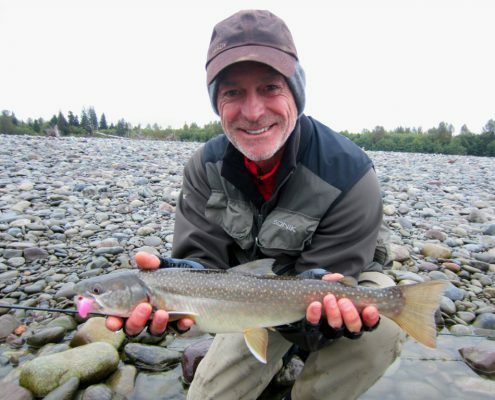 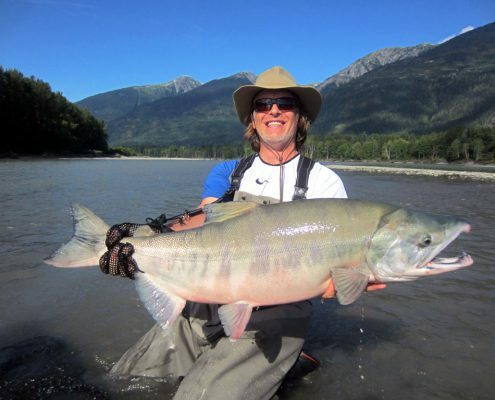 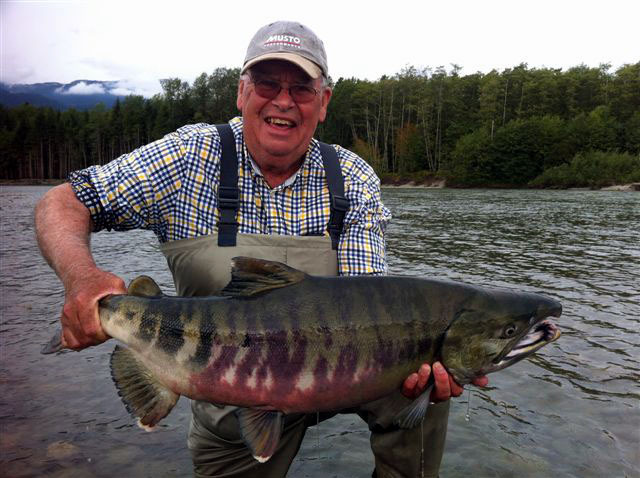 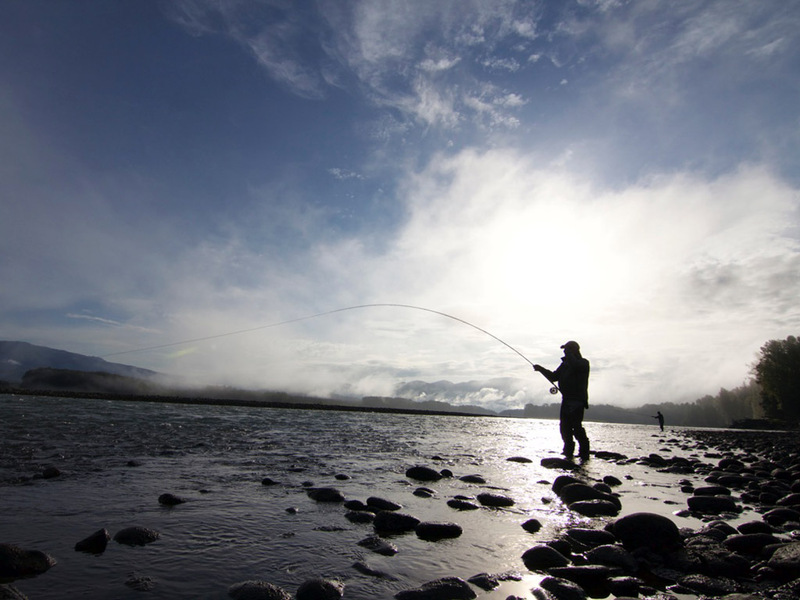 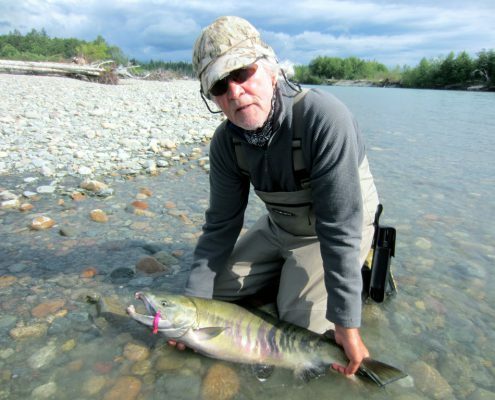 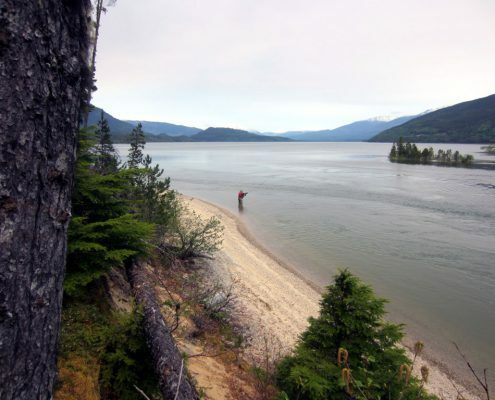 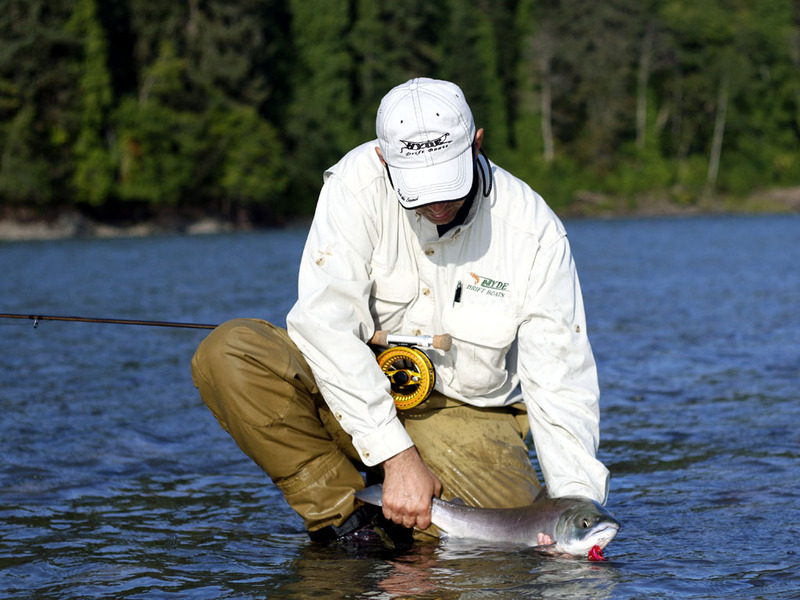 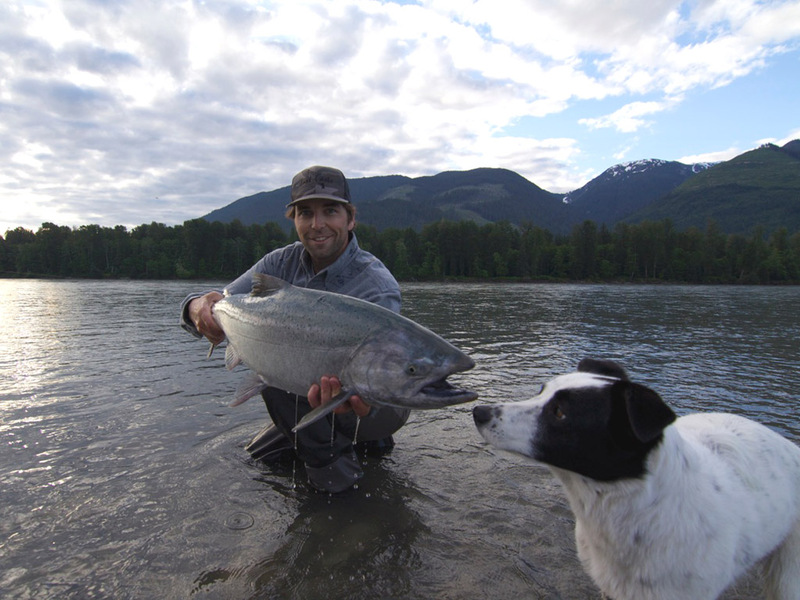 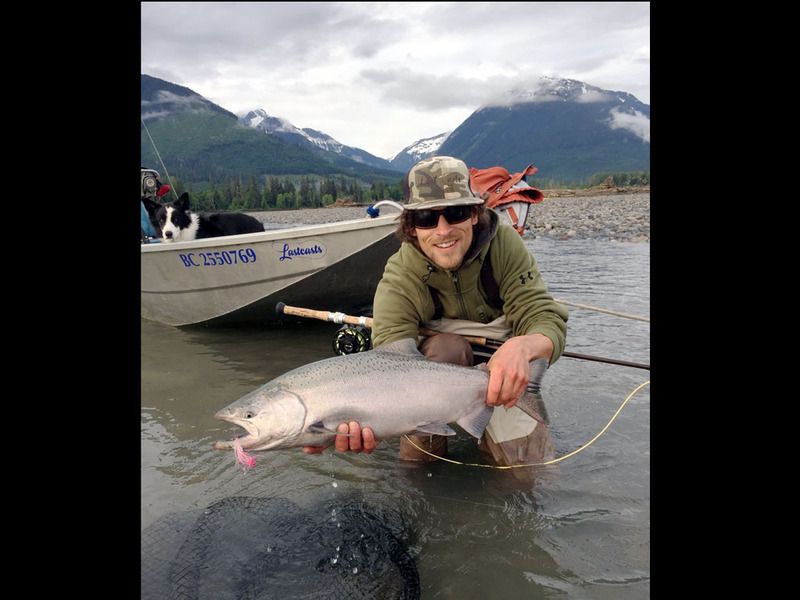 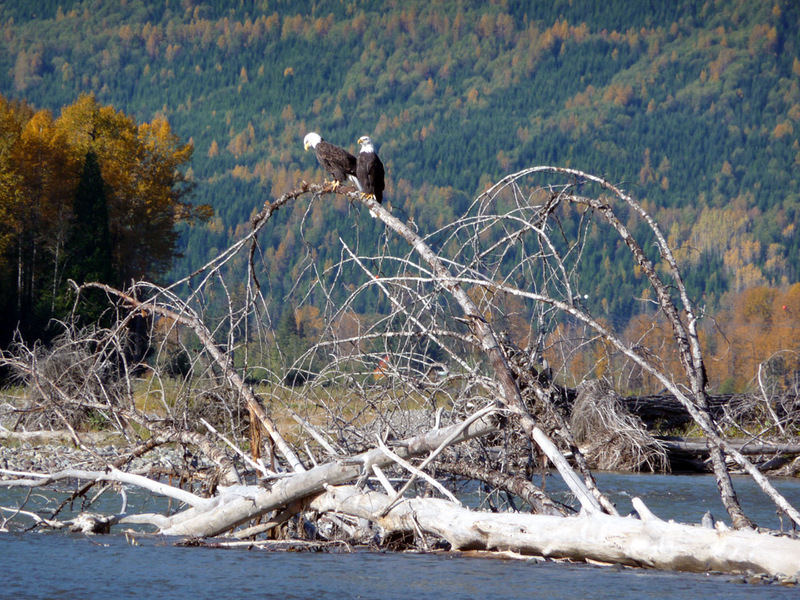 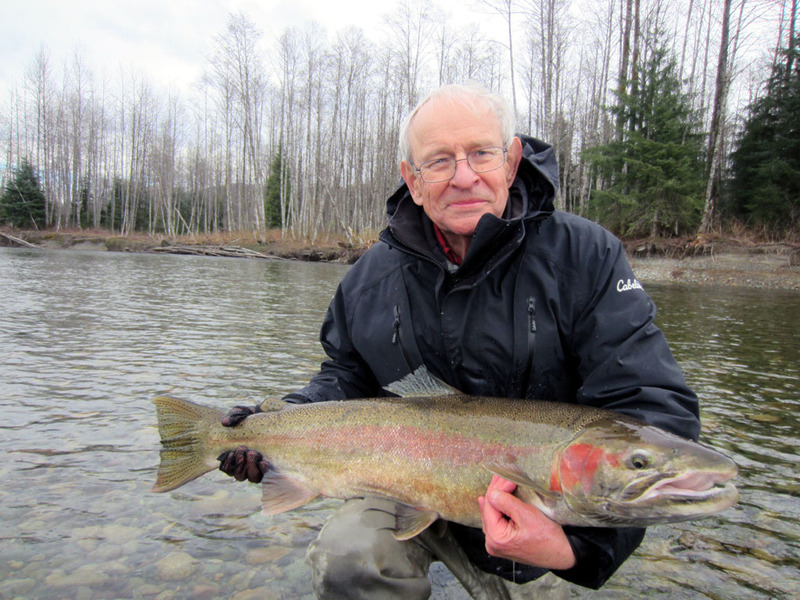 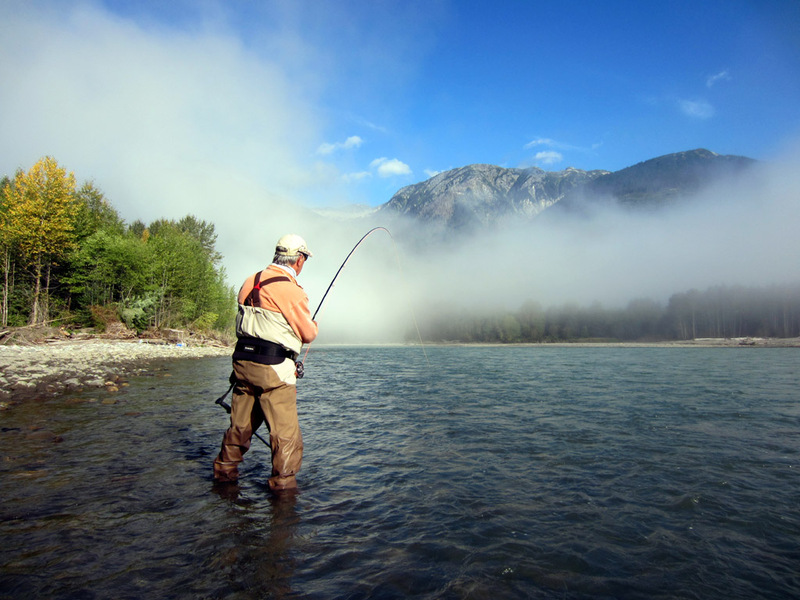 From big rivers like the Skeena to small coastal rivers there is something for every type of angler. 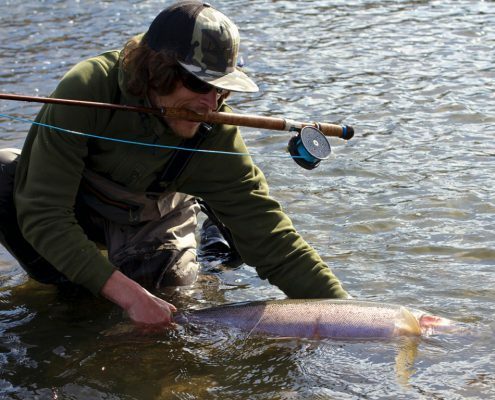 Whether you prefer long spey casts or stalking giant Chinook in small clear pools, these are all possibilities during your stay with us. Despite the high temperatures and bright sun we are still catching some very nice fish. 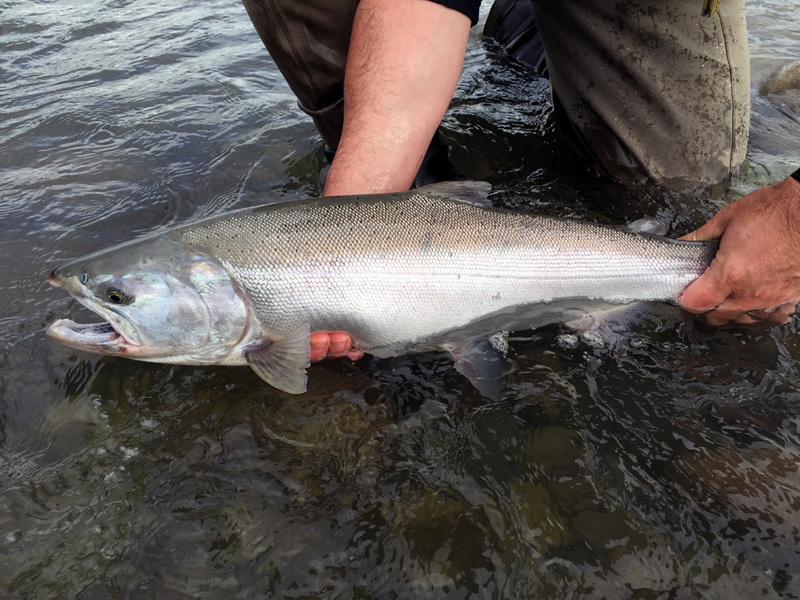 Chinook numbers have been good so far this season and we are looking forward to the arrival of all the other salmon species in the next couple of weeks. 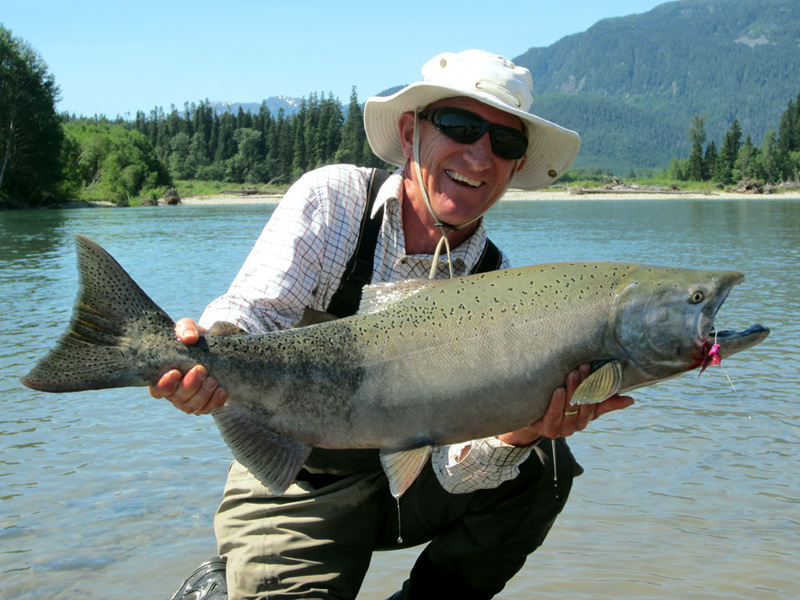 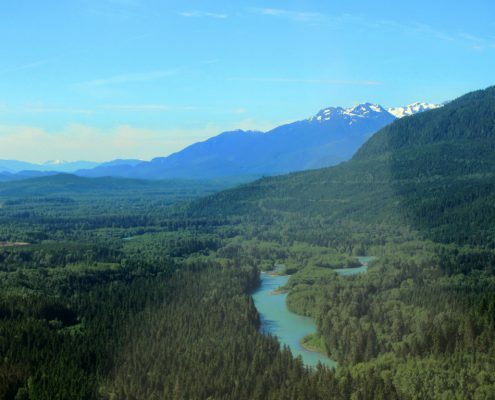 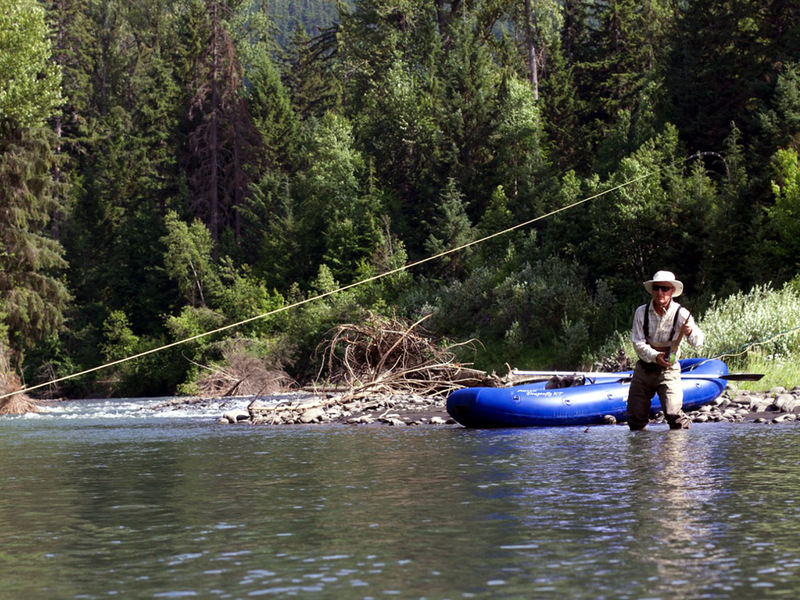 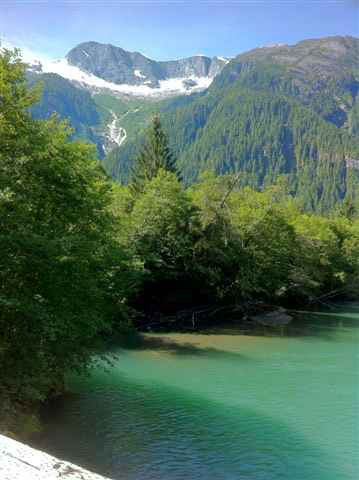 Kalum River Lodge offers helicopter fishing trips for our more adventurous anglers. 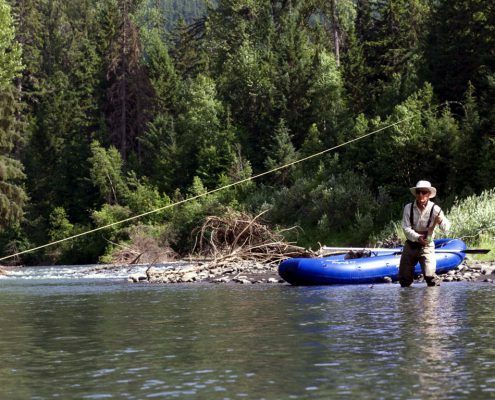 Its a great way to access some seldom fished streams and see some breathtaking scenery. 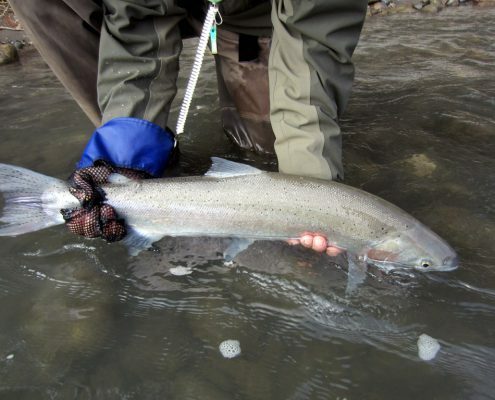 Here are a few shots from our last fly trip. 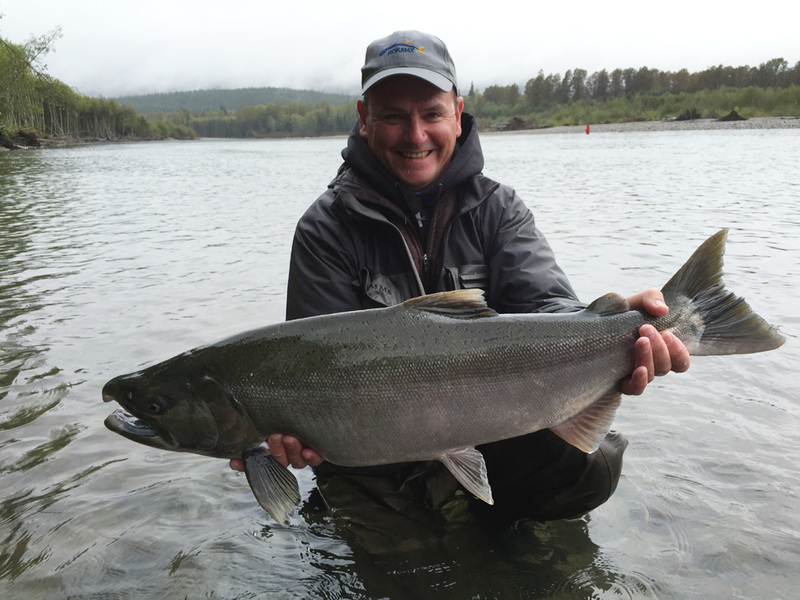 The last couple of weeks have provided some excellent early season Chinook fishing. 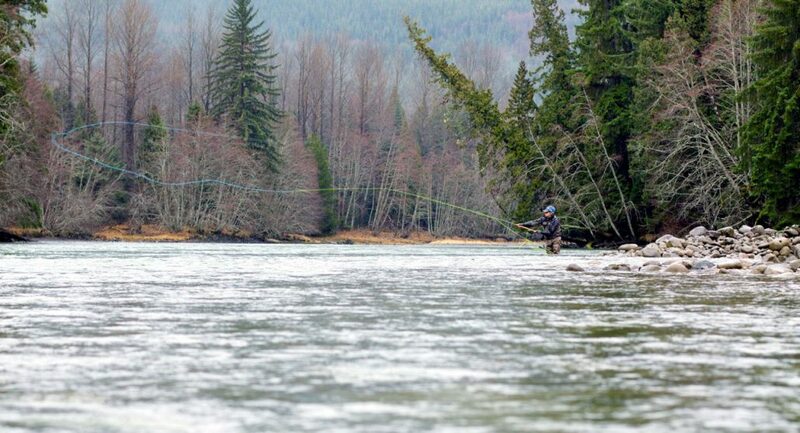 The combination a warm spring and low snow pack have brought the rivers into shape early. 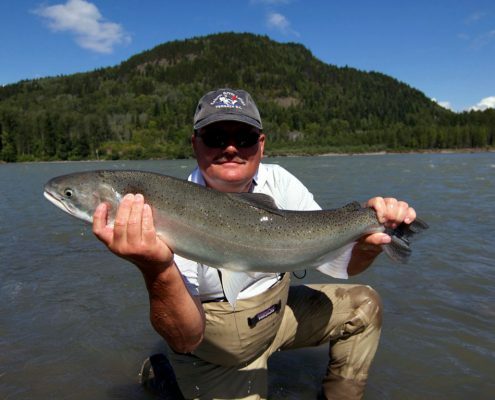 Several of our favourite spots are fishing well and our guides are ready for the summer season. 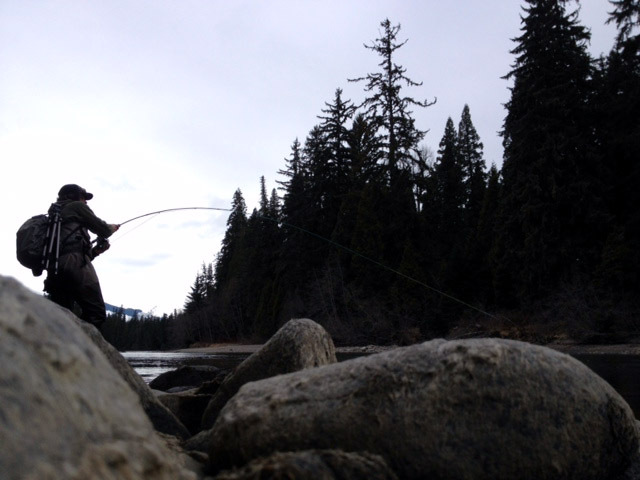 Here are a few photos from the last couple days. This was the last week of our spring Steelhead season. 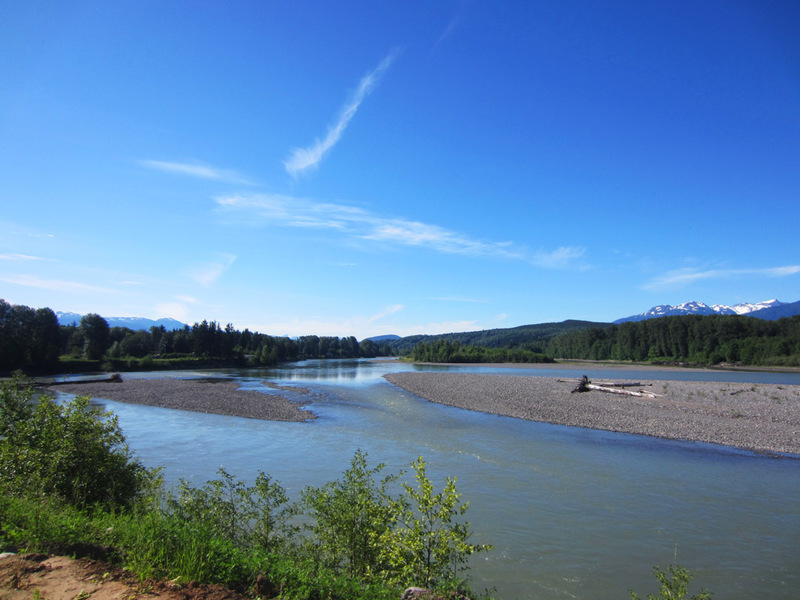 With the warmer temperatures over the last week the rivers have been rising fast. 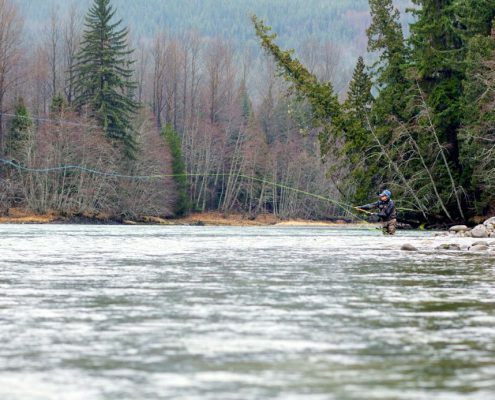 The timing of our anglers’ trip worked out well – the last few days before the rivers start to rage with the spring snow melt. 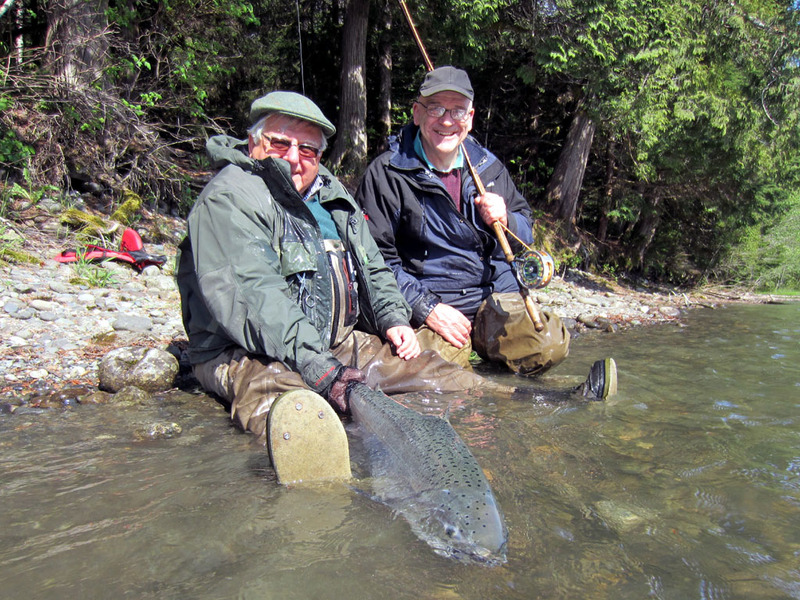 During their three days fishing, brothers Graham and John caught three different species of fish. They landed fish every day, bringing some super Steelhead to the net. 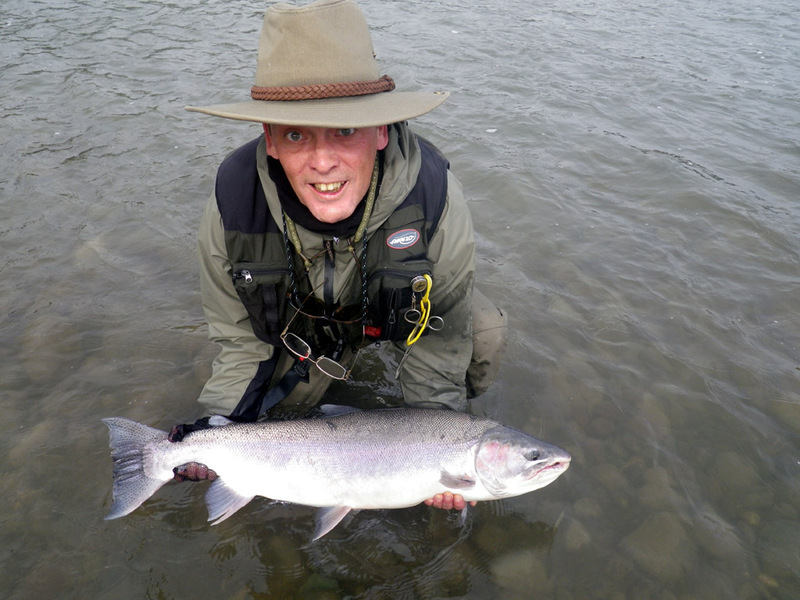 John also landed a nice spring Chinook on his first day ever spey casting. 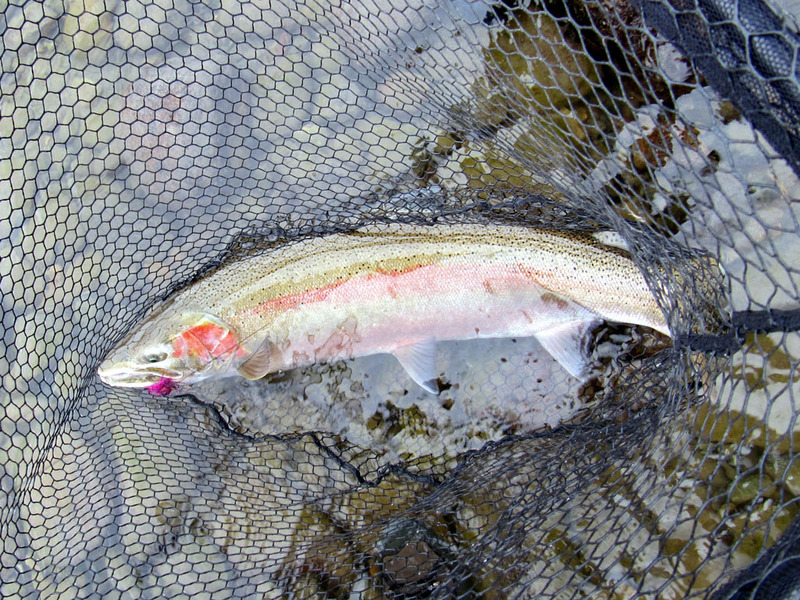 The guys also had some good sized trout. 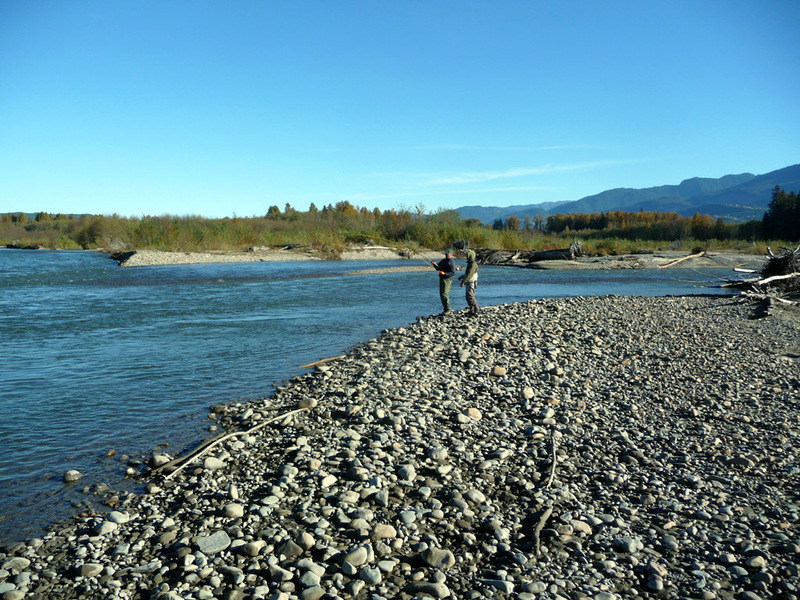 After each day’s fishing the guys relaxed on the deck and enjoyed the evening sunshine, super views and a wee dram. We would like to thank Graham and John for making our last spring trip of the season such an enjoyable one. 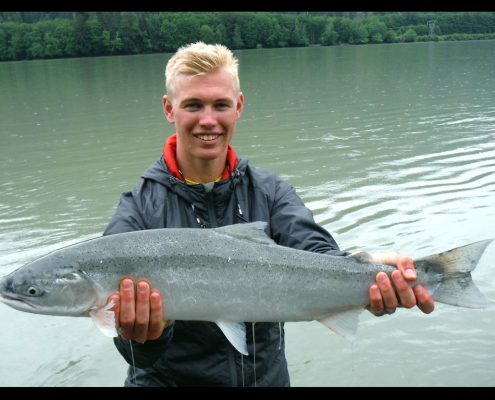 Have a look at our Guest Book at their comments on their trip. 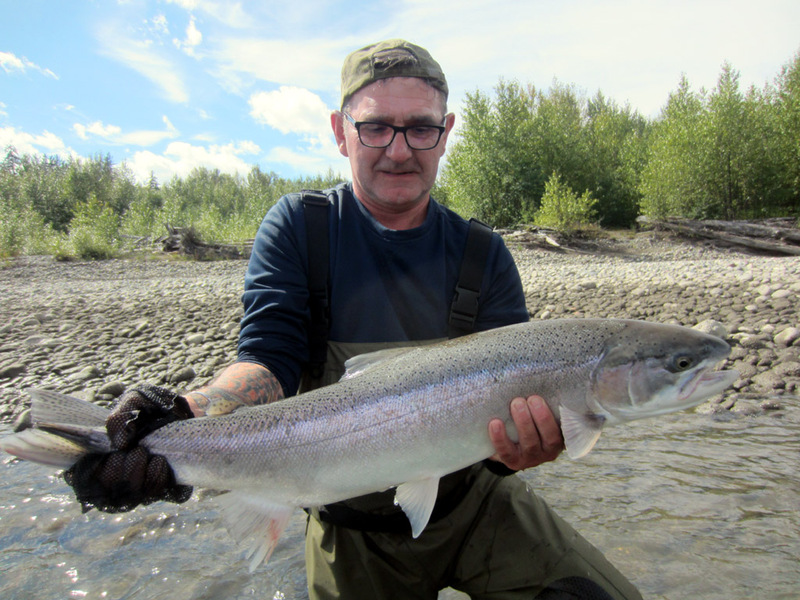 After last week’s sunny weather, this week saw a drop in temperature which made for a couple of cool days of fishing. 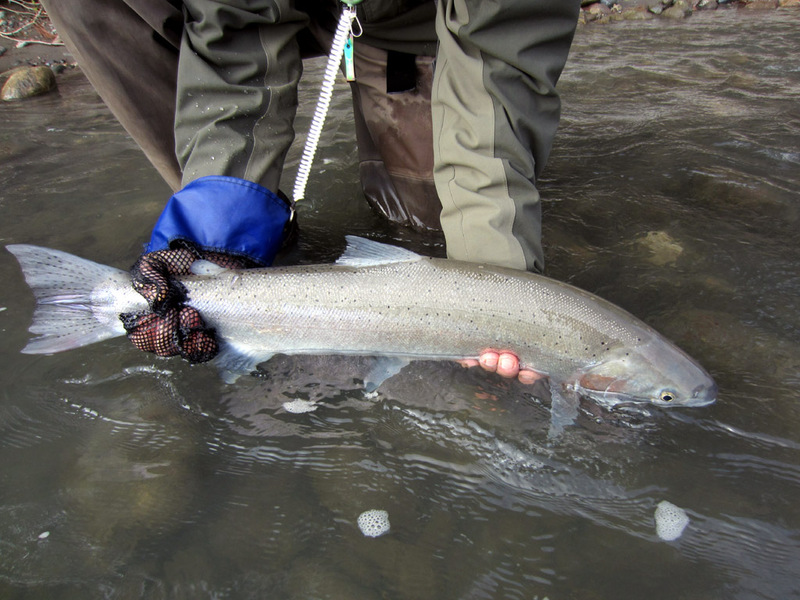 This was followed by some precipitation and warming temperatures which got the rivers rising and the fish moving in. 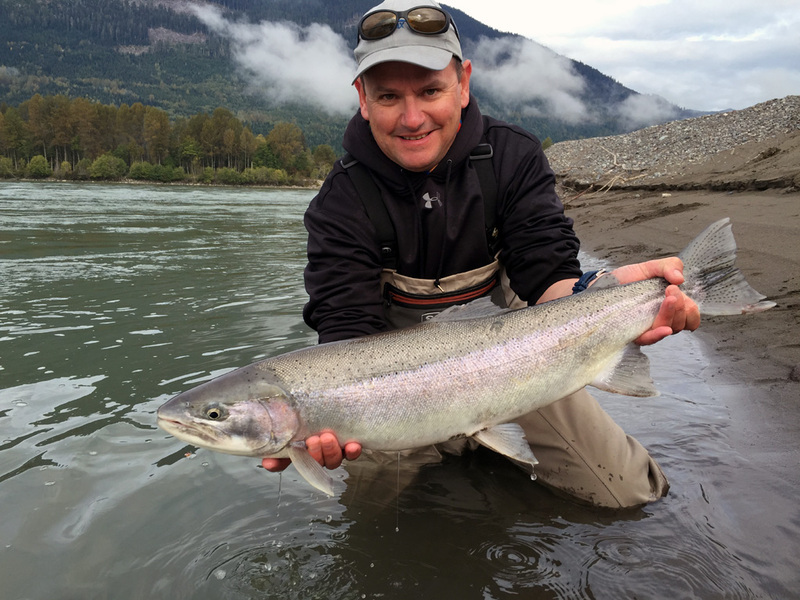 The latter part of the week provided some super Steelhead action for our guests with several hook ups a day with feisty spring Steelhead. 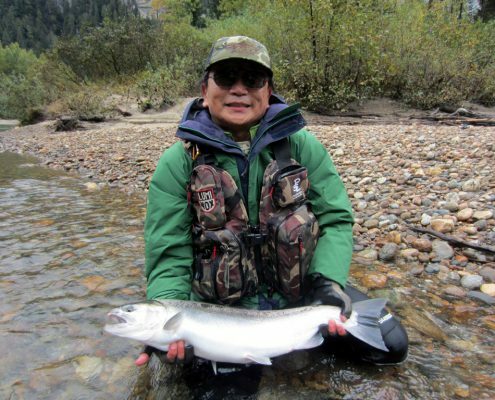 Our guests fished a variety of waters by jet boat and raft, and also enjoyed walking and wading on some smaller spring Steelhead streams. 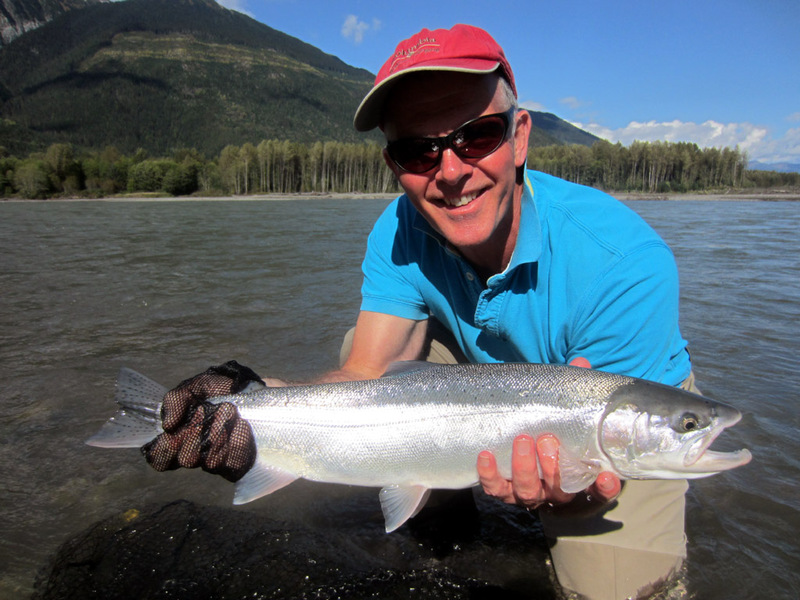 Last week’s fishing saw some nice catches despite bright sunny skies and low water. 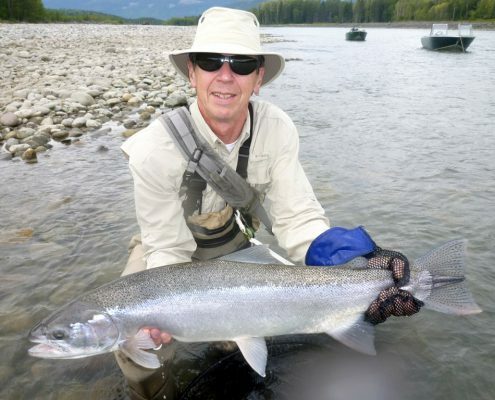 Our fly angler’s efforts paid off with some big fish being landed towards the end of the week. 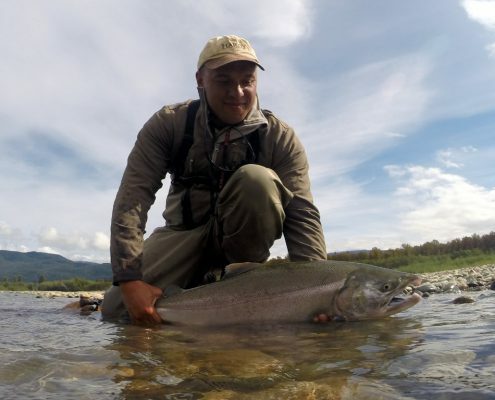 We covered several different rivers which gave our guests a very unique experience. Thank you all for making our first week of the 2015 season so enjoyable and we look forward to fishing together again. 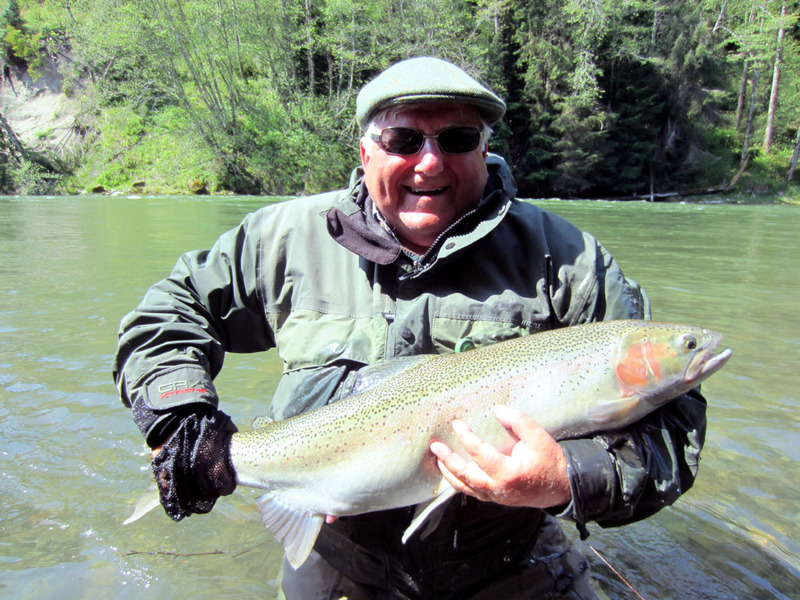 Kalum River Lodge Guides are out fishing. 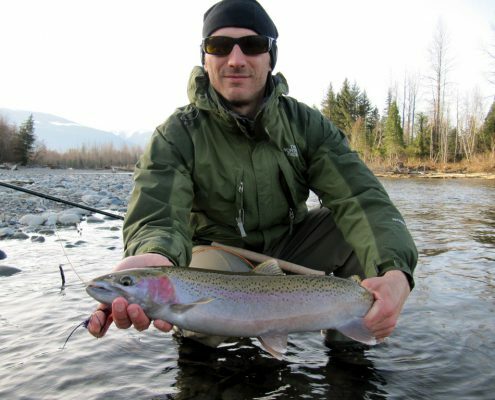 Here are a few photos of some fresh spring Steelhead caught this week. Assistant Guide, Pierrot Bernier, has been out enjoying some excellent Steelhead fishing. 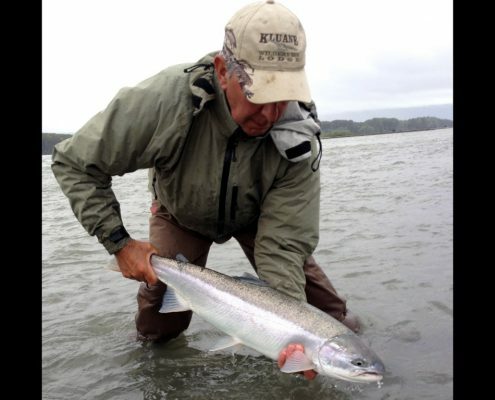 We are looking forward to some great spring fishing when our first guests arrive in the next few weeks. 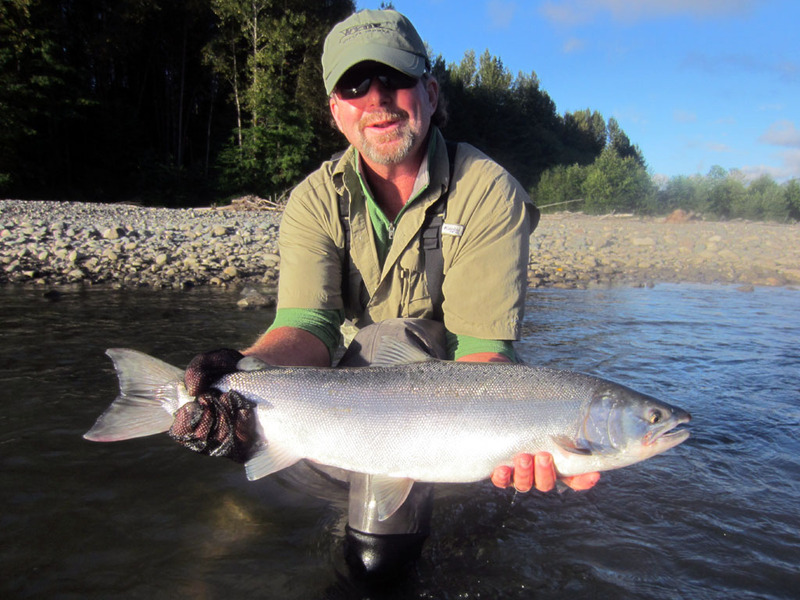 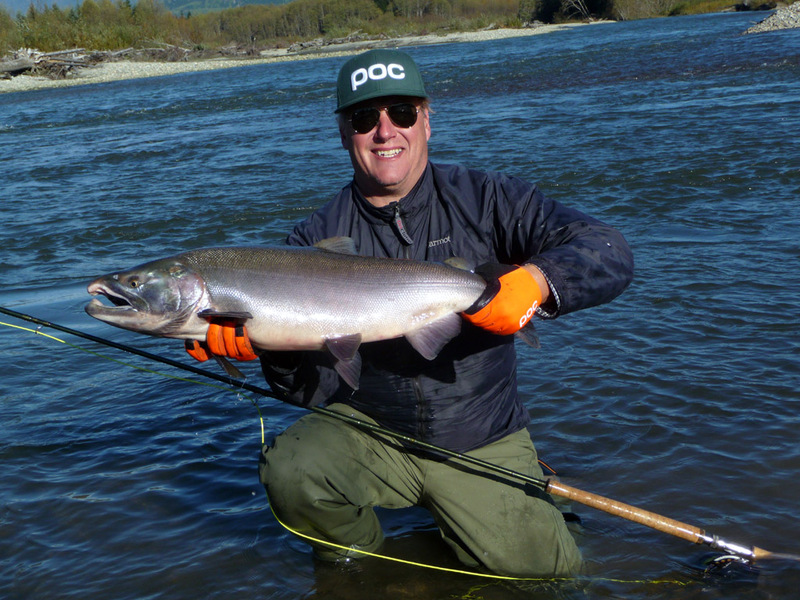 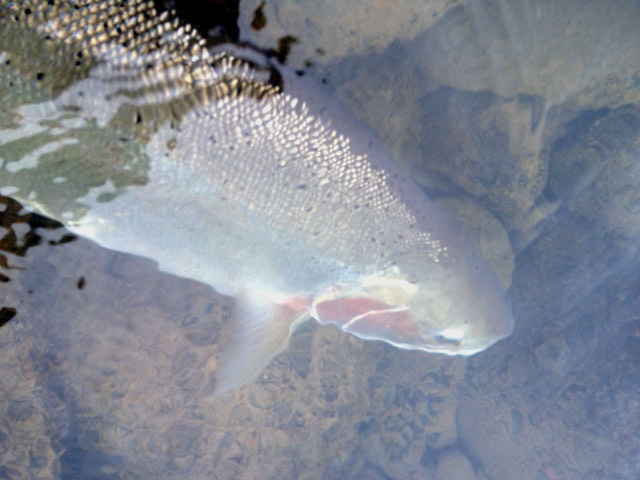 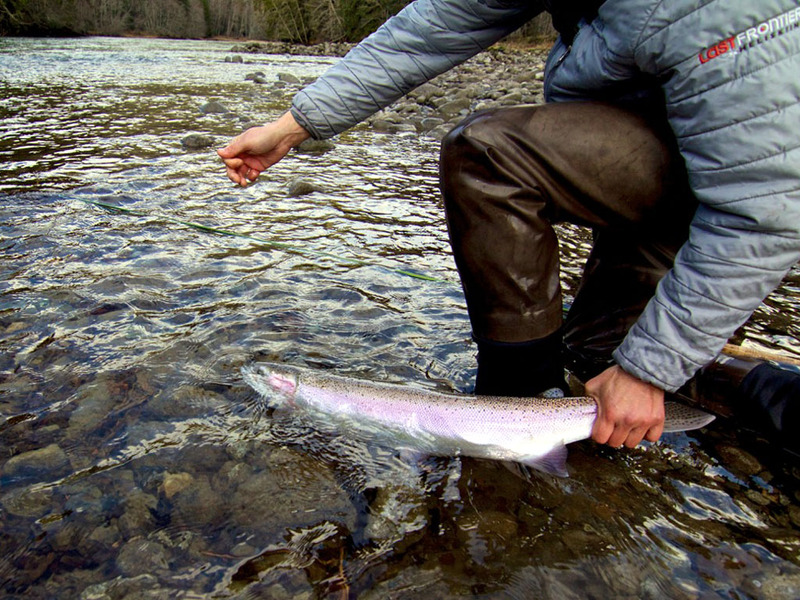 Kalum River Lodge Guides have been out winter Steelheading and are ready for our spring Steelhead season. 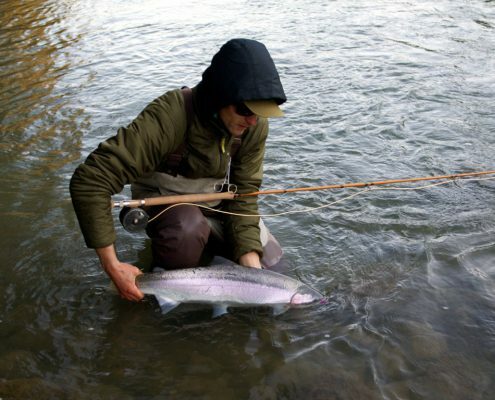 We still have some places available for those anglers who would like to get back on the river after the winter season.